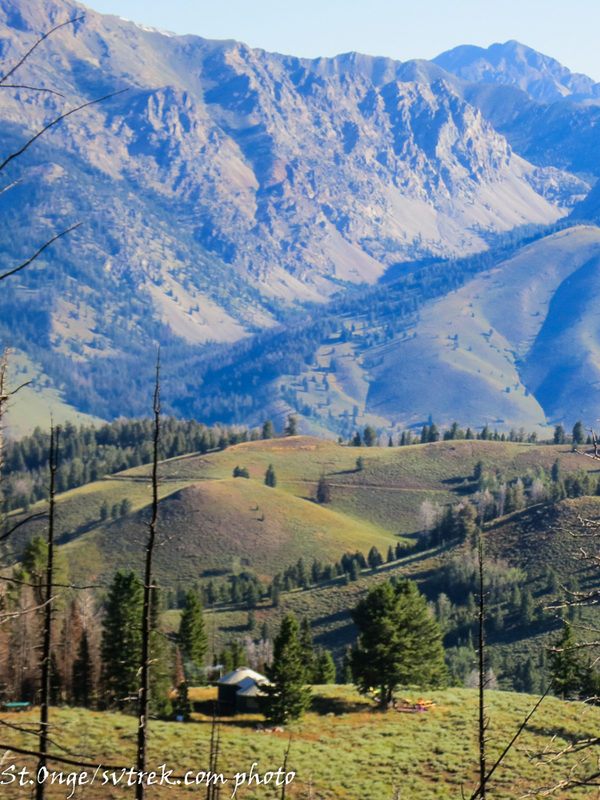 The Men of the North (and one woman) swept down from Montana for another raid into Idaho. 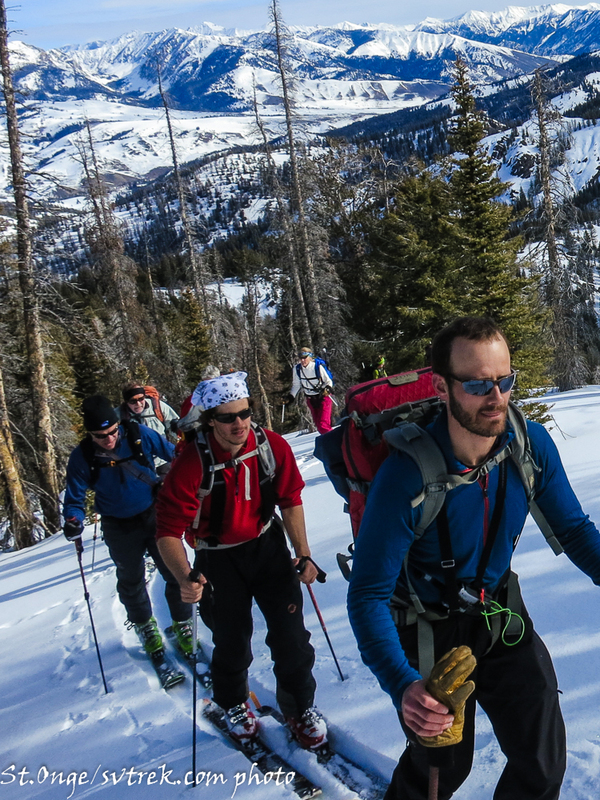 The Smokey Mountains and her hidden treasures of faceted powder and corn were looted by this ruthless crew of barbarians. 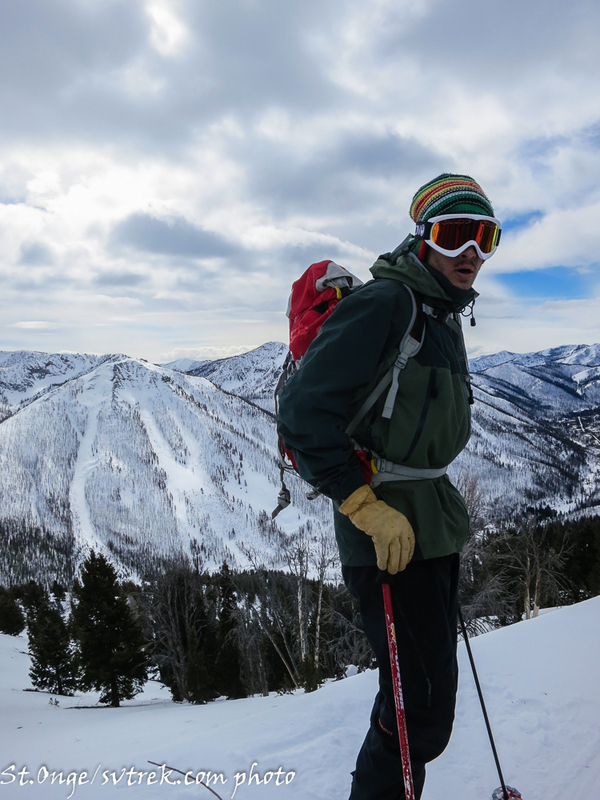 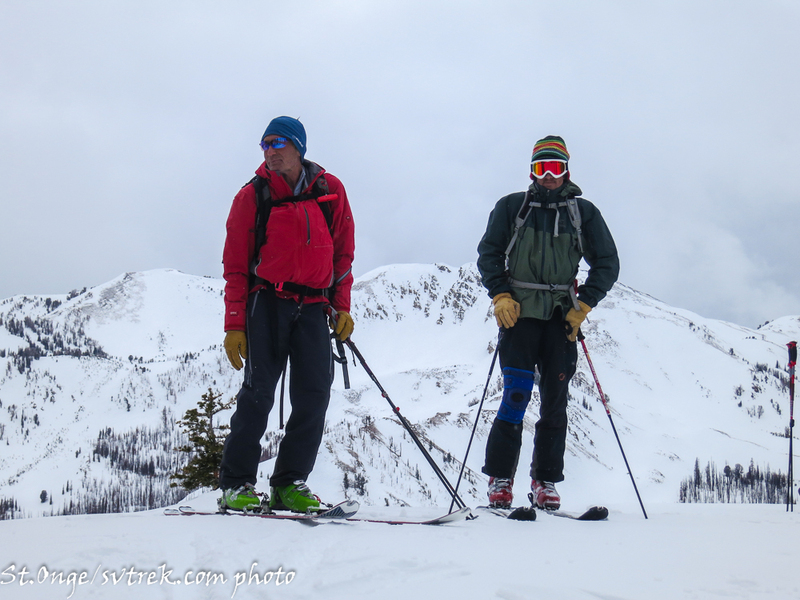 Led by SVT guides: Joe St.Onge, Chris Marshall and Niels Meyer many fun tours and lines (both new and familiar) were explored and skied. 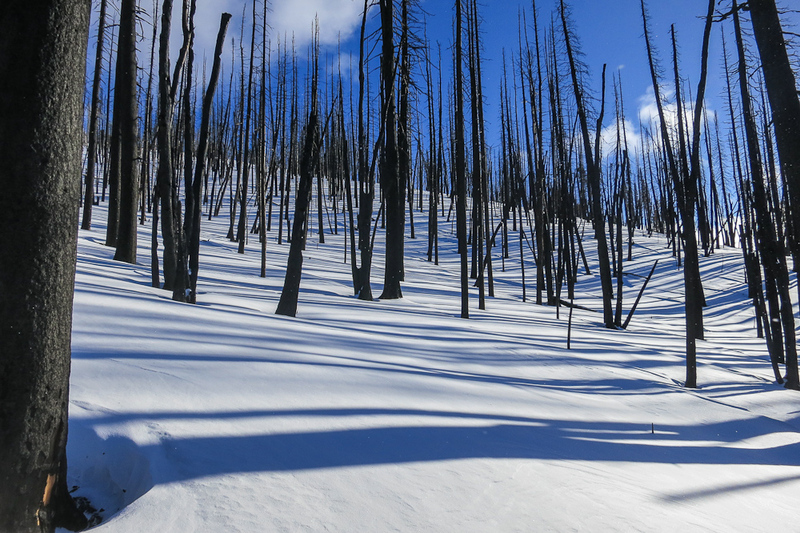 Not to worry, there are still some hidden treasures left out there! 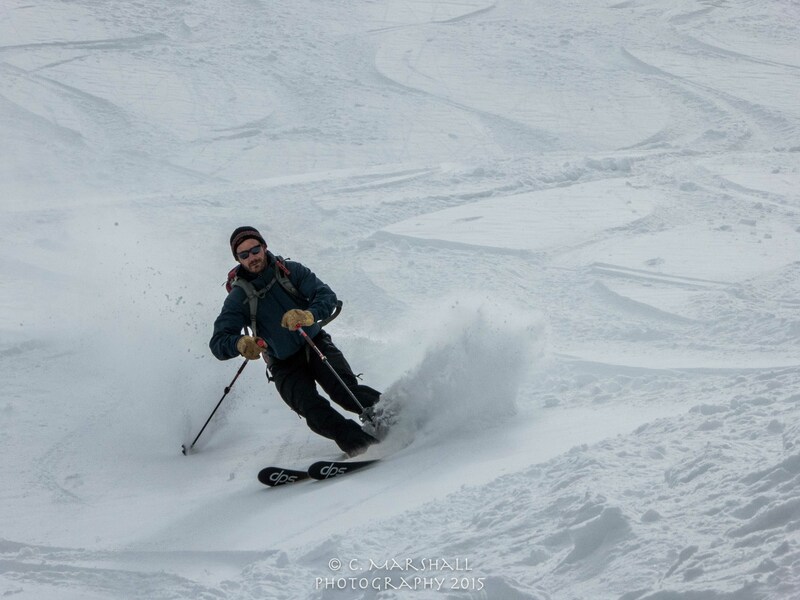 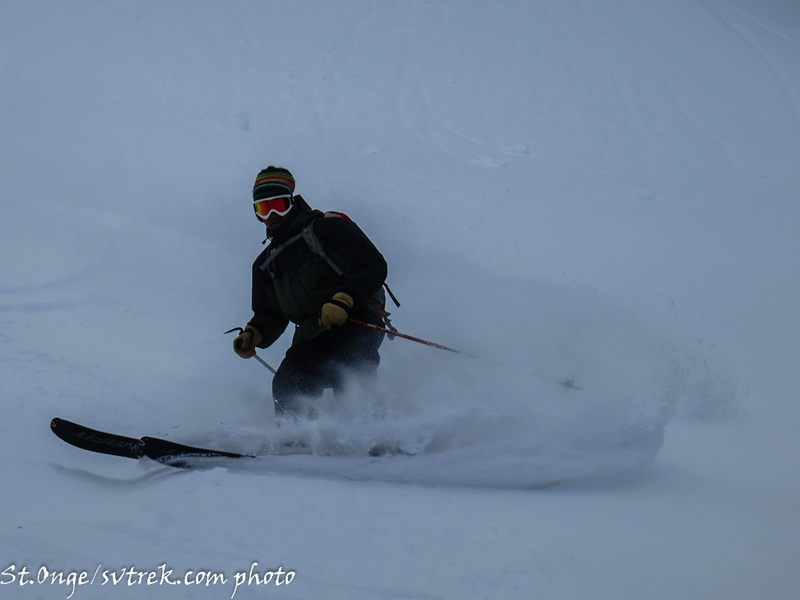 SVT Guide, Joe St.Onge, letting it rip. 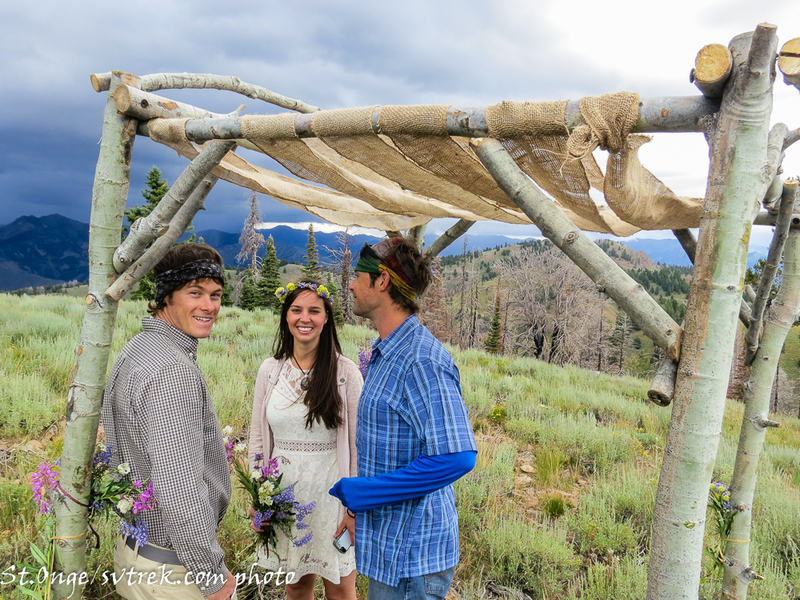 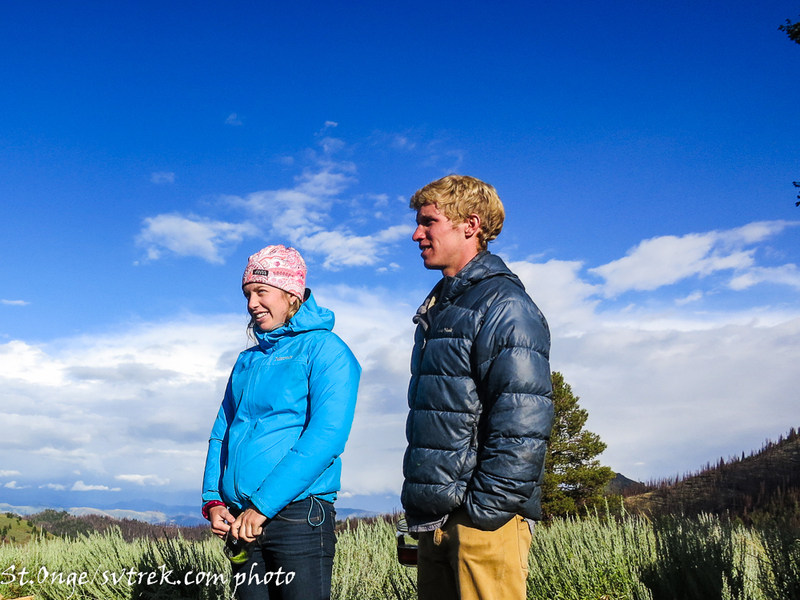 Mark Weir, Jamie Goldman and Aaron Chase: Stoked! 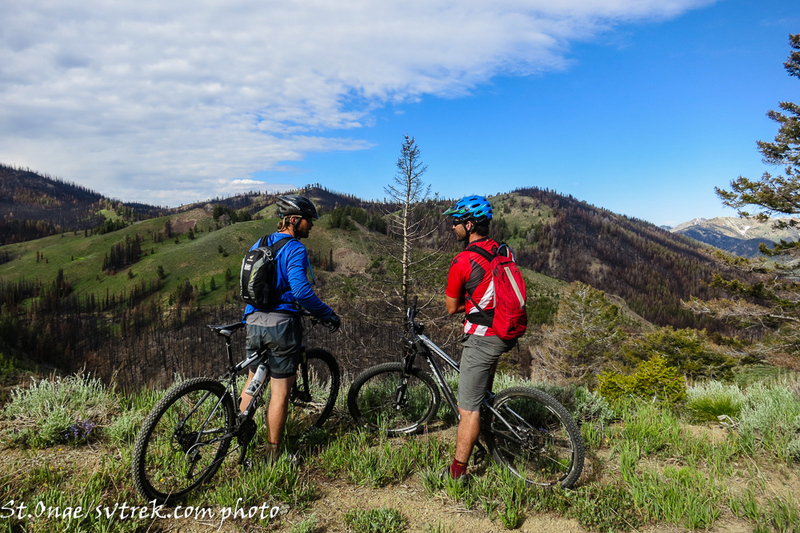 “Are there rattle snakes here?” asked Jamie Goldman, a pro rider from Oregon I was charged with guiding. 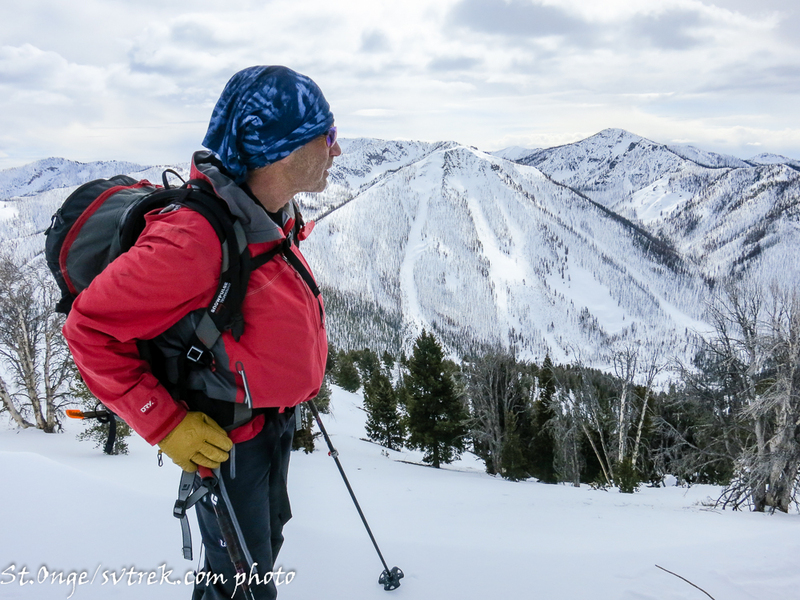 I was pointing toward Lambs Gulch, a local favorite South Valley trail, where the year before an intrepid hiker photographed a rattle snake hibernacula. 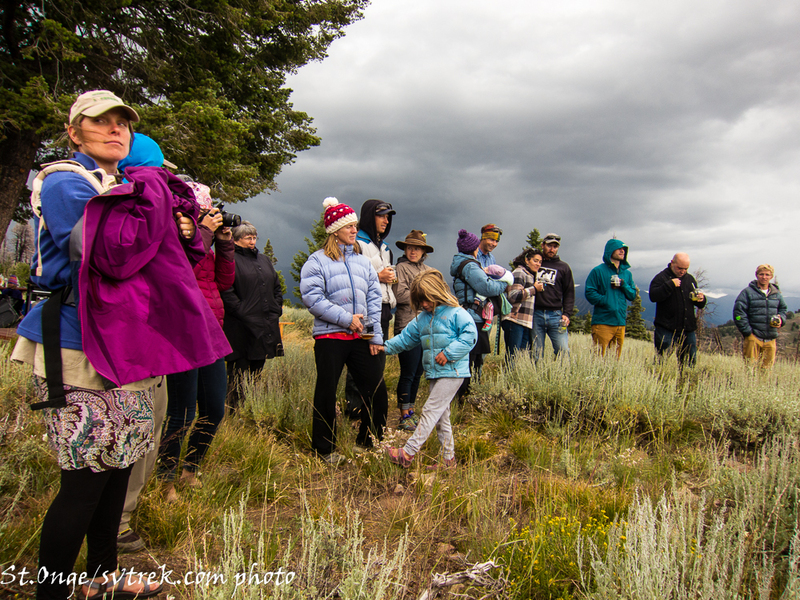 For those that don’t know, a hibernacula is basically a ball of writhing rattle snakes that congregate together, sometimes by the hundreds, to stay warm during the long winter months. 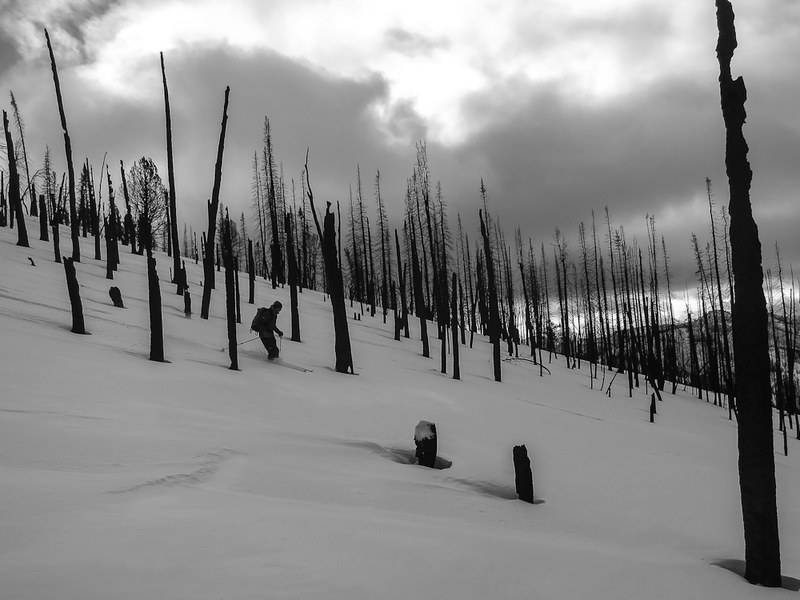 The photograph made the local paper and led to horrific visions for those that frequent these trails. 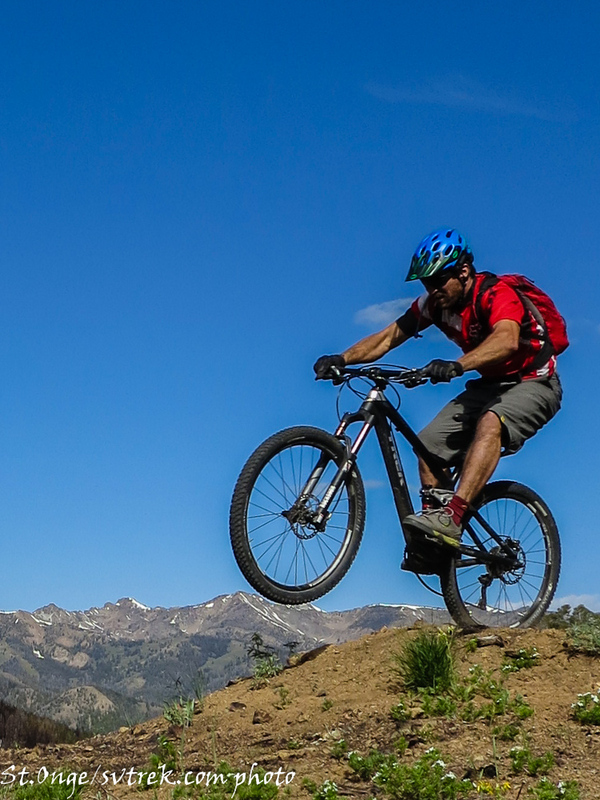 It wasn’t uncommon to see a normally tough mountain guy jump and shriek with visions of the hibernacula when a large cricket fluttered by. 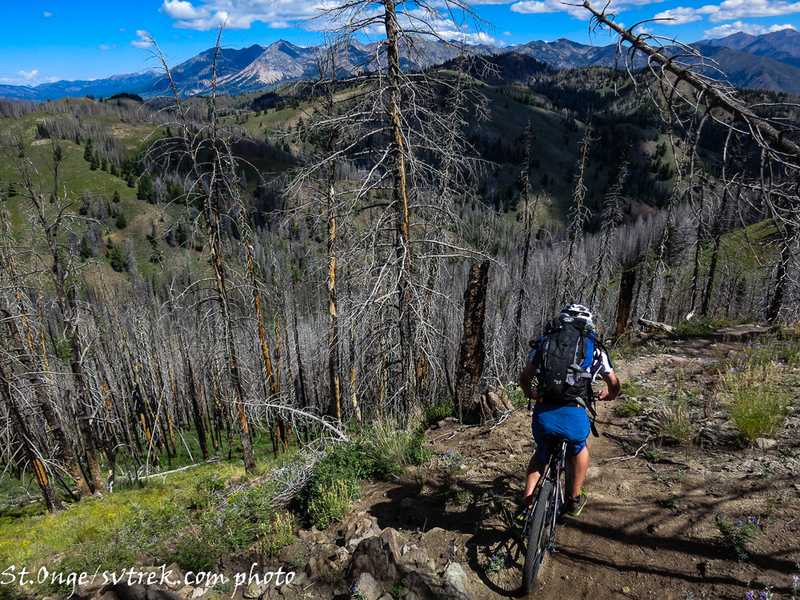 All that silly fear was warranted, as I had once ridden over the middle of a basking rattle snake on that very trail, both the snake and I left shaking. 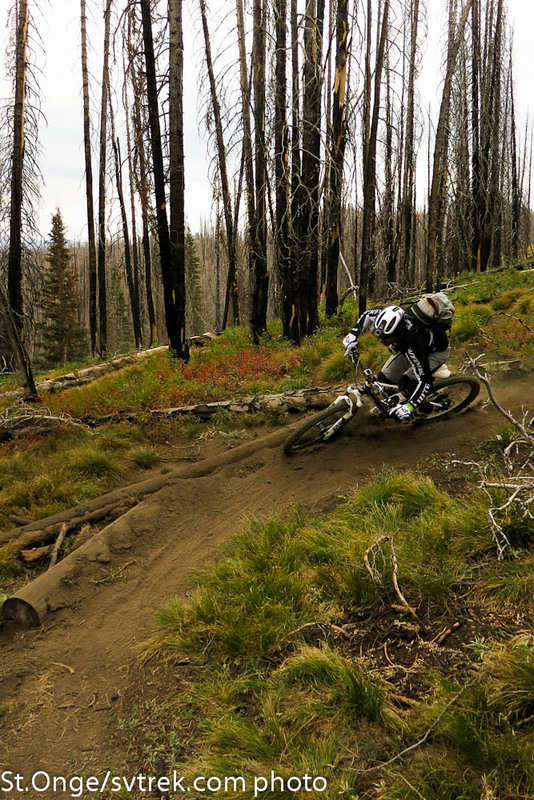 But not over here on the new school flow trails recently built to maximize speed and stoke for local riders. 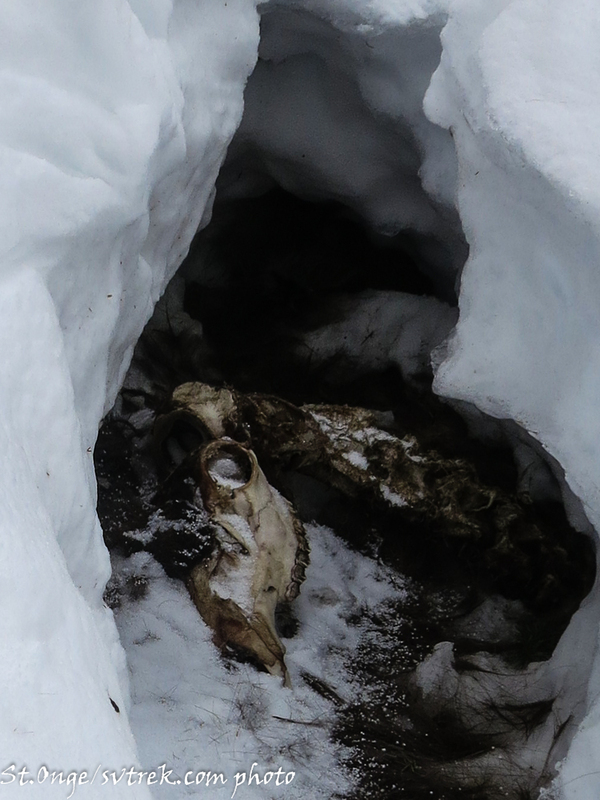 While less than a mile away, I had never even seen a snake here nor heard any of the stories that were common on Lambs. 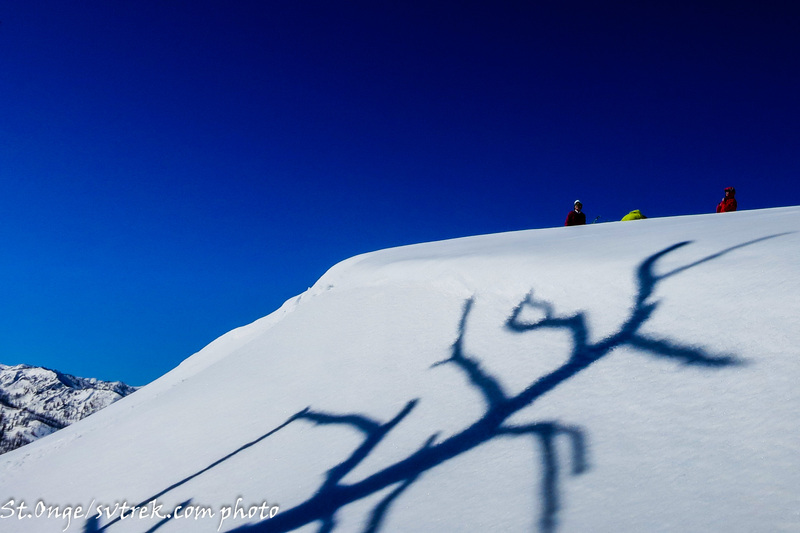 Sometimes we fool ourselves to avoid fear. 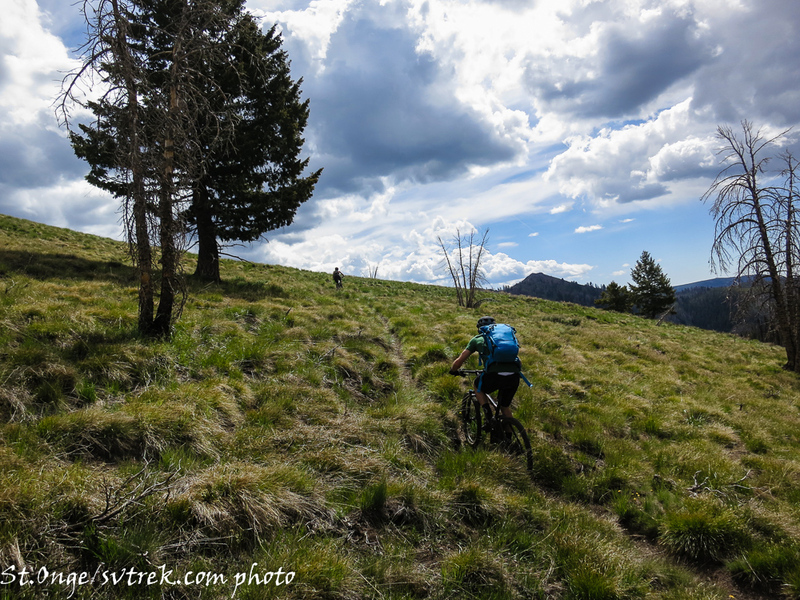 It was about 2 minutes later, flying down the whoops, banks and rolls of the Centerline trail, when the telltale rattle caused me to veer off into the scrub. 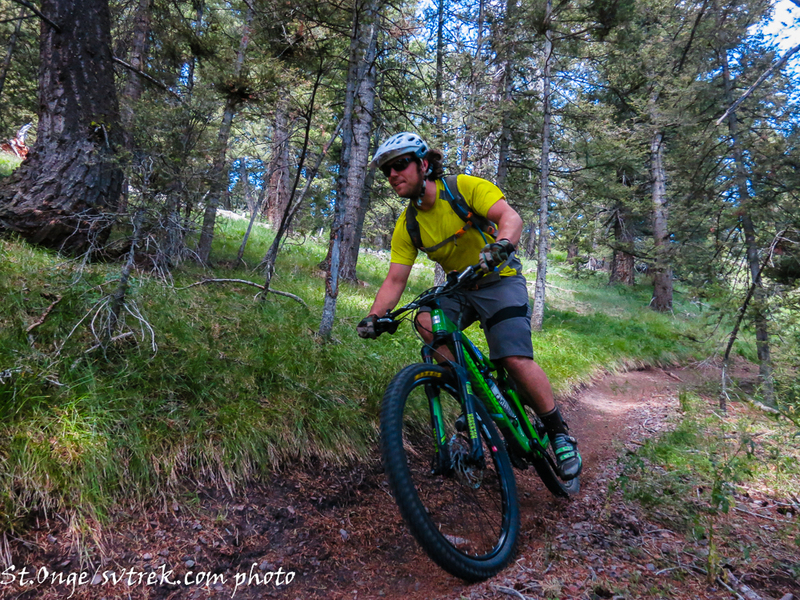 My bike went flying and I did my best to windmill my legs and arms to stay upright and avoid the snake I had just ridden over. 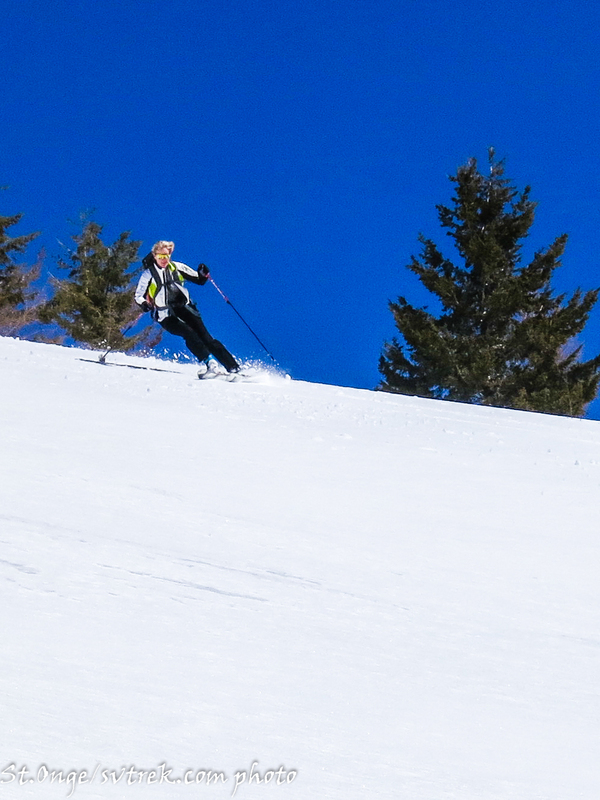 Jamie, at full speed, just bunny hopped over the fanged reptile with grace and poise. 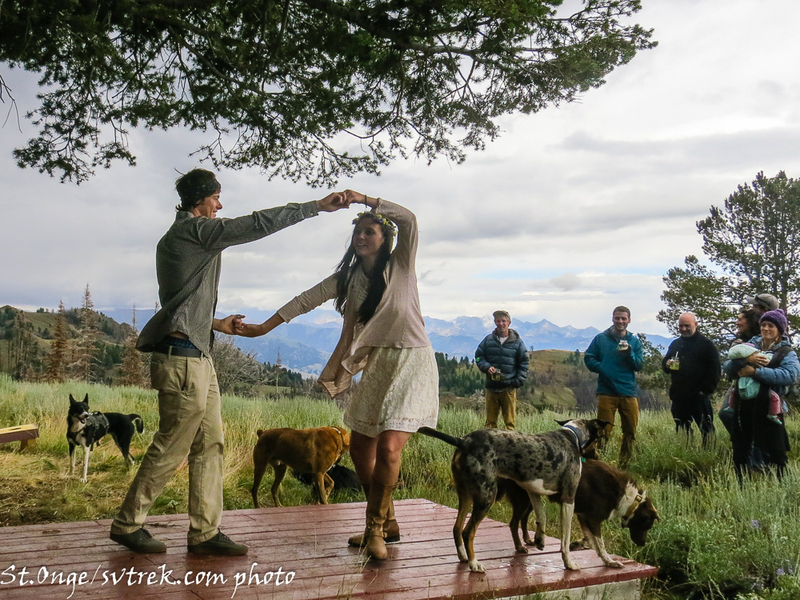 It looked like he had rehearsed this move a hundred times. 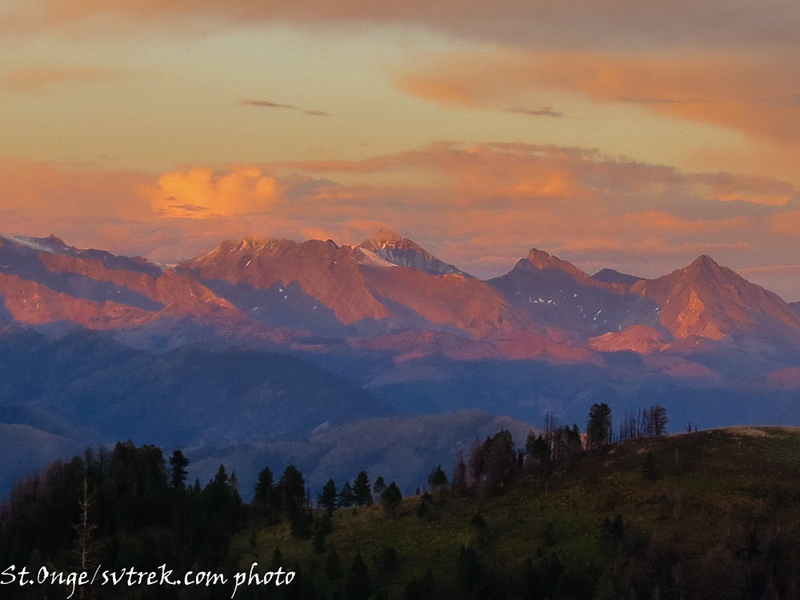 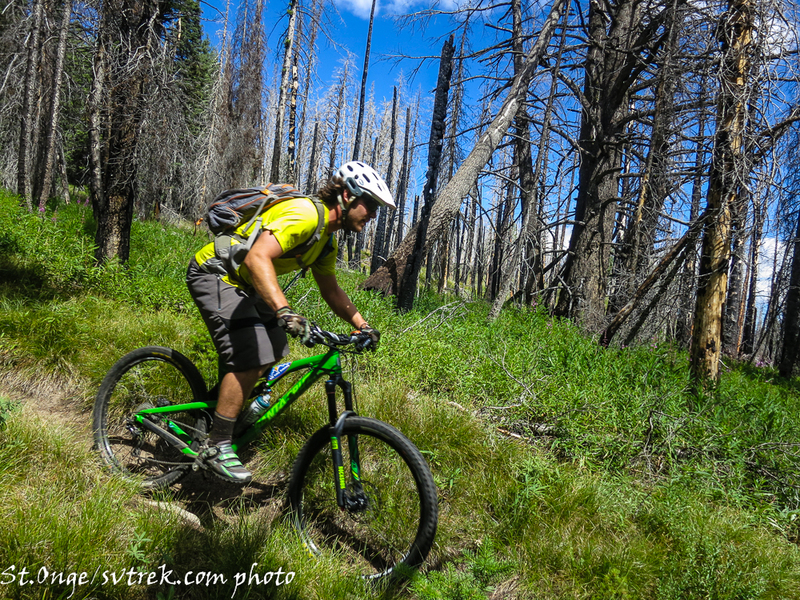 This was the first day of a ten day mountain bike trip I was guiding. 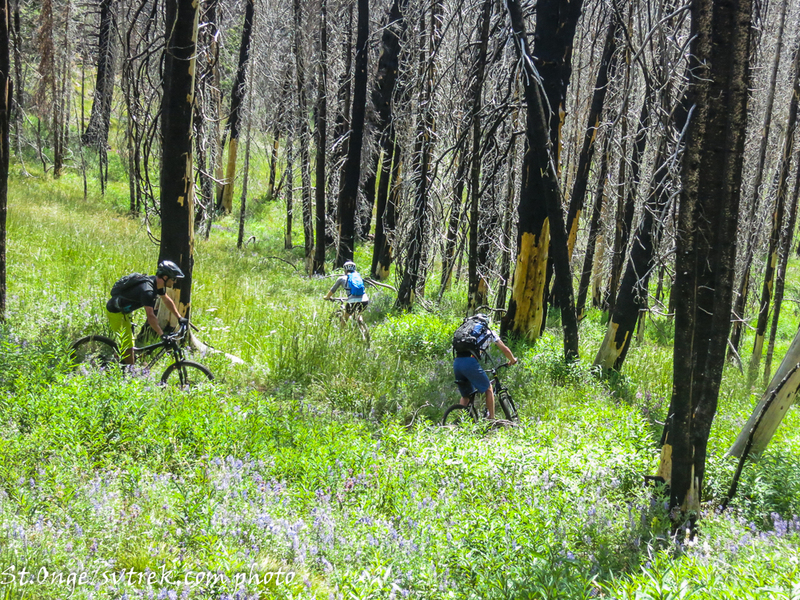 This wasn’t our normal bike guiding. 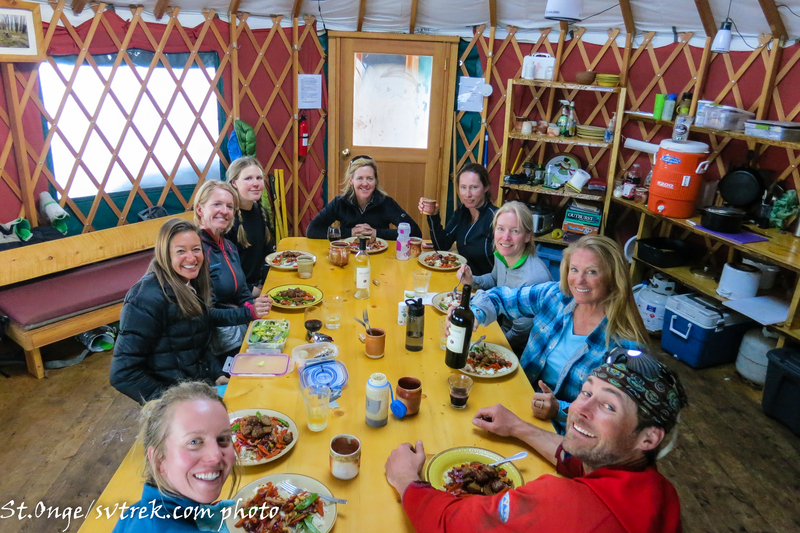 We had three top pros, 2 camera men, a fully outfitted shuttle vehicle, a well-stocked yurt, big plans and lots of ice cold beer. 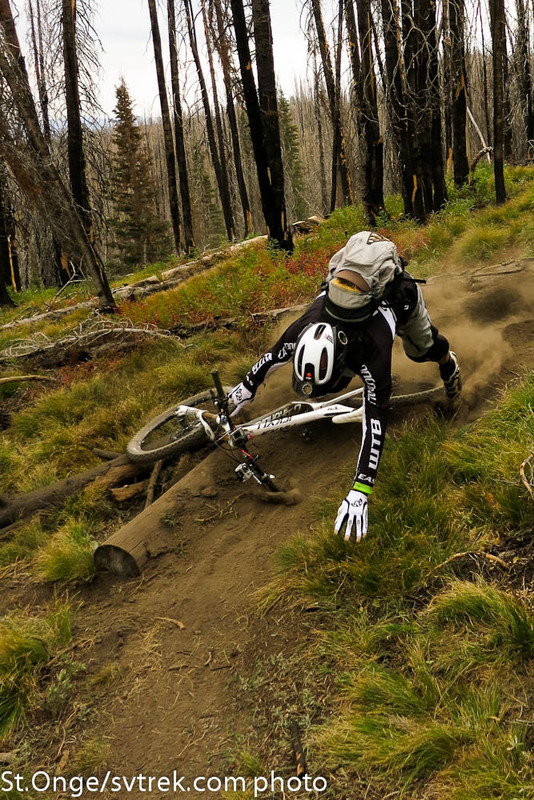 It was the cameras and the pros that made the difference. 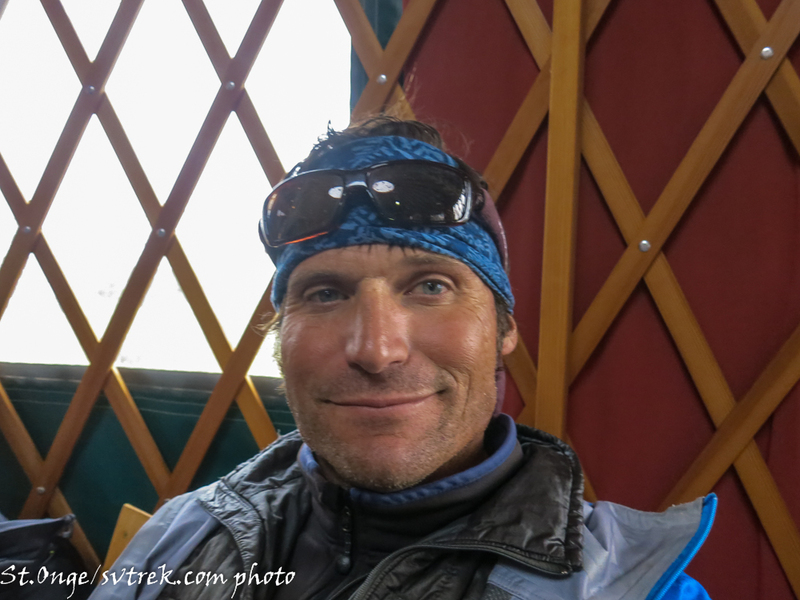 I have been a mountain guide now for 20 years. 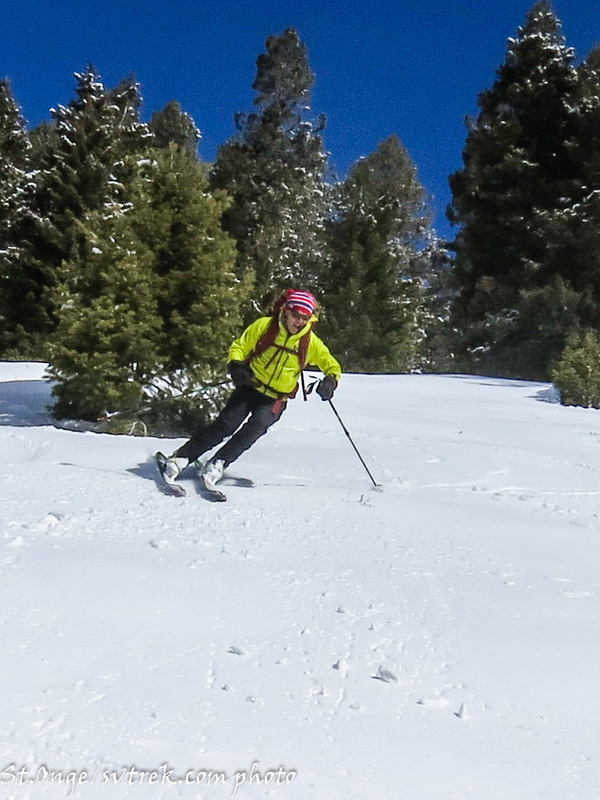 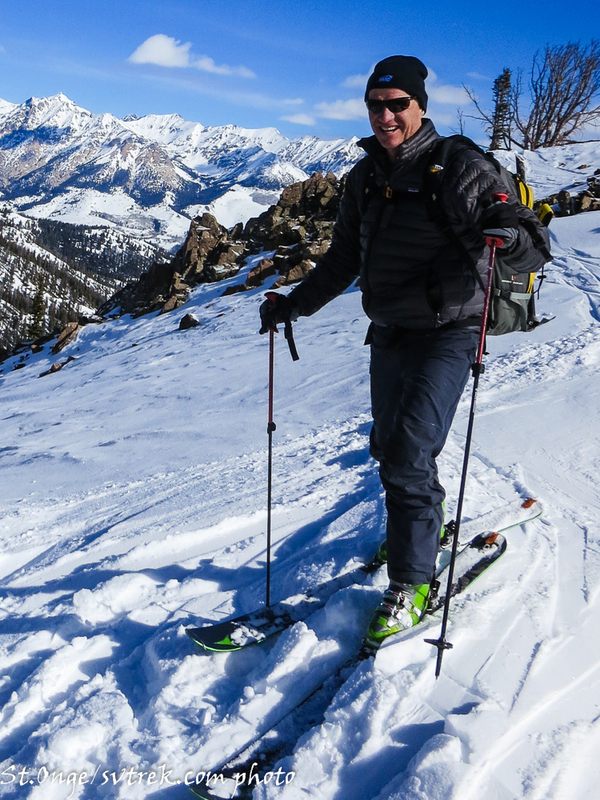 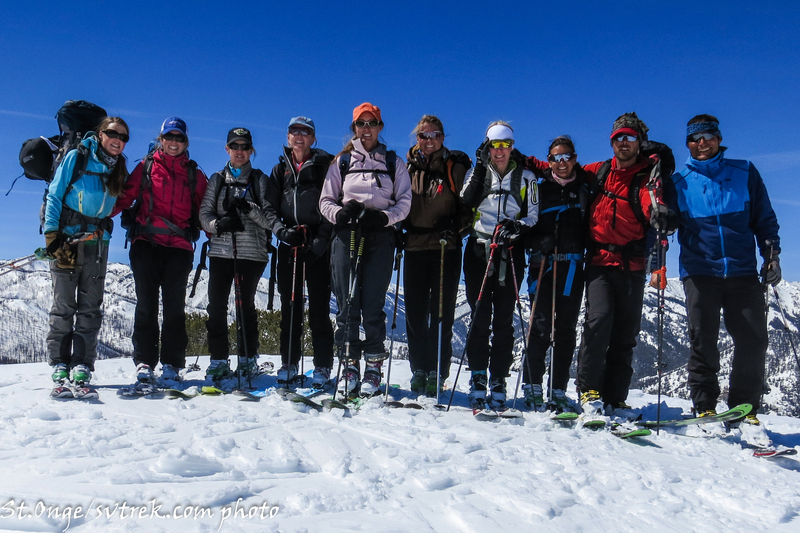 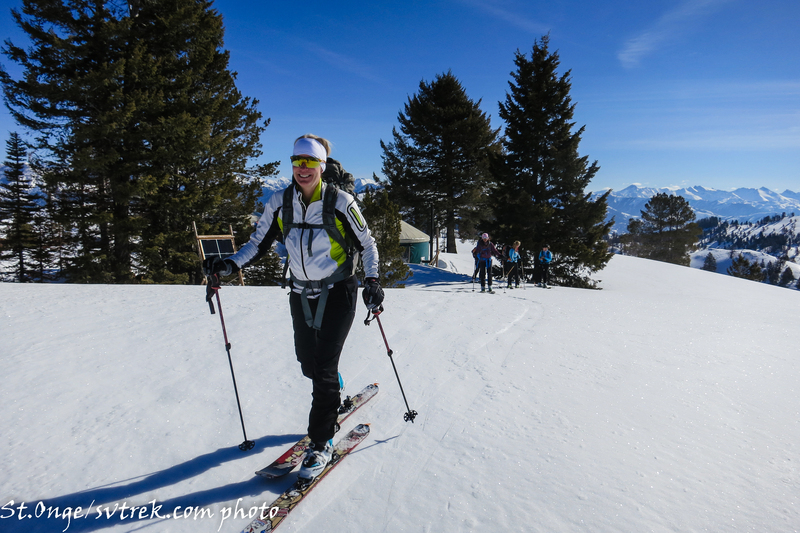 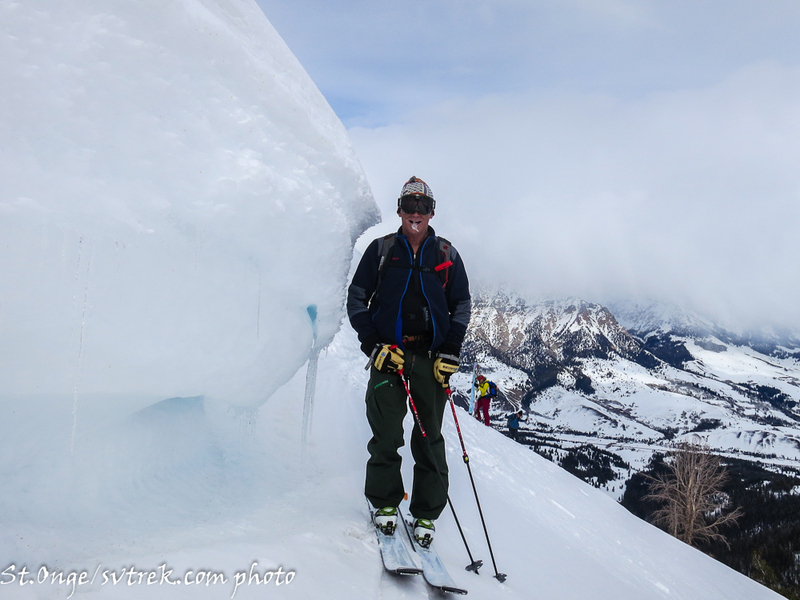 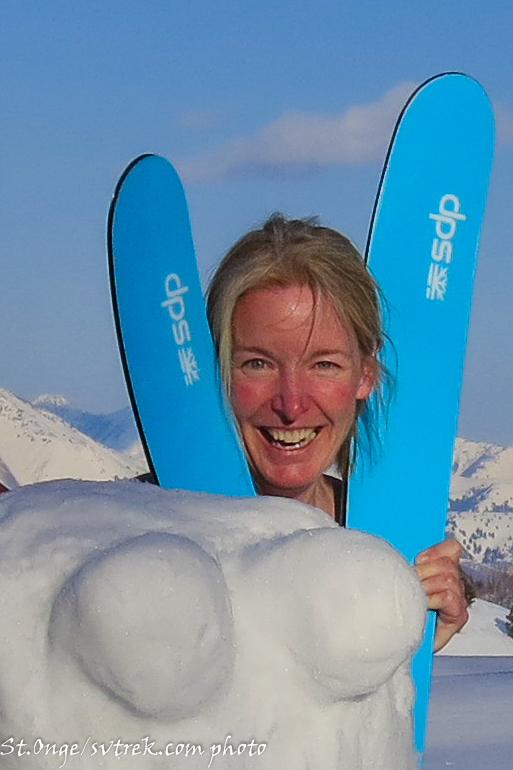 My focus has been on climbing and descending mountains, but typically on skis. 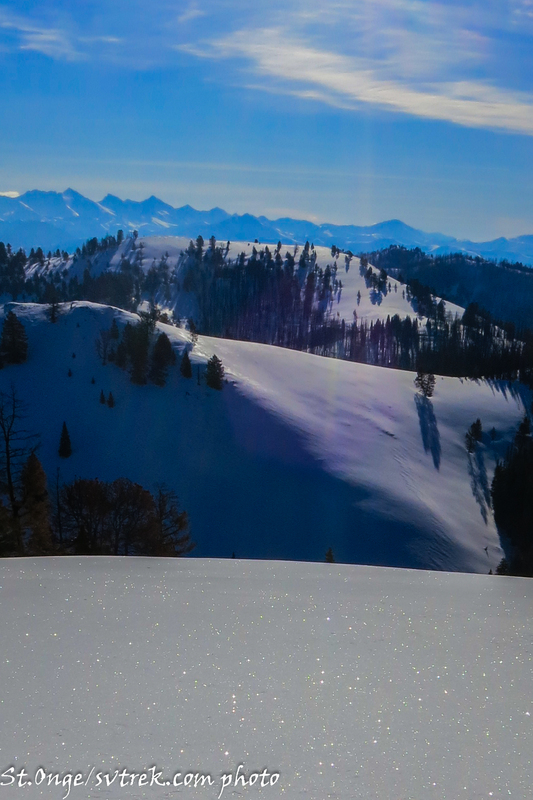 For much of my adult life I have been too focused on these snowy environs to spend much time on bikes. 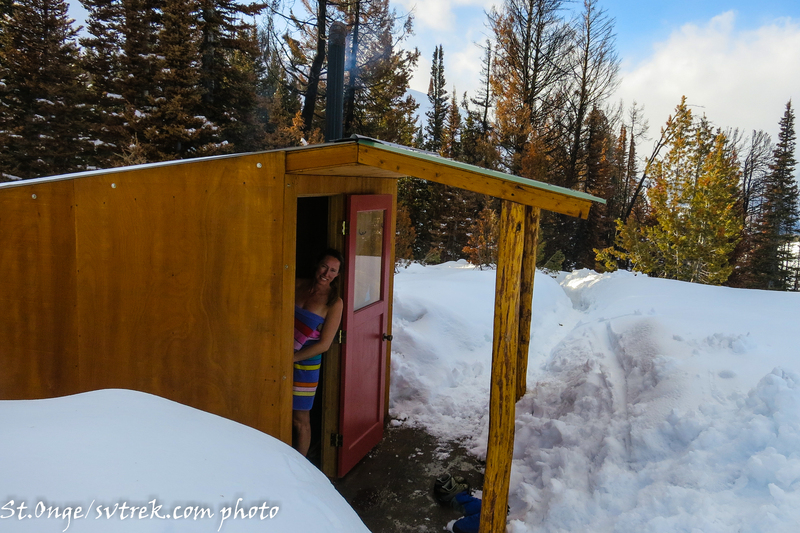 Typically I would migrate to different hemispheres and higher altitudes/latitudes as soon as the snow began to melt. 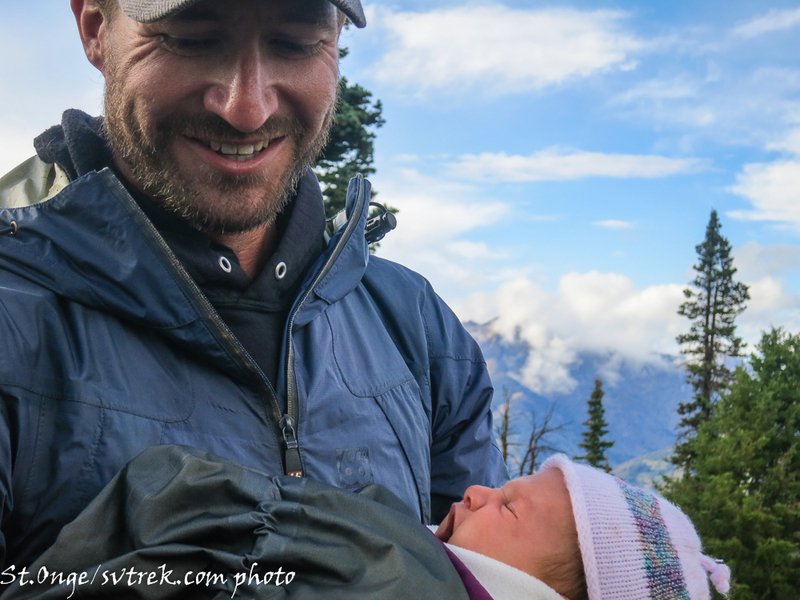 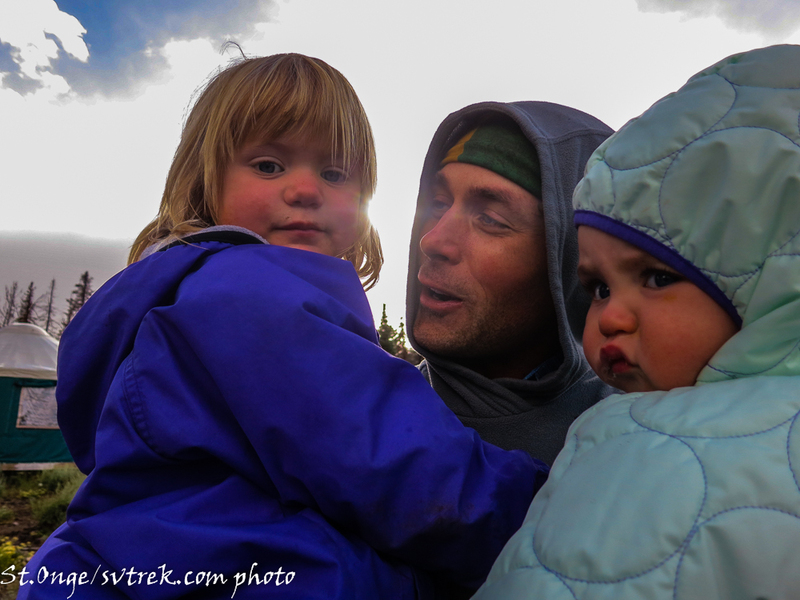 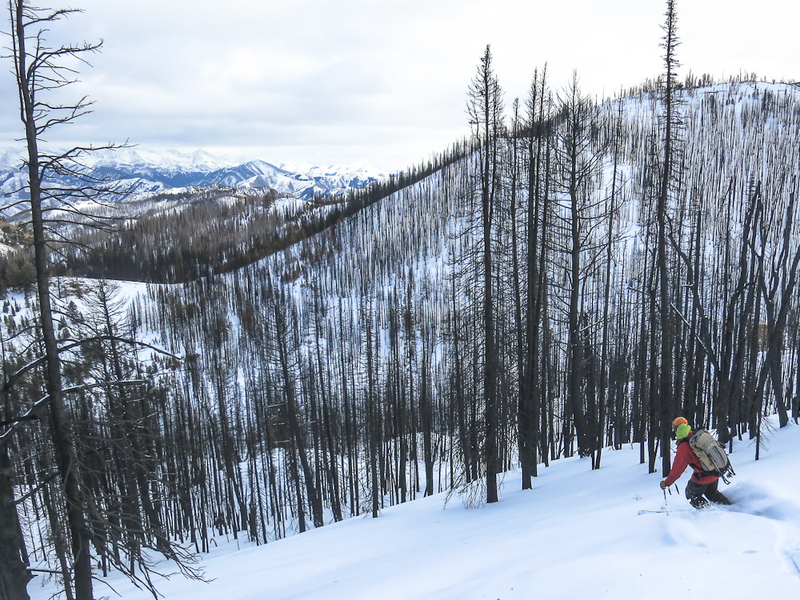 That all changed when my wife and I moved to Hailey to work as backcountry ski guides 13 years ago. 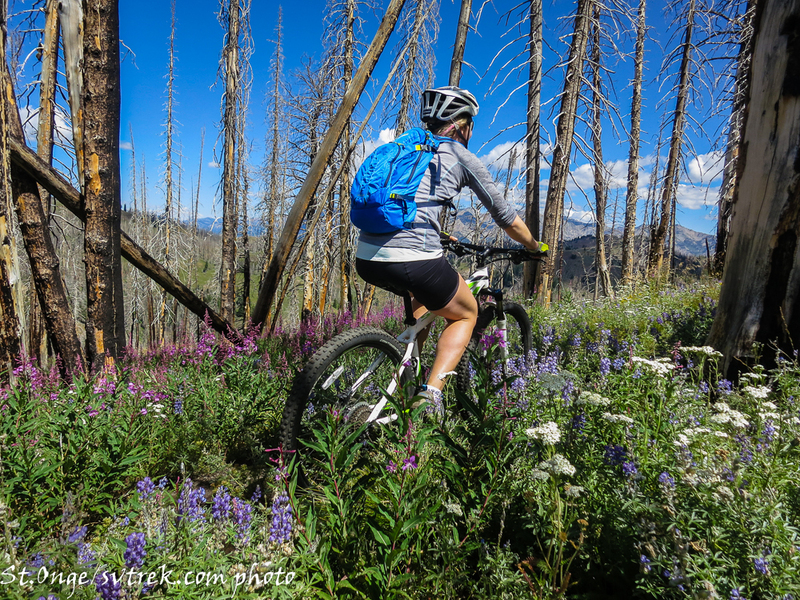 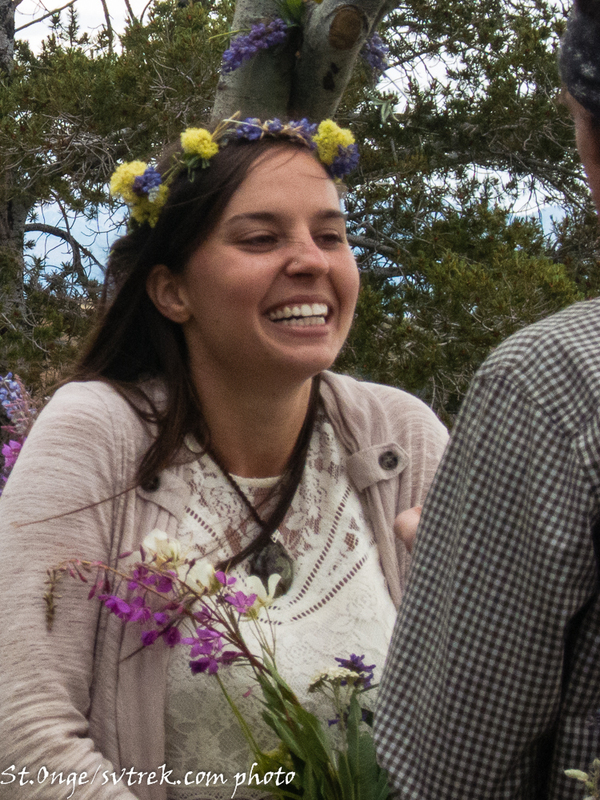 The summers were so nice: flowers, clear running streams, lots of sunshine and miles upon miles of epic single track leading throughout the rugged mountains of Central Idaho. 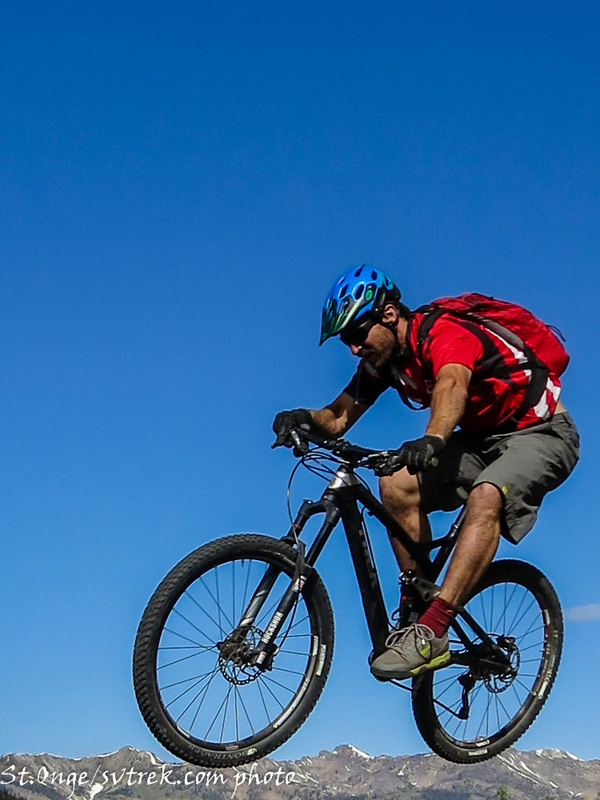 The biking I had done before was not the same. 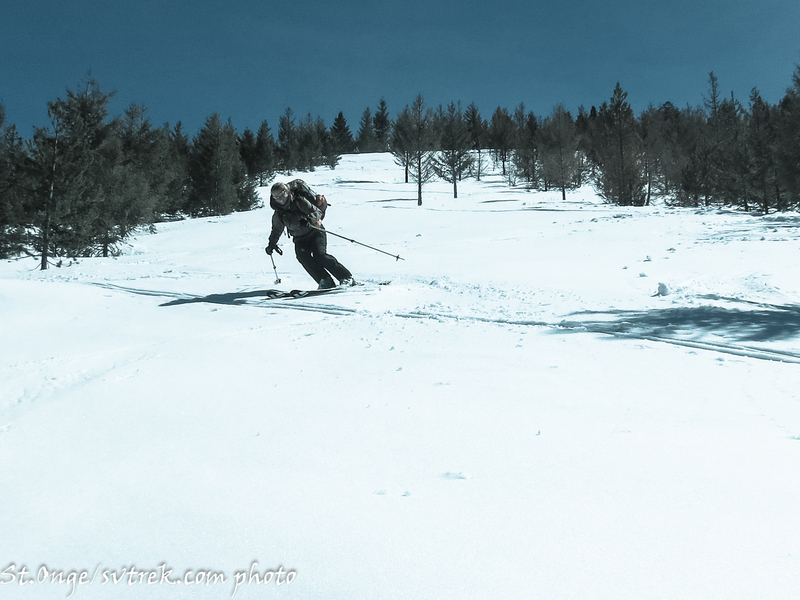 Mostly scrappy affairs involving skidding down too steep trails and doing my best to avoid getting injured. 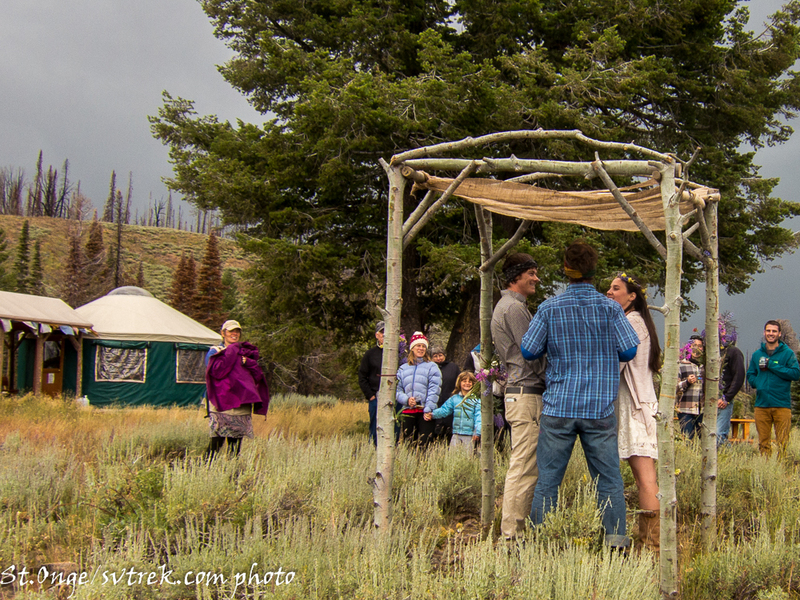 But here in Idaho it was different. 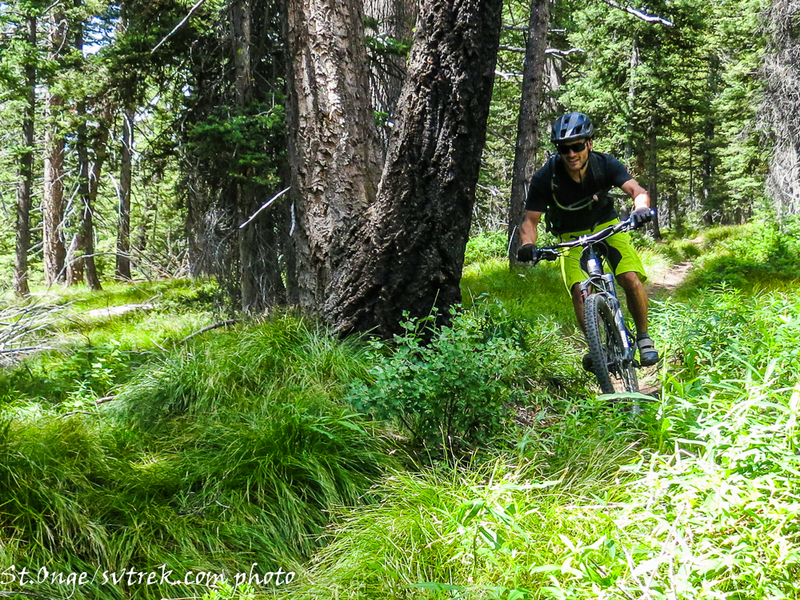 The trails were buff. 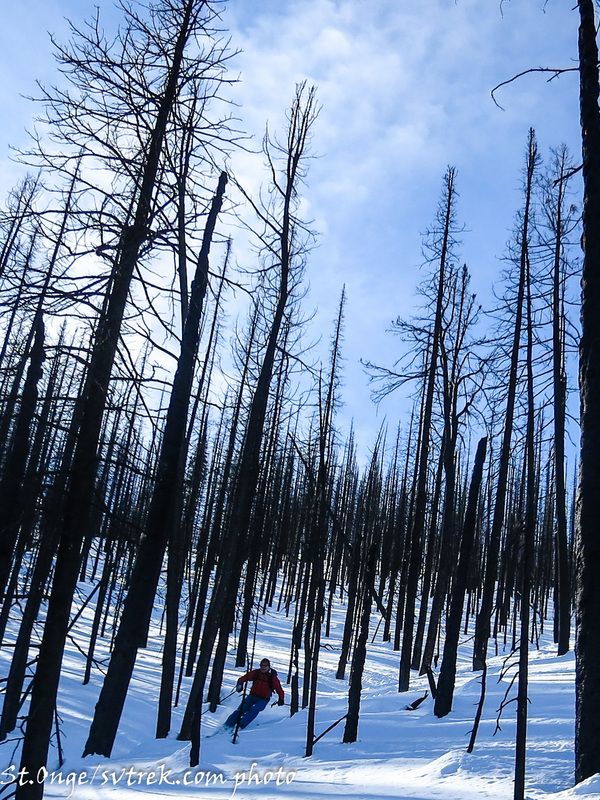 They climbed, curved and descended through enchanted landscapes that went on as far as you could. 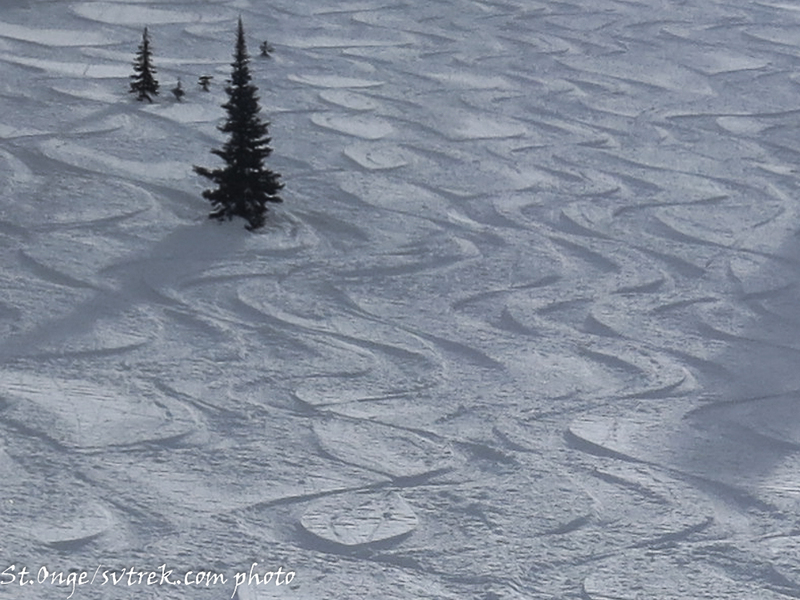 I was mesmerized by the flow and the potential. 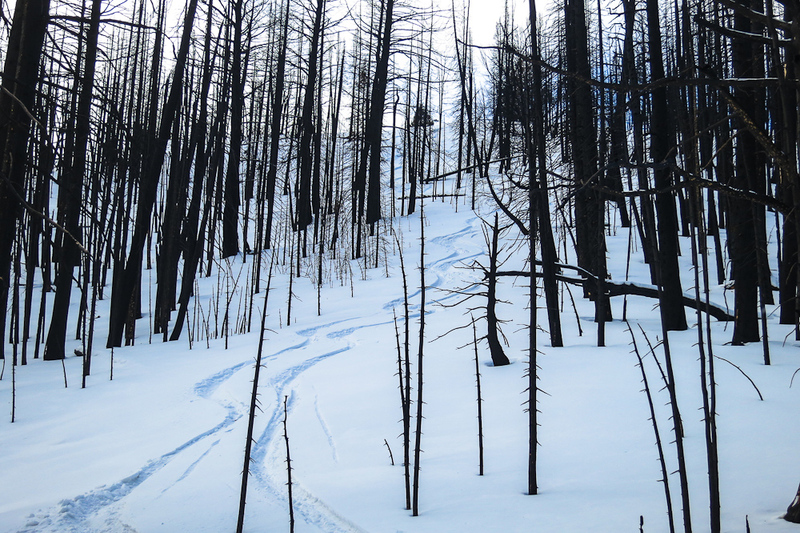 Suddenly, I became aware of the similarities between backcountry skiing and mountain biking and the fire they both stoked. 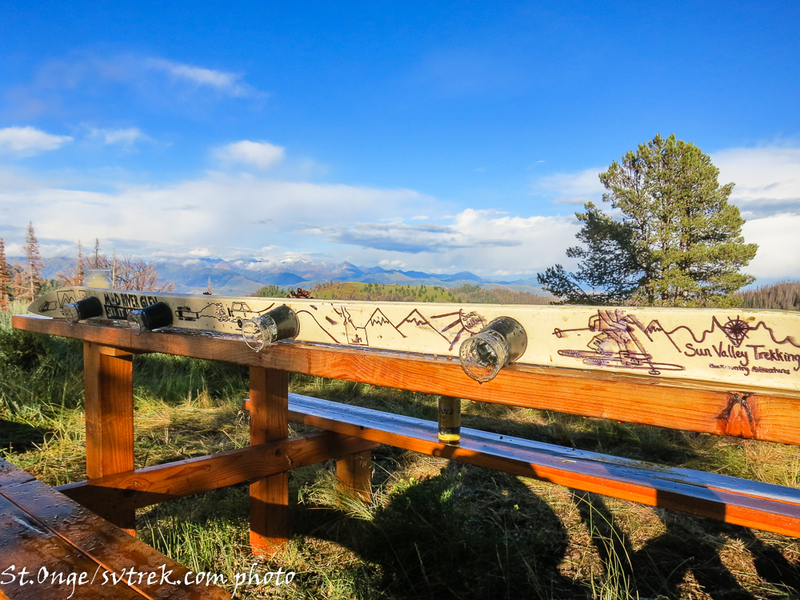 I actually began to look forward to the non-snow months. 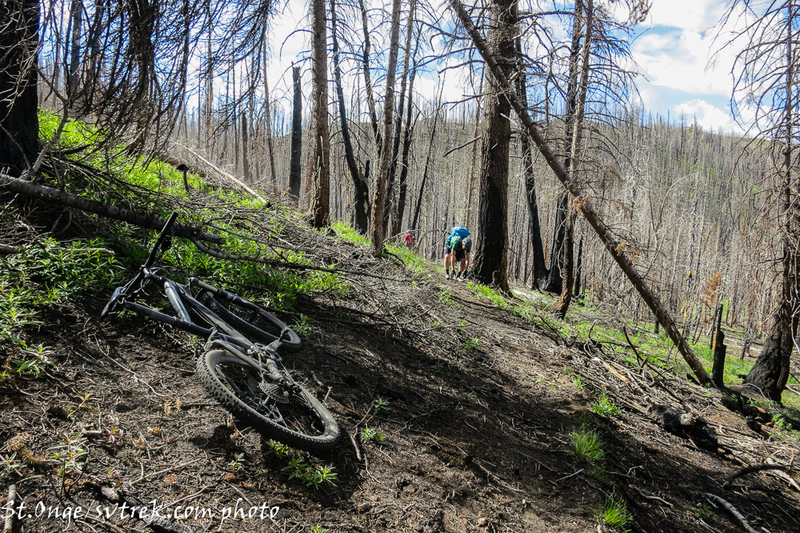 Now here I was, an unlikely bike guide. 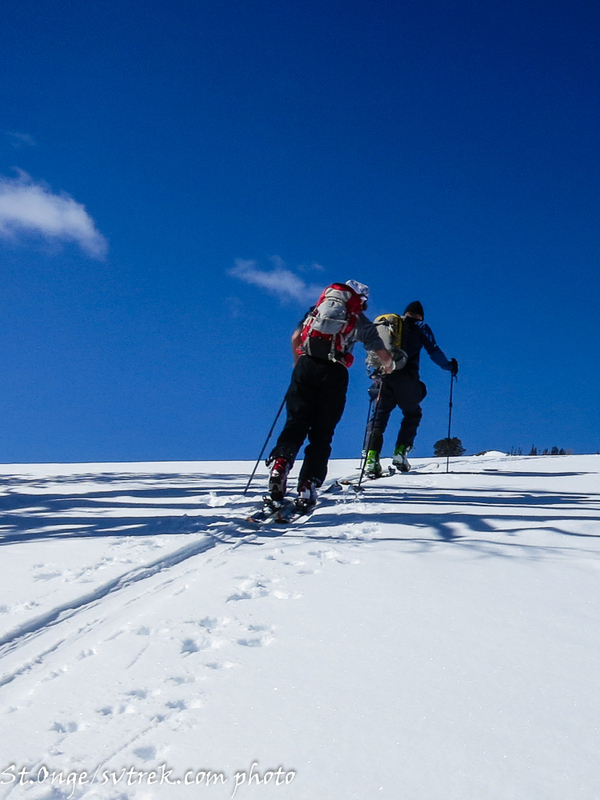 With all the mountain guiding I have done, I generally feel pretty comfortable taking people into harsh and consequential environments for fun. 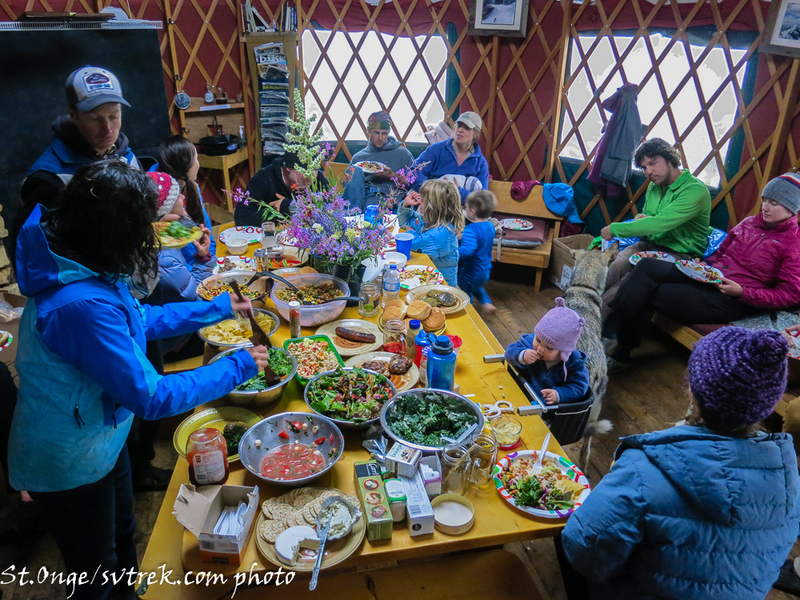 But typically my skill and experience outweighs that of my guests. 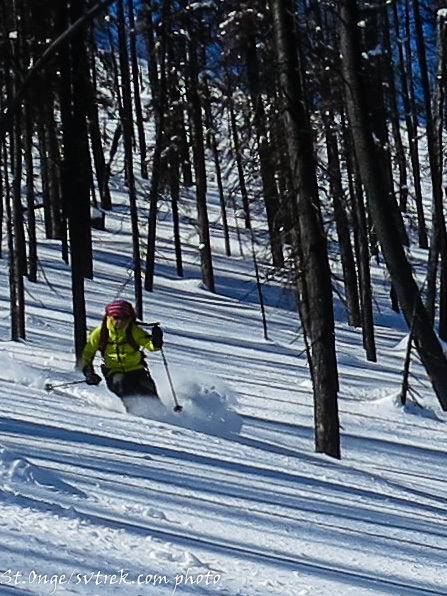 I was not even close on this trip. 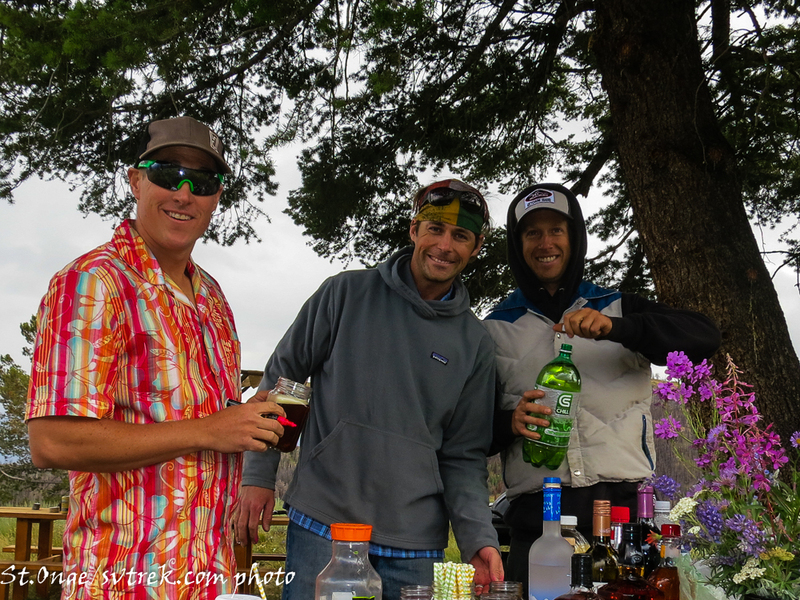 We had Mark Weir, a long time racer and cross-country animal; Aaron Chase, the bike-handling wizard; and Jamie Goldman, big air phenomenon. 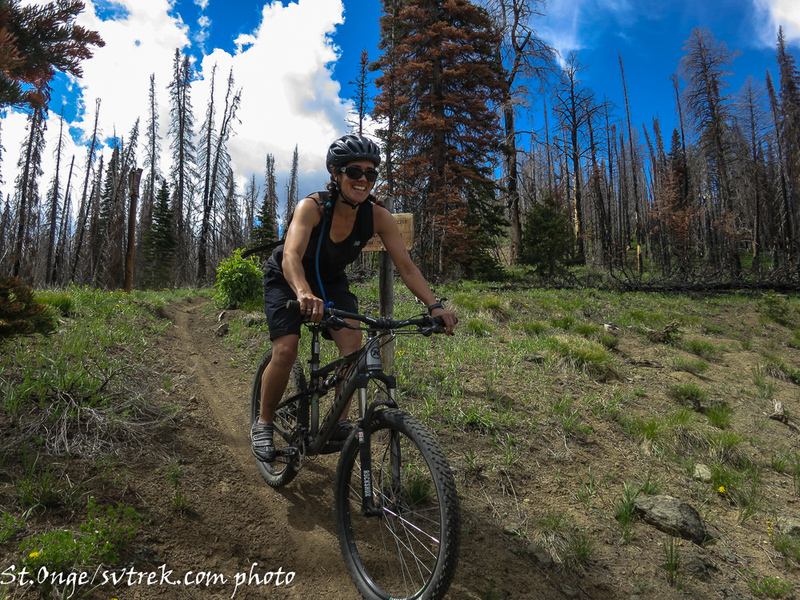 We also had a duffel bag full of 50+ GoPro cameras and two dedicated pro photographers (we called them the GoProographers) and a mission to capture “the goods.” While my riding will never equal theirs, I did have a secret weapon. 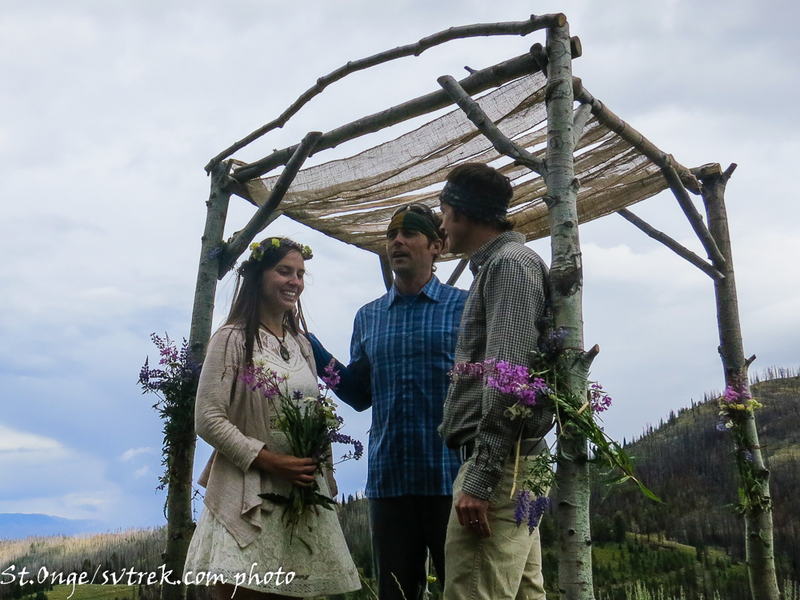 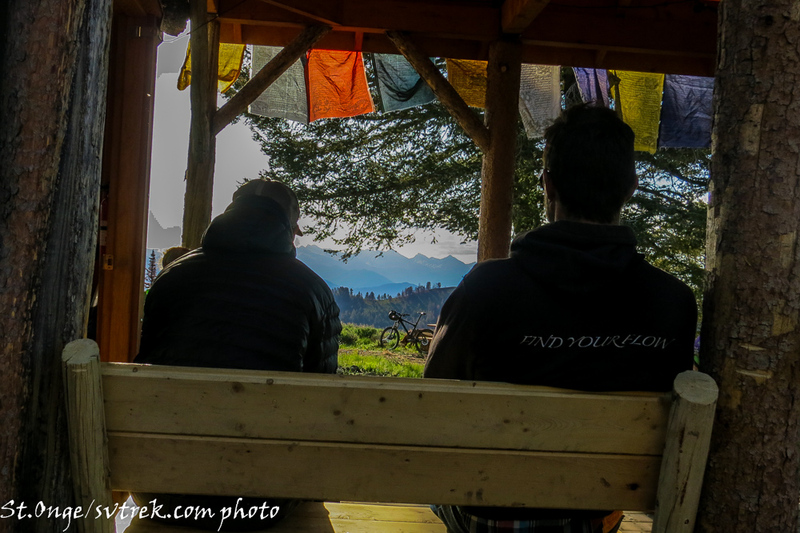 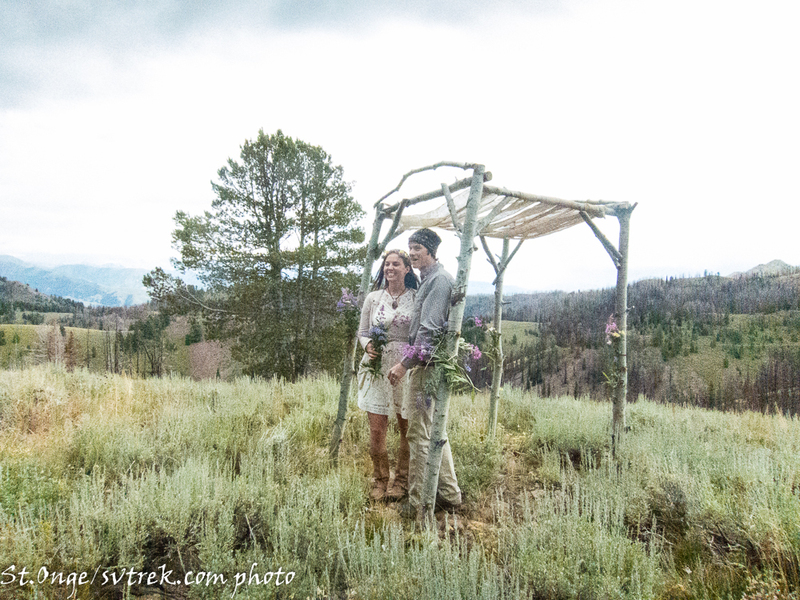 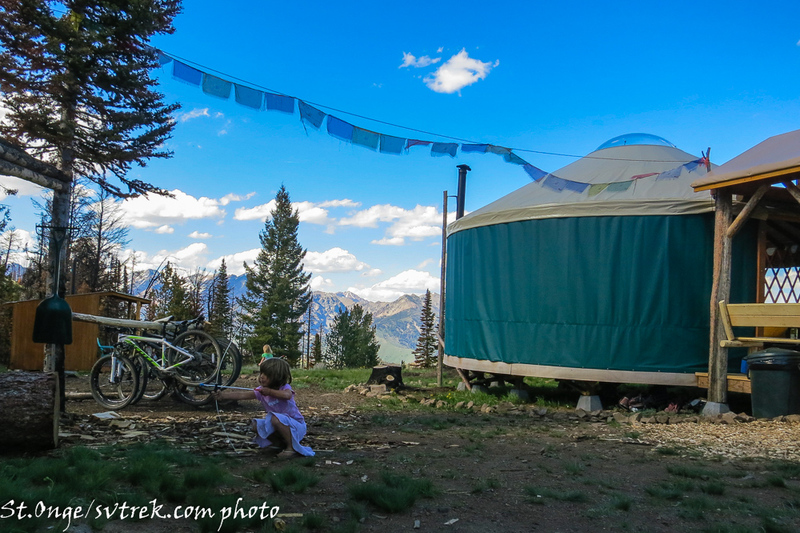 My advantage was an intimate knowledge of these mountains, trails and a sweet Yurt in the middle of it all. 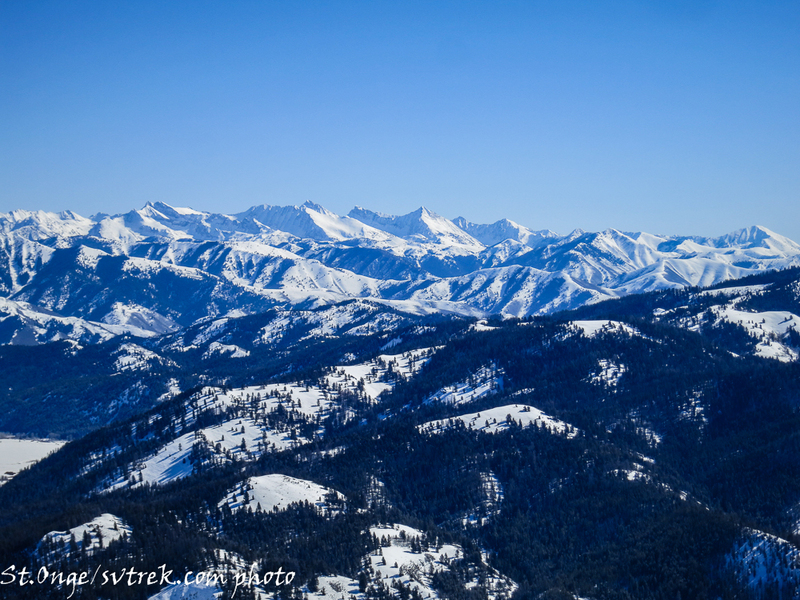 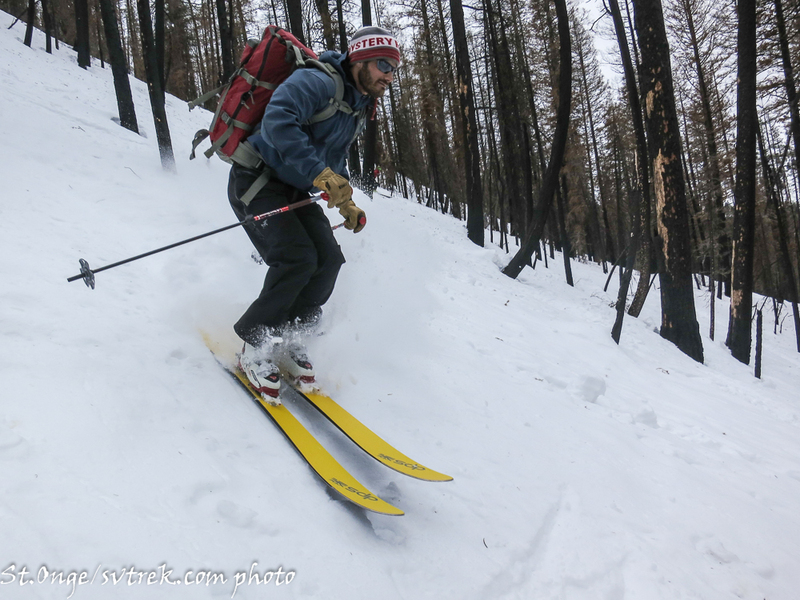 32 years ago, Joe Leonard built the first dedicated backcountry ski yurt in the Sawtooth Mountains. 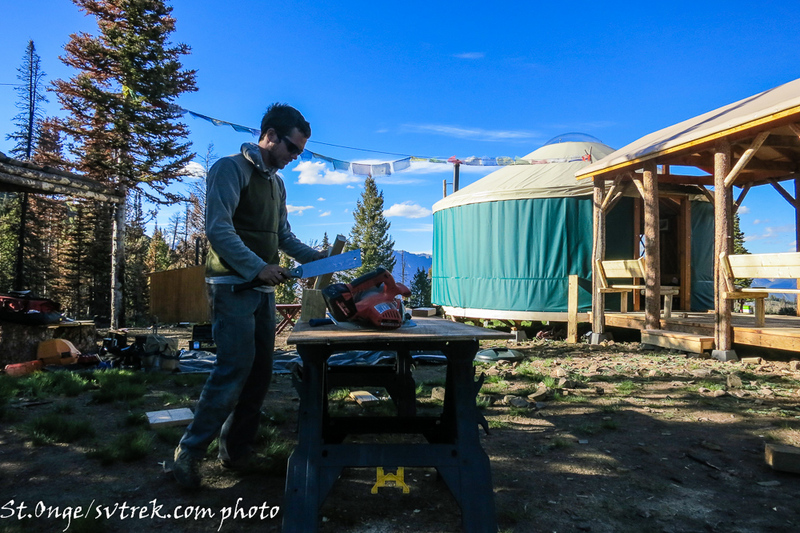 Yurts have been used for millennia by herders on the steppes of Central Asia, but it wasn’t until Joe built one in the Sawtooth, that they were used to house thrill-seeking backcountry skiers. 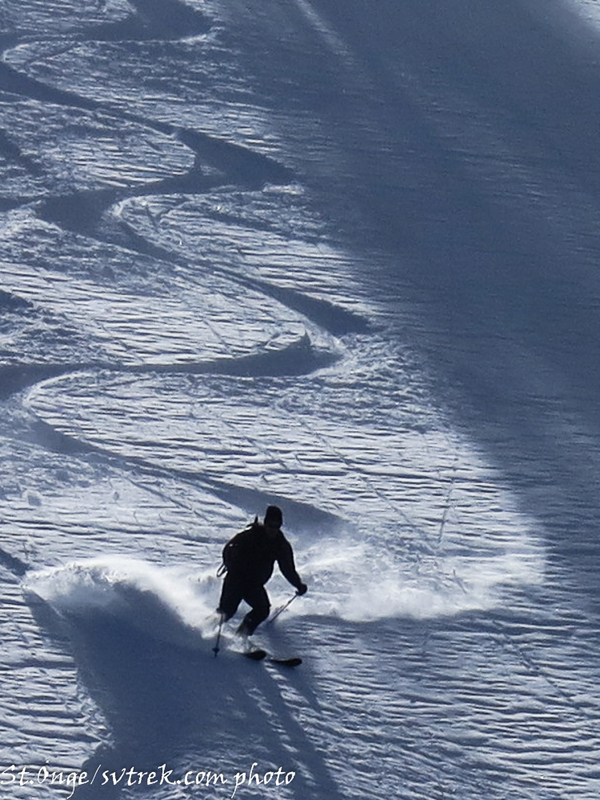 And the idea spread. 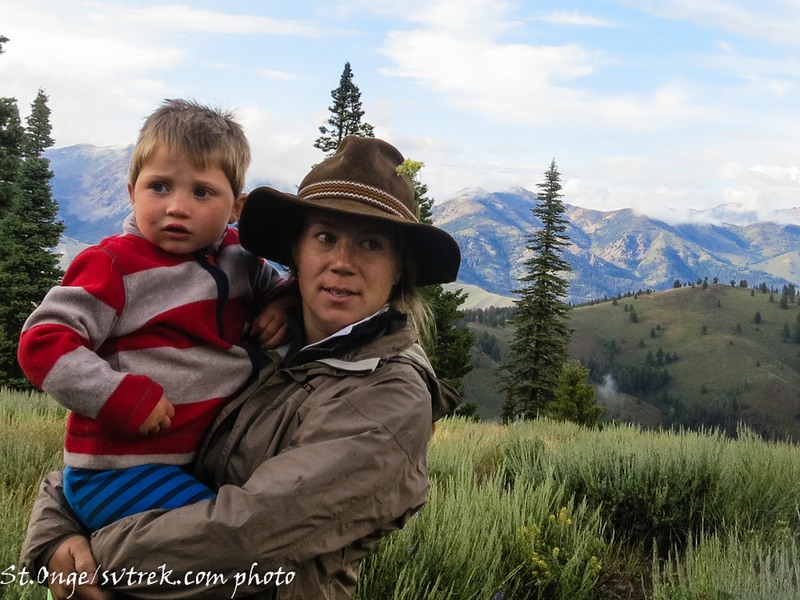 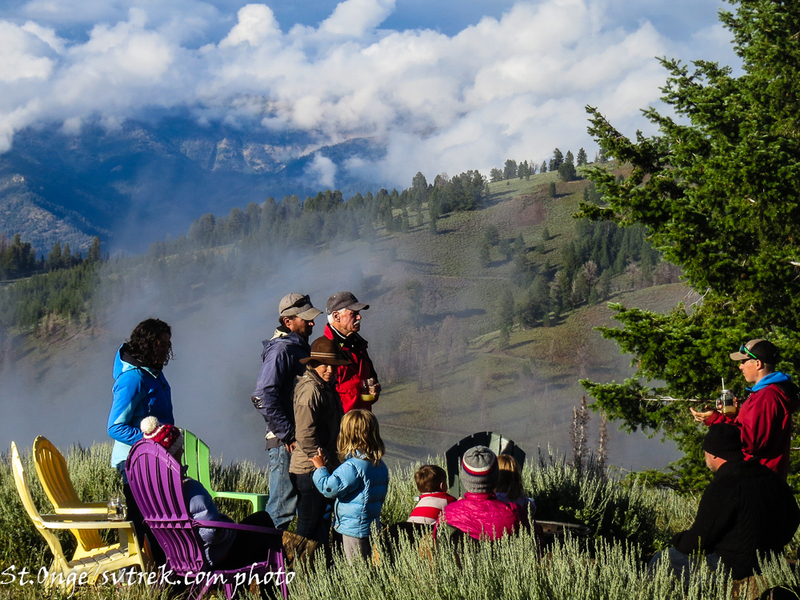 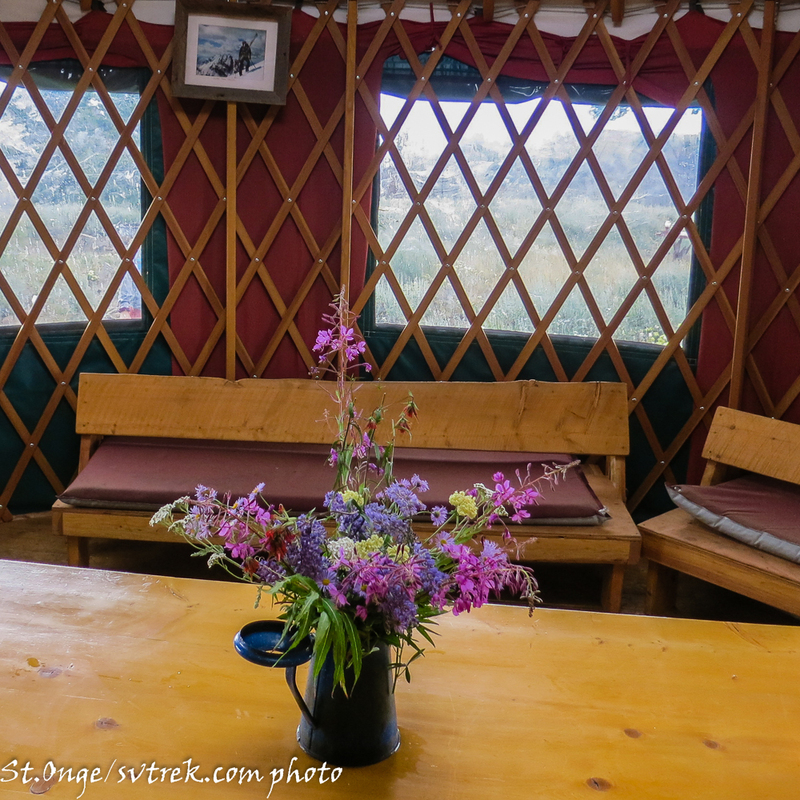 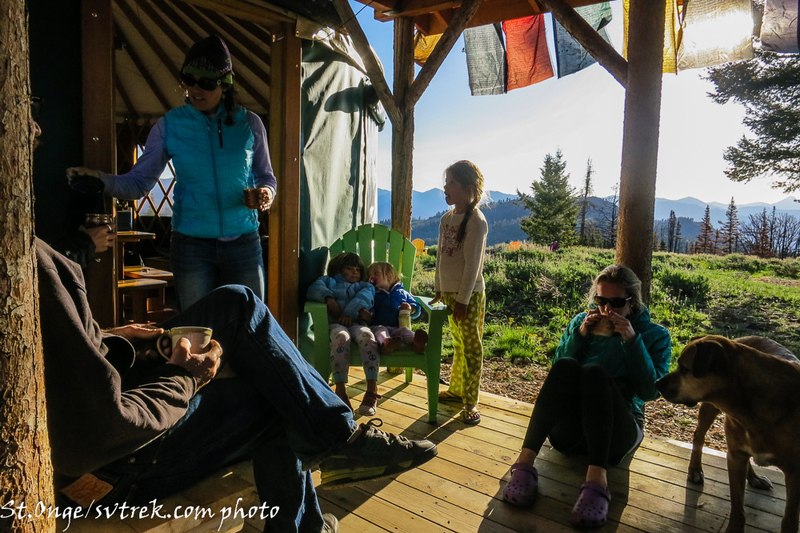 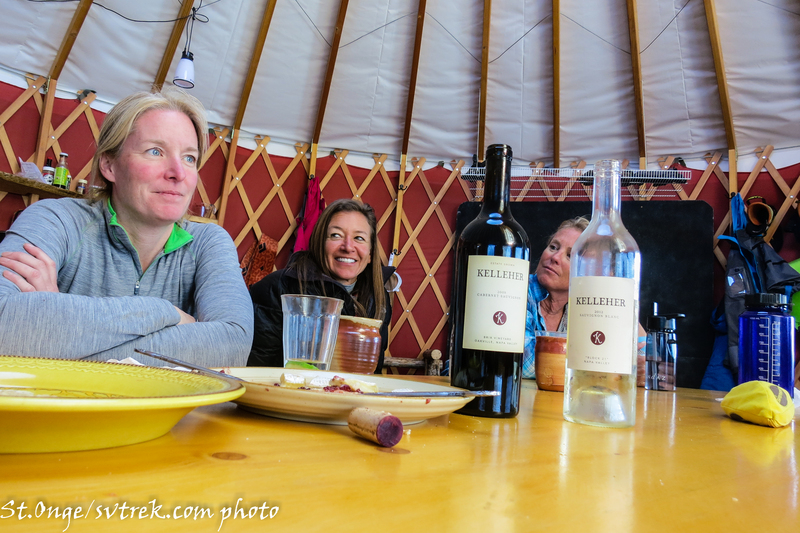 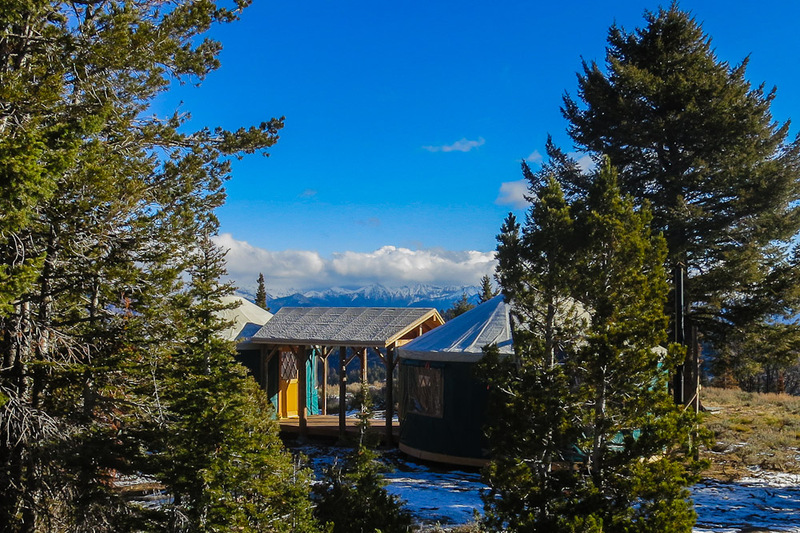 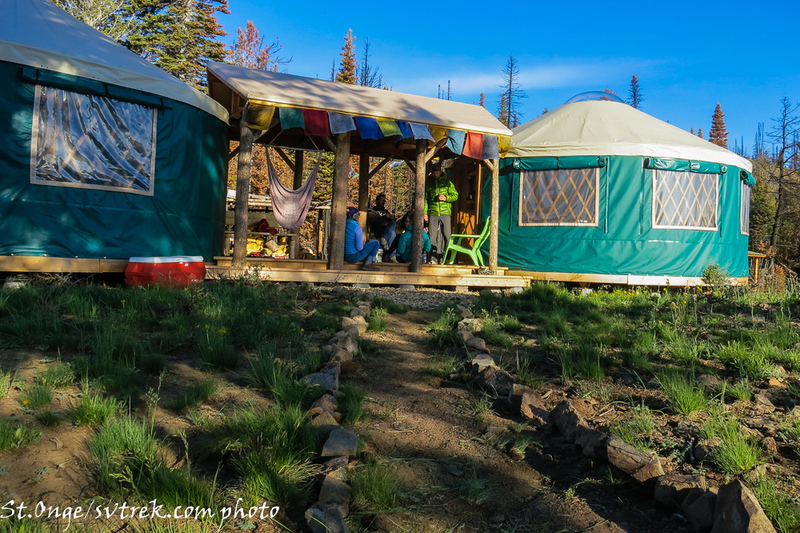 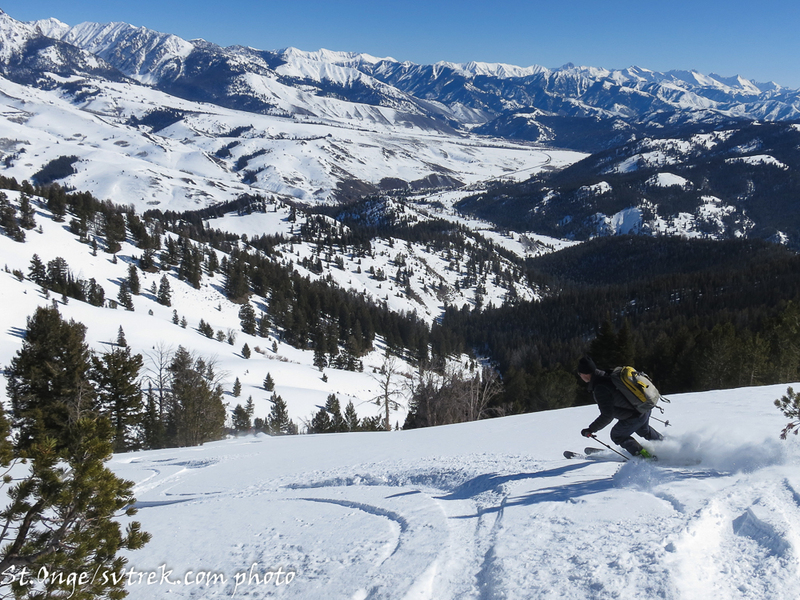 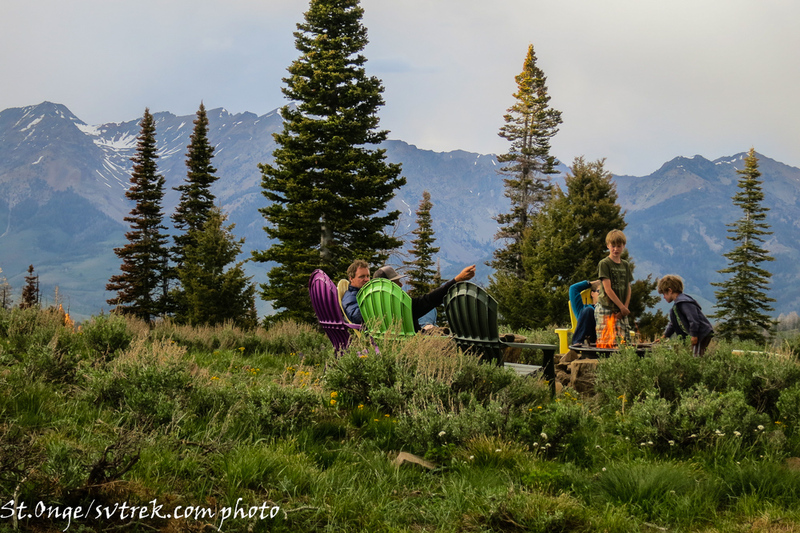 A couple of years later, Bob Jonas and Sun Valley Trekking took over Joe Leonard’s yurts and built 5 more, strategically located to take advantage of the best the Idaho backcountry has to offer. 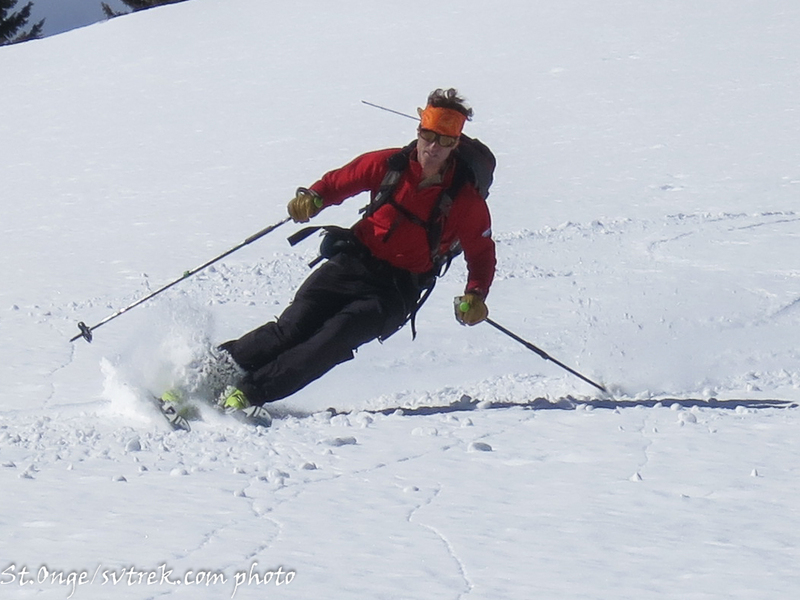 But that ‘best’ was focused on powder skiing. 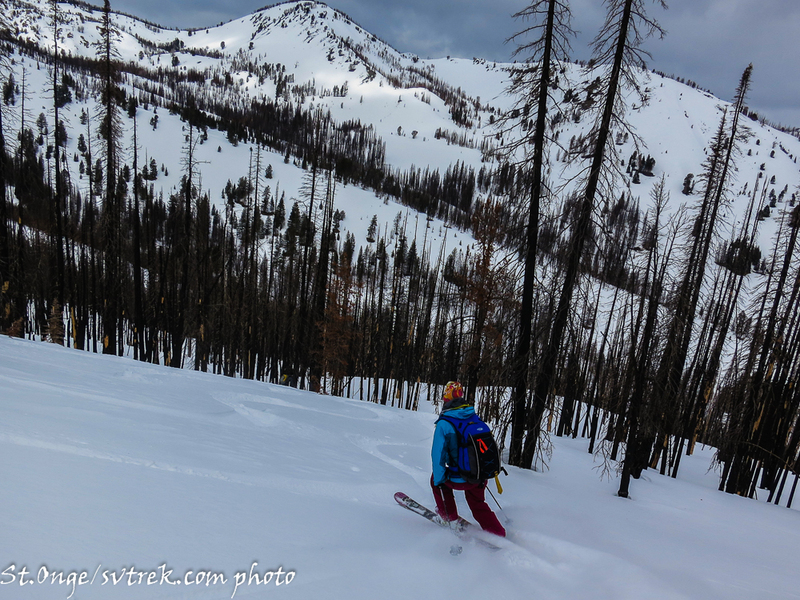 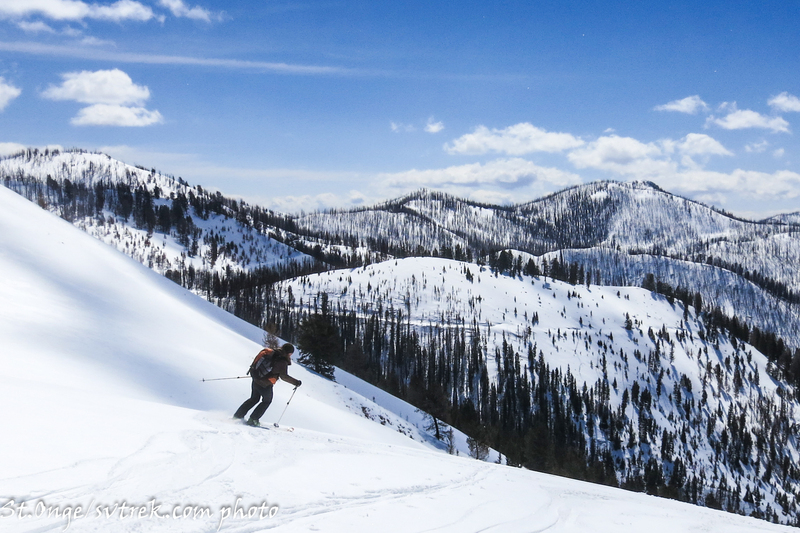 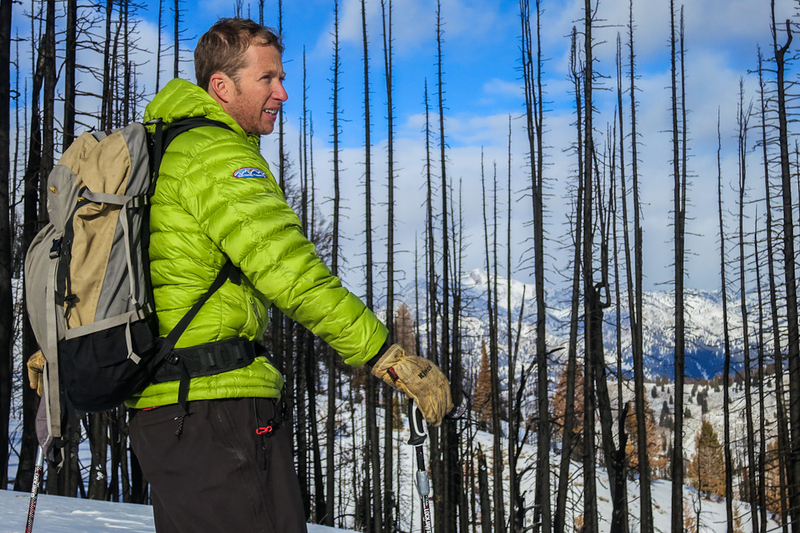 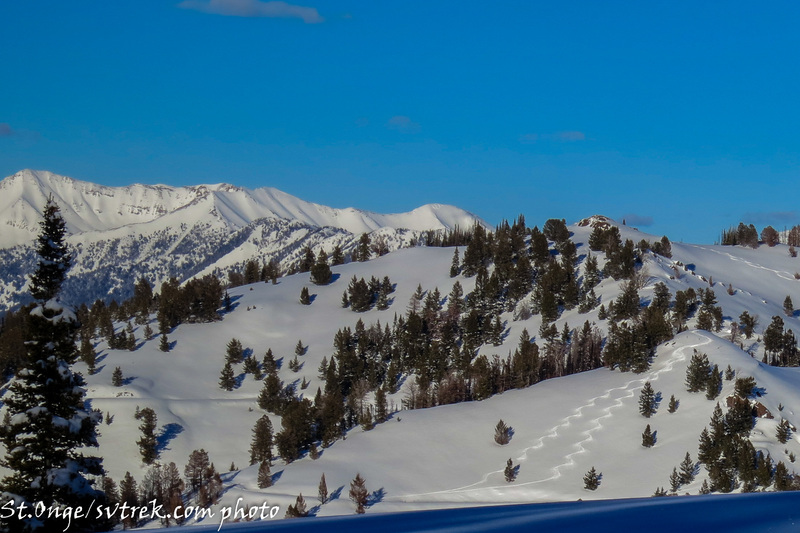 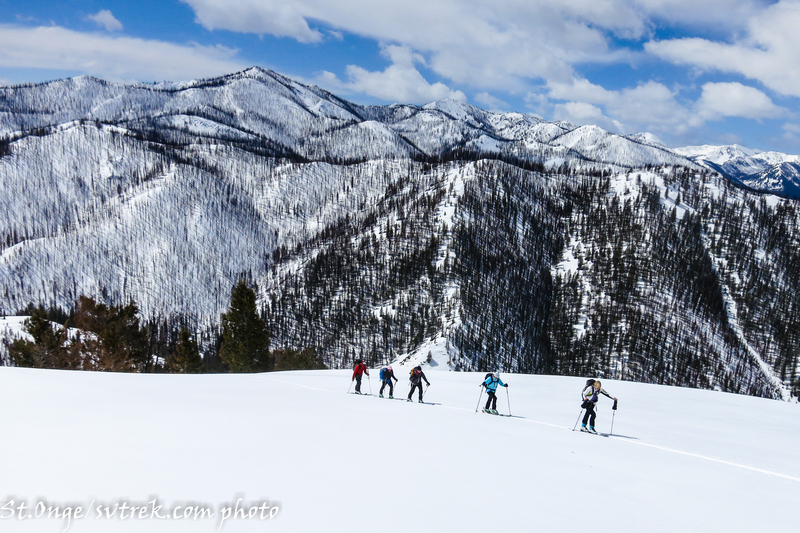 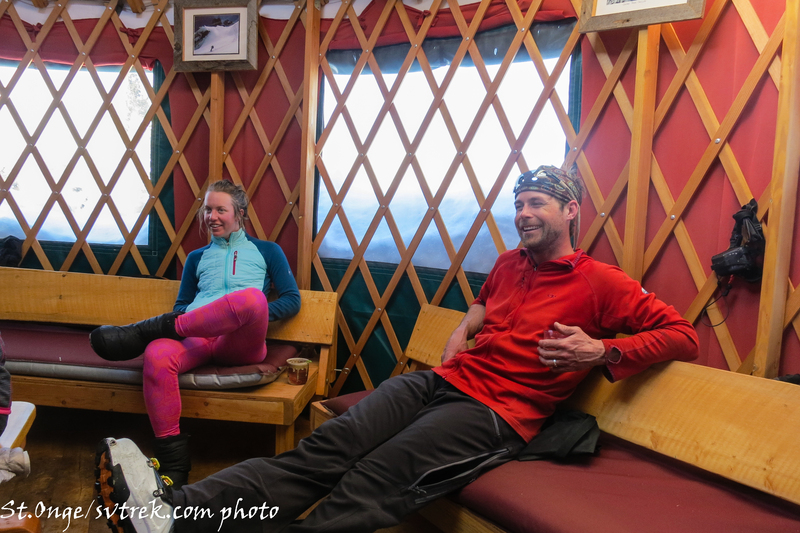 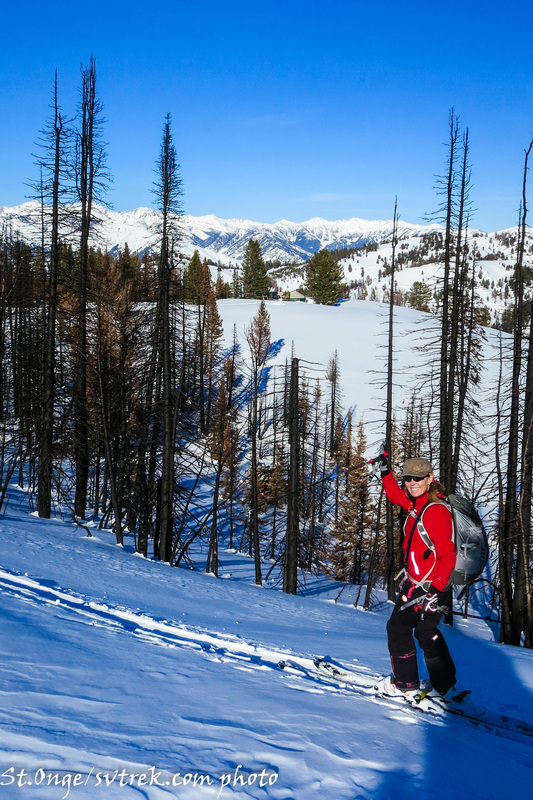 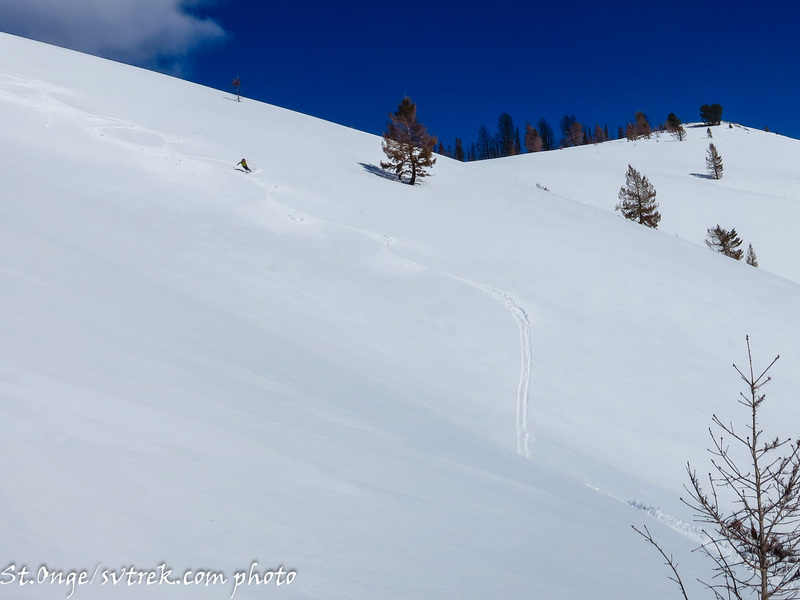 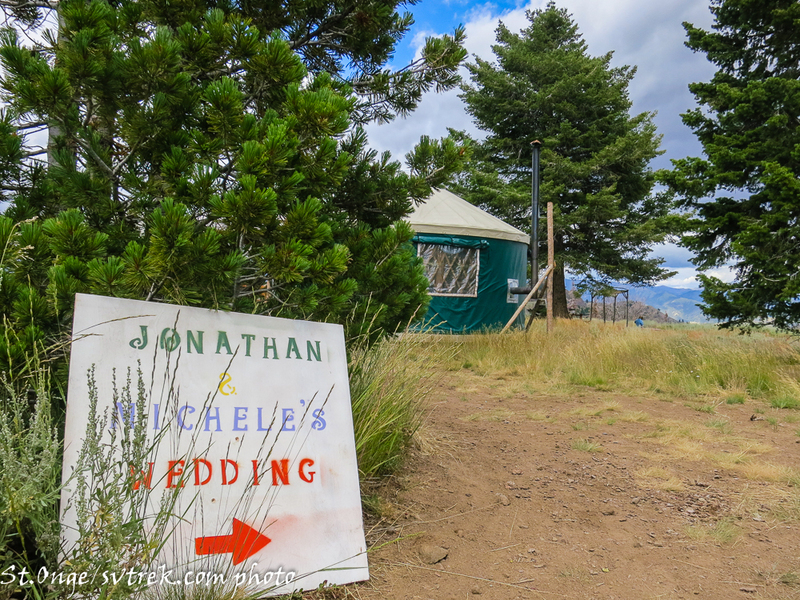 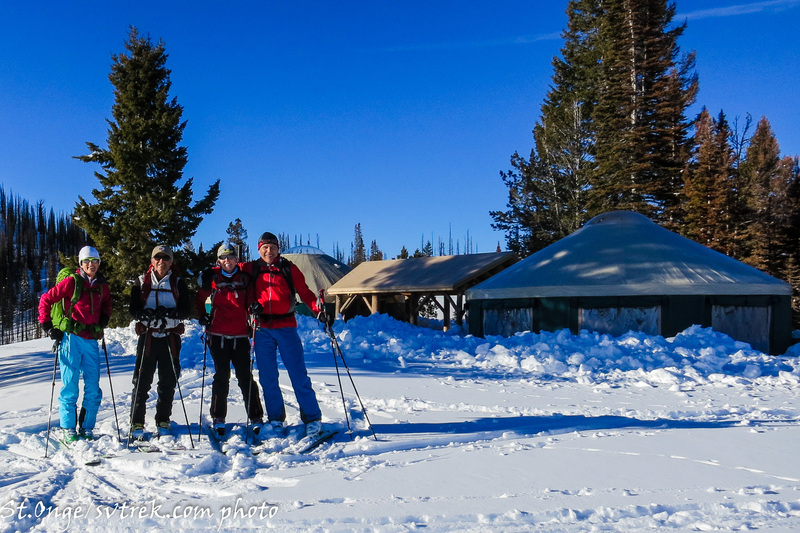 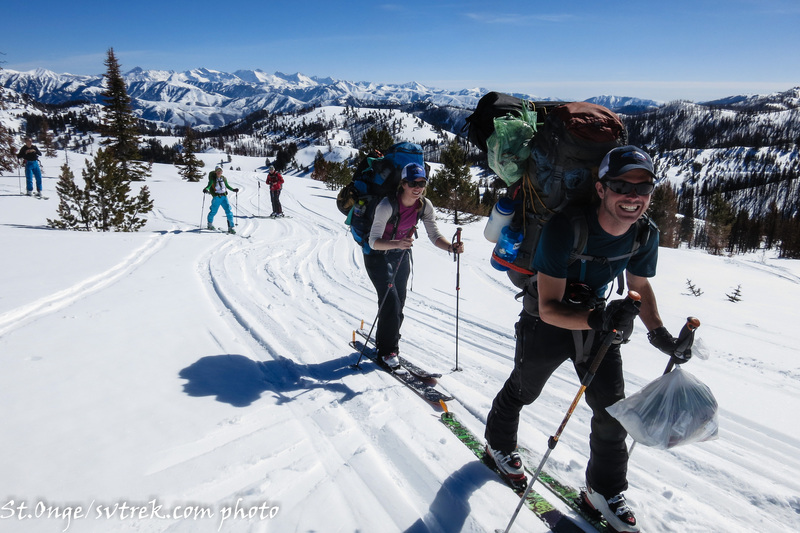 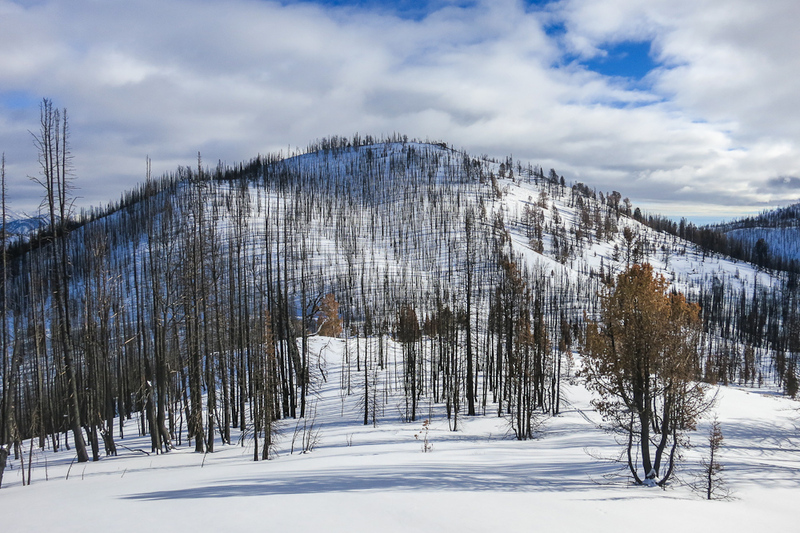 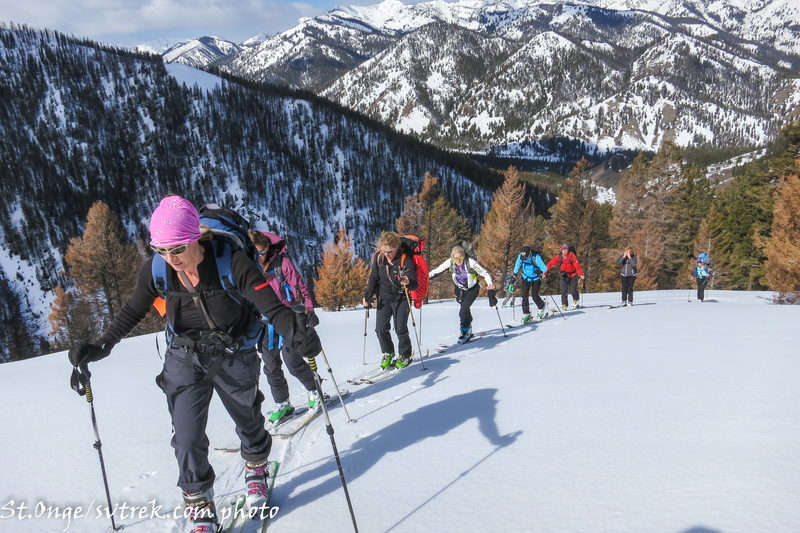 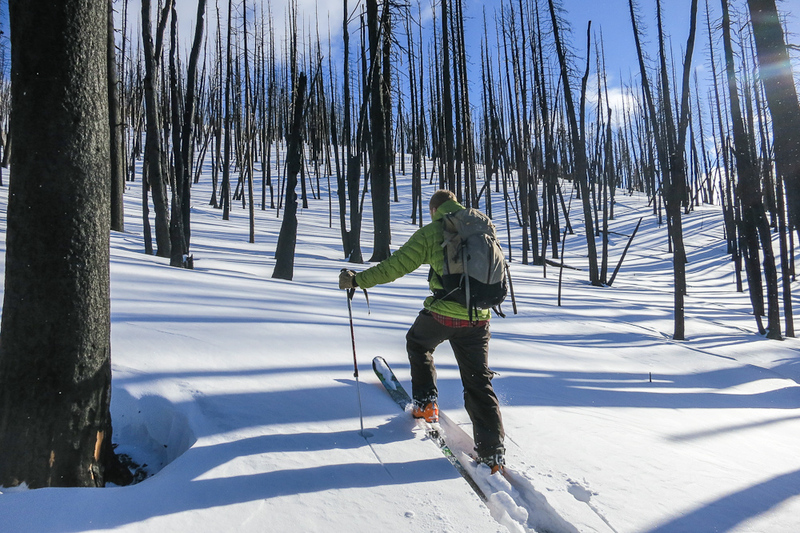 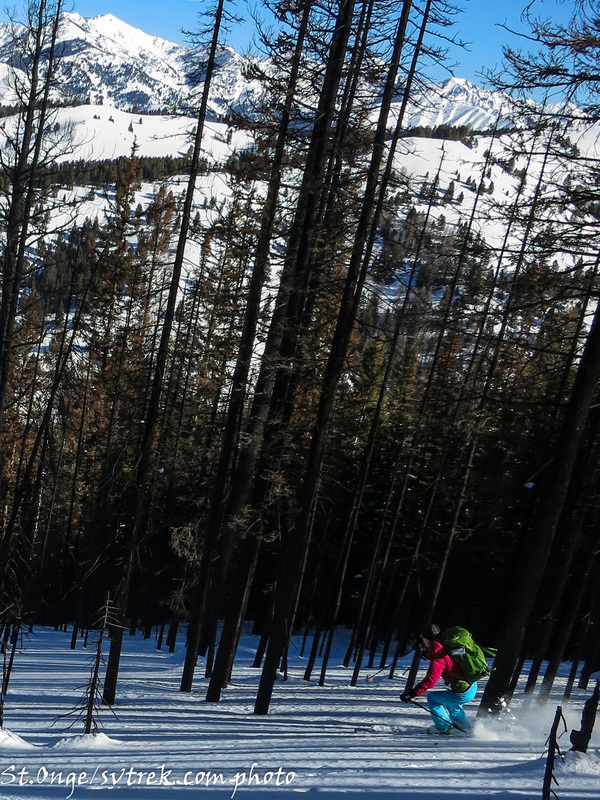 Luckily, one of those ski yurts also happened to be at one of the premier trail junctions in the Idaho backcountry. 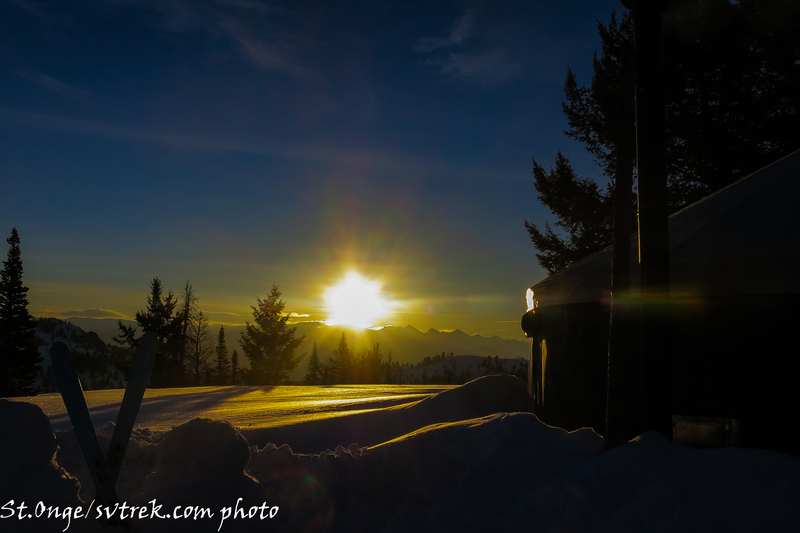 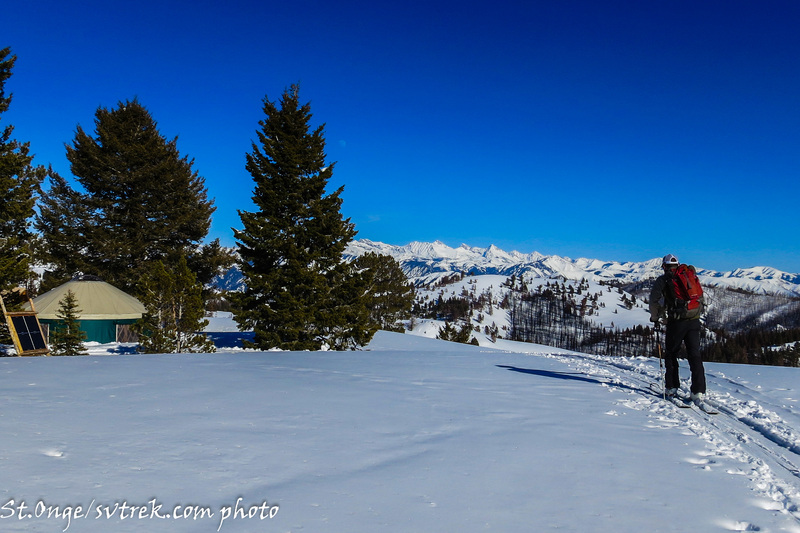 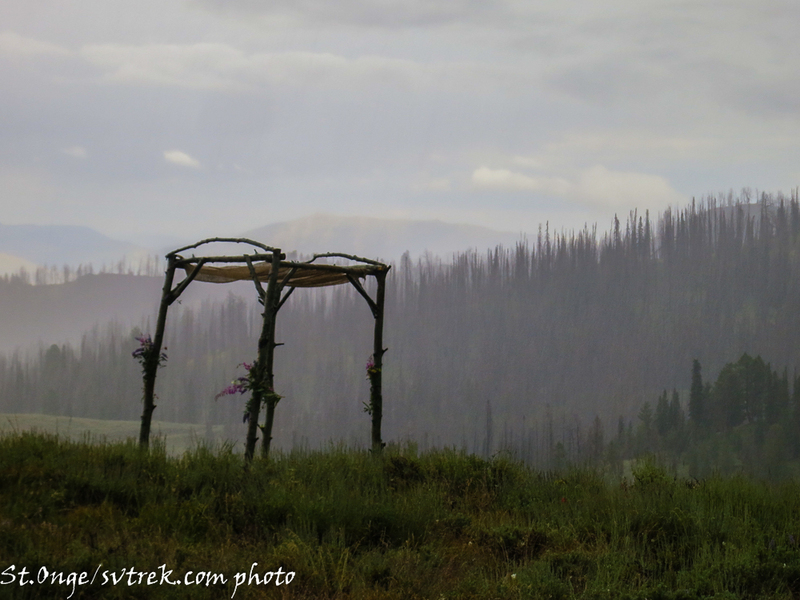 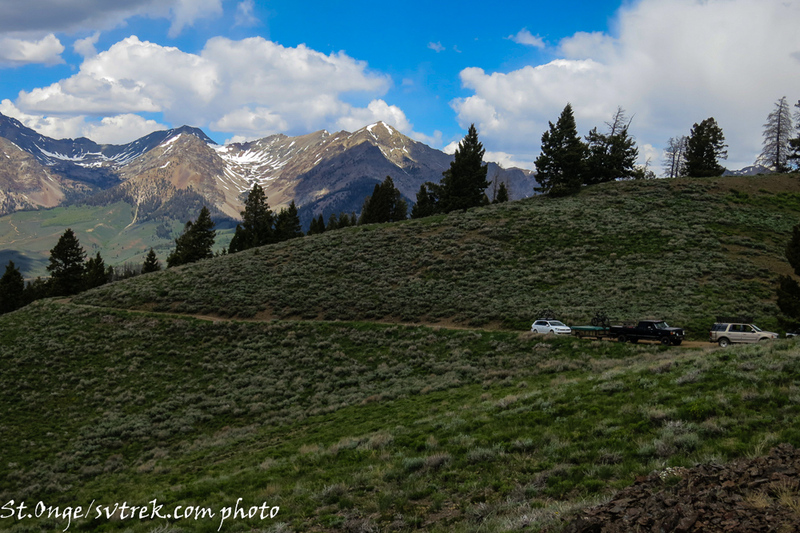 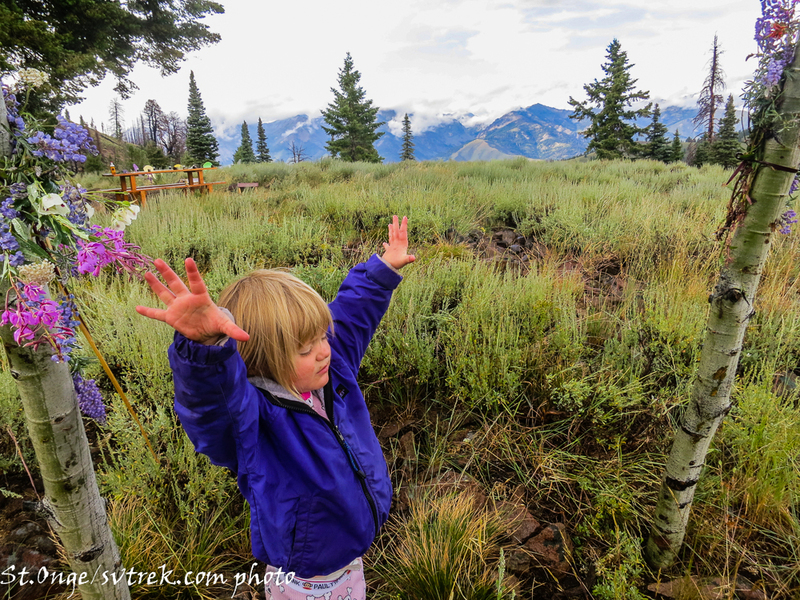 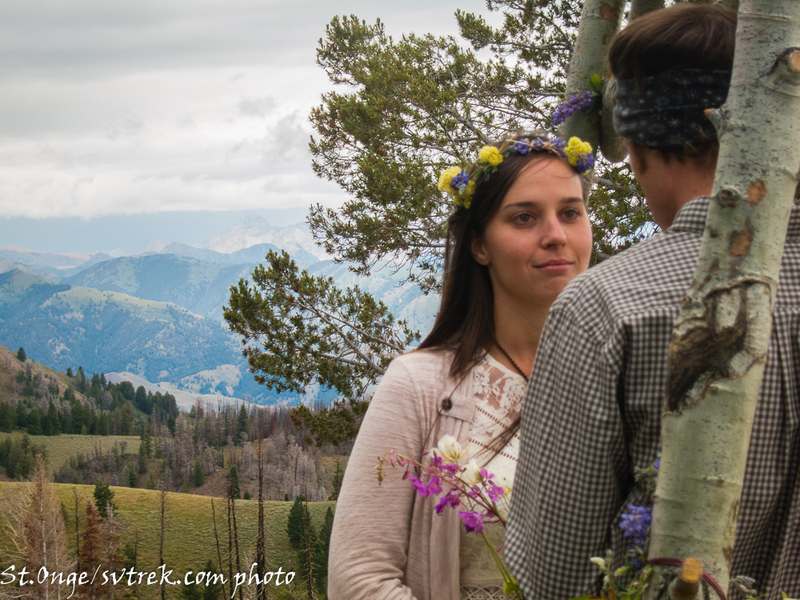 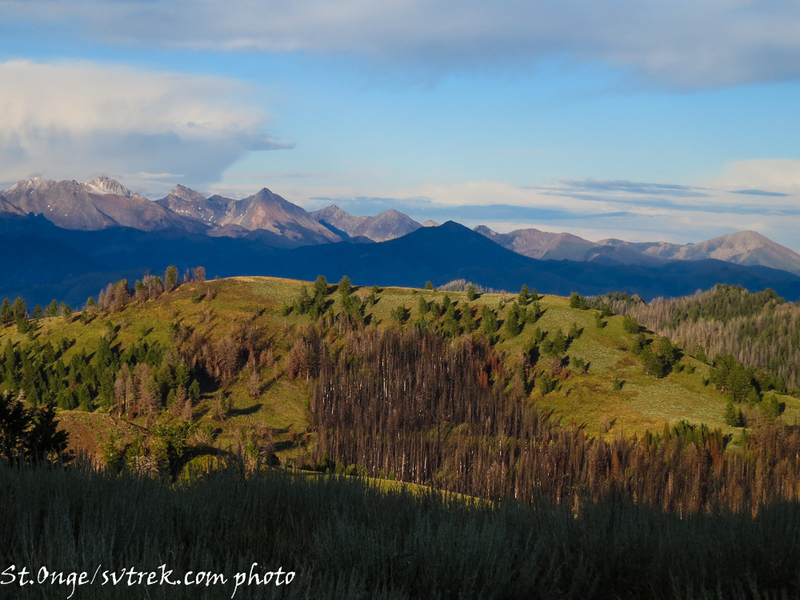 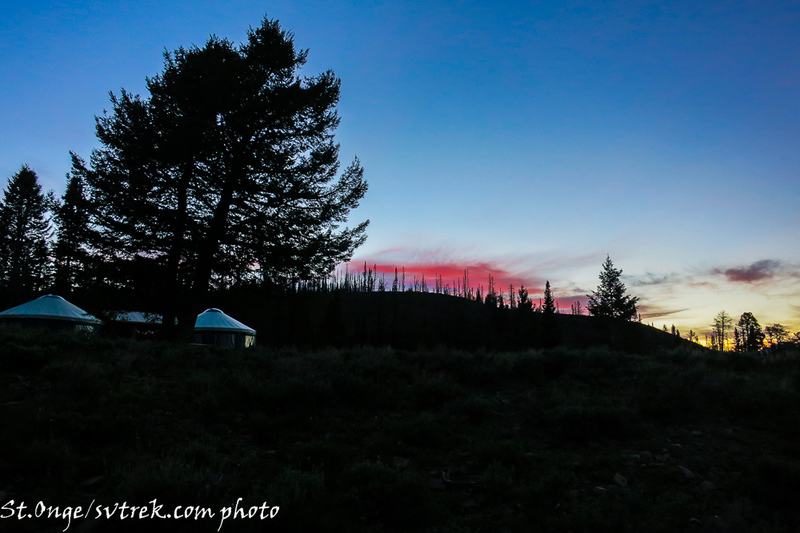 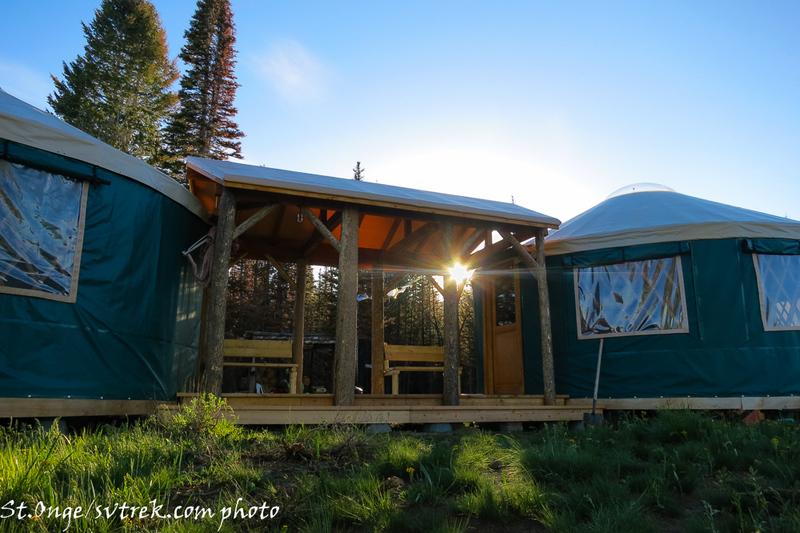 The Coyote Yurt sits on a promontory ridge at 8700’ in the headwaters of the East Fork of Baker Creek. 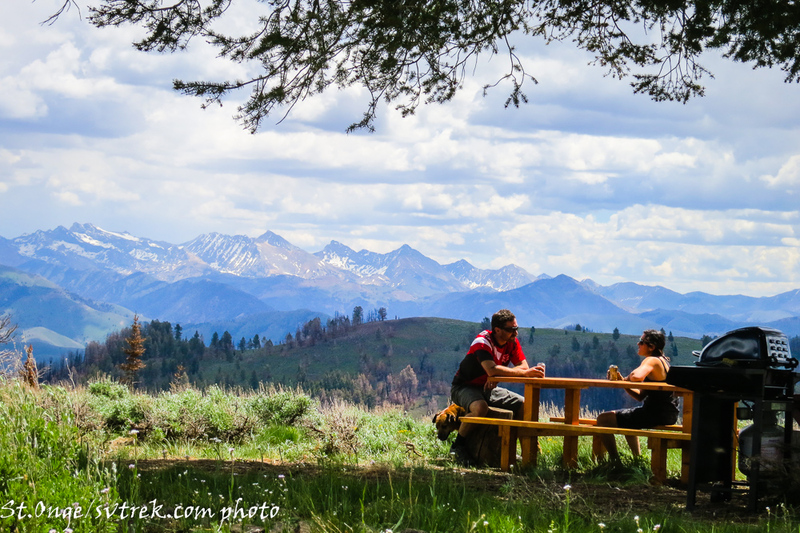 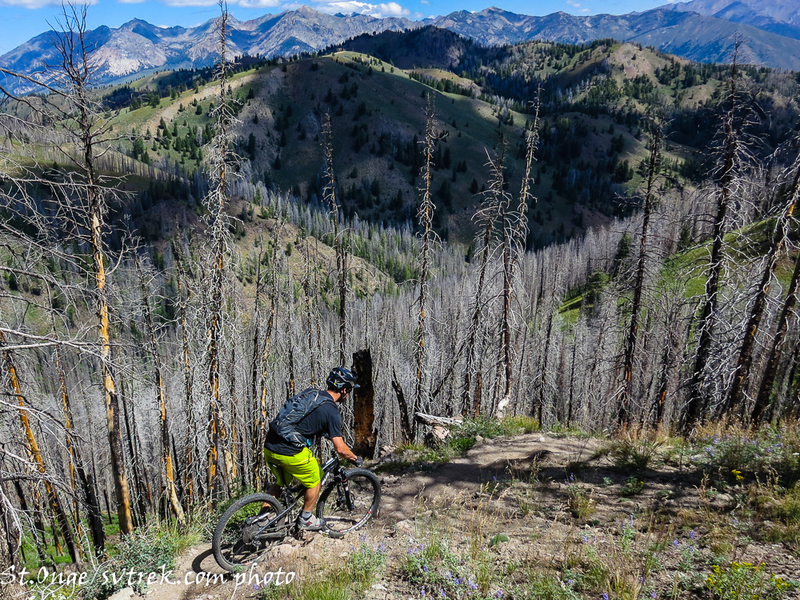 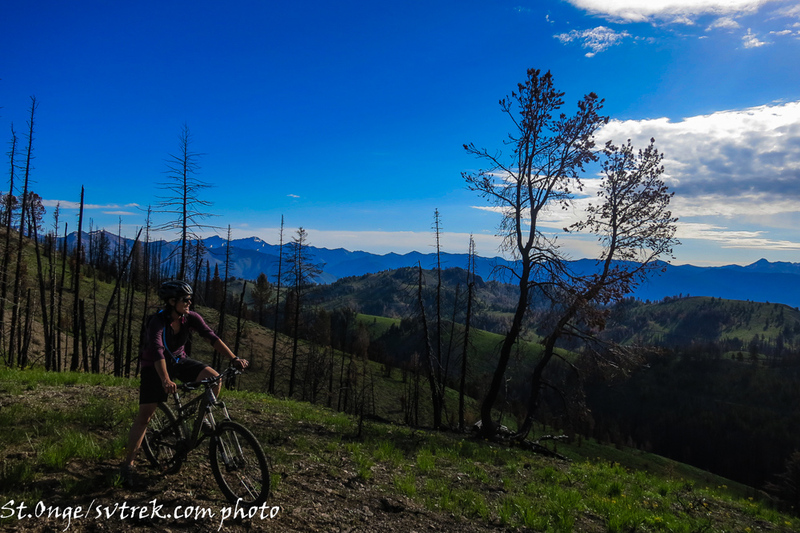 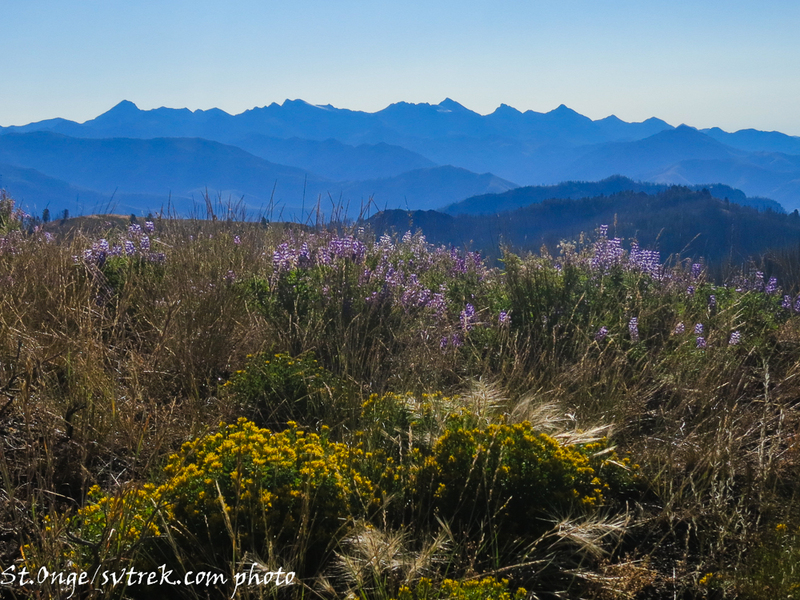 It is here, on the flanks of Fox Peak that some of Idaho’s most storied mountain bike trails meet — Easley Gulch, Oregon Gulch, Fox Peak, Warm Springs Ridge, Alden Gulch, Rooks Creek, and Osberg Ridge all make their high points here. 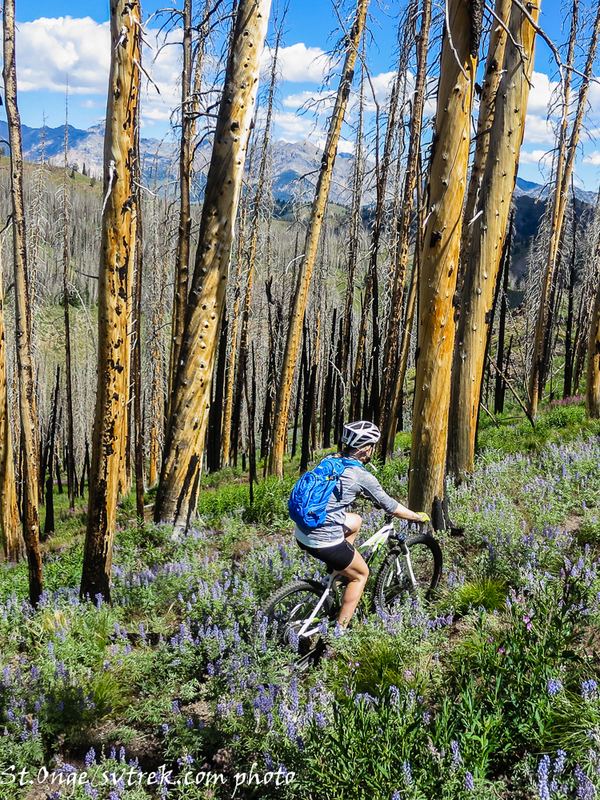 But these aren’t the typical town rides, these trails are out there and most that have ridden them require a fair bit of energy, time and skill to do so. 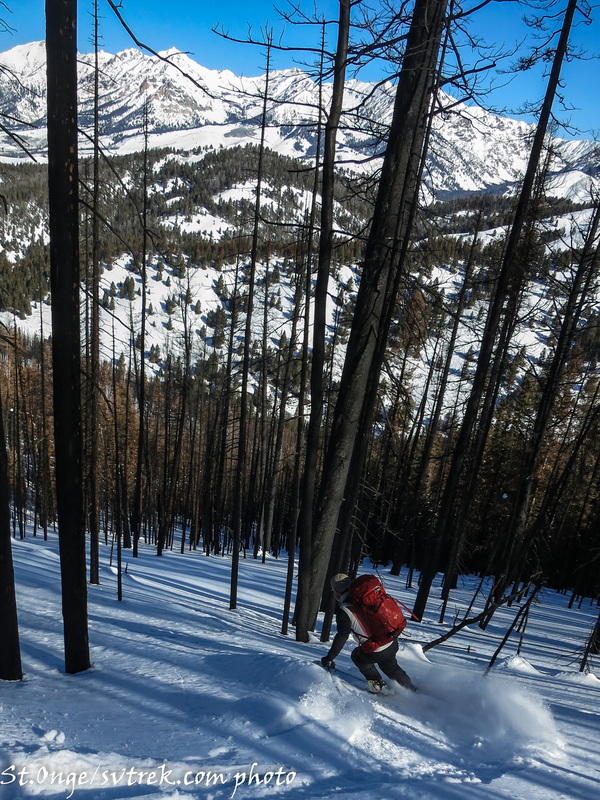 When folks do put in the time and energy, these trails afford the best of what Idaho backcountry riding has to offer. 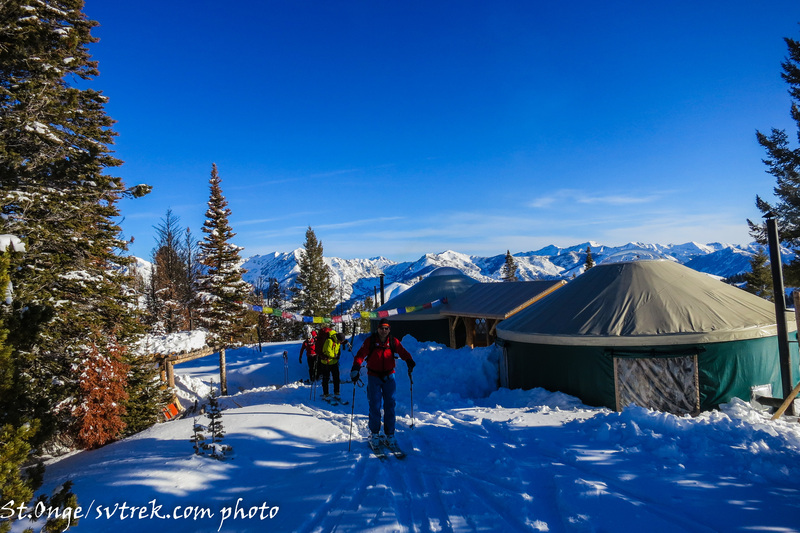 And there is a cool backcountry yurt for a base camp right there. 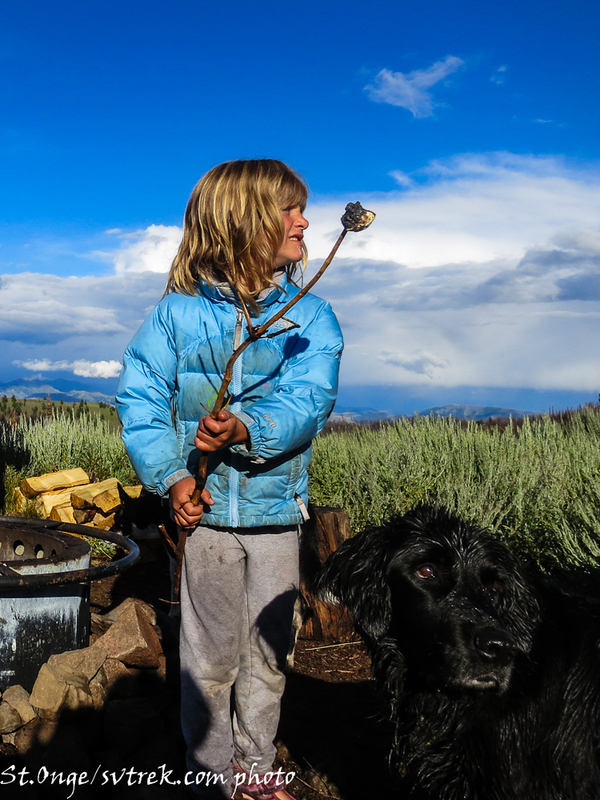 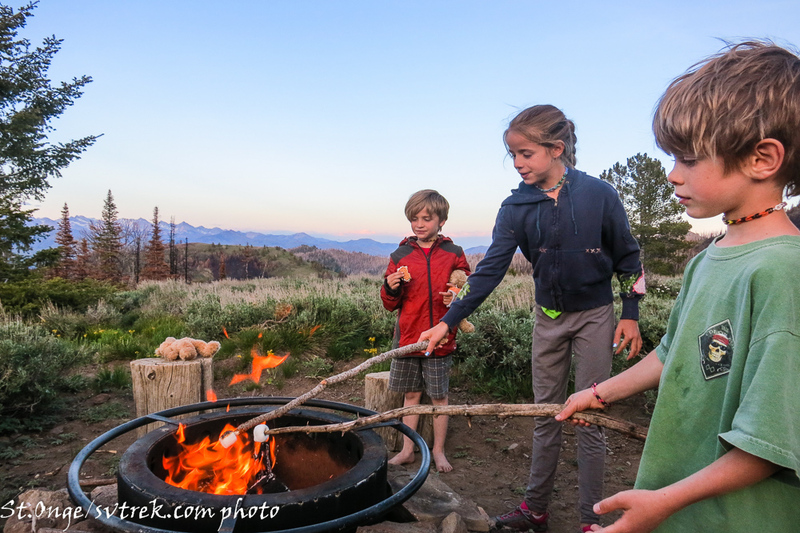 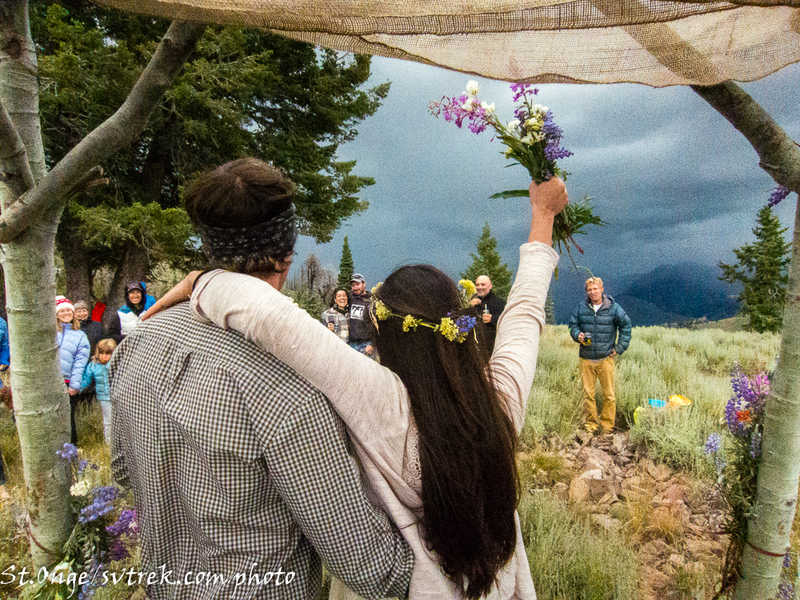 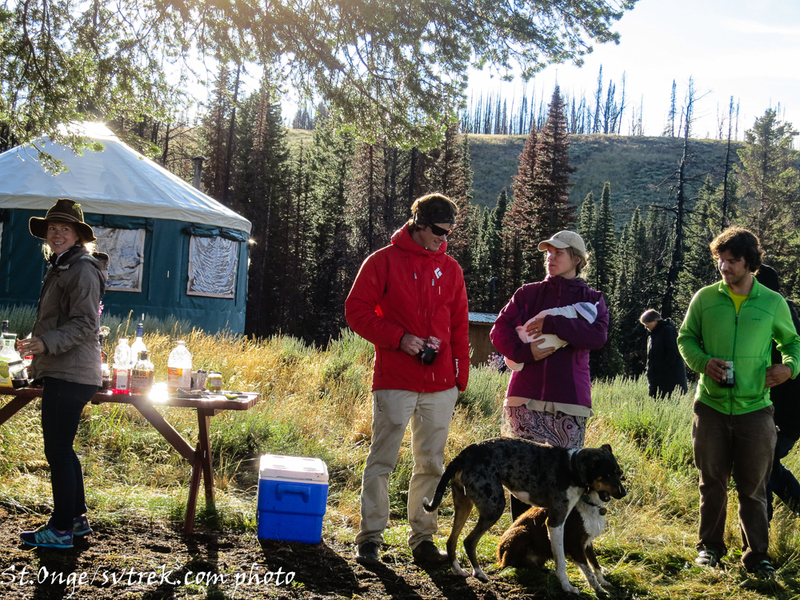 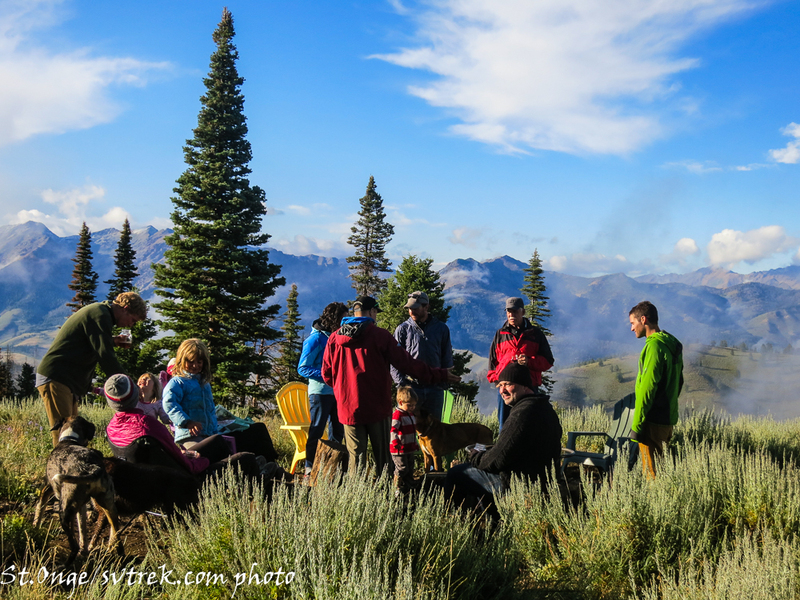 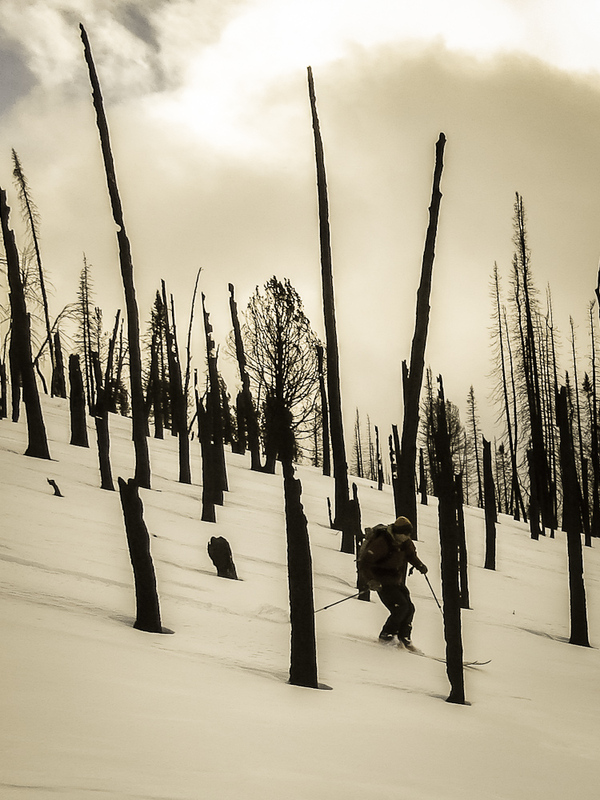 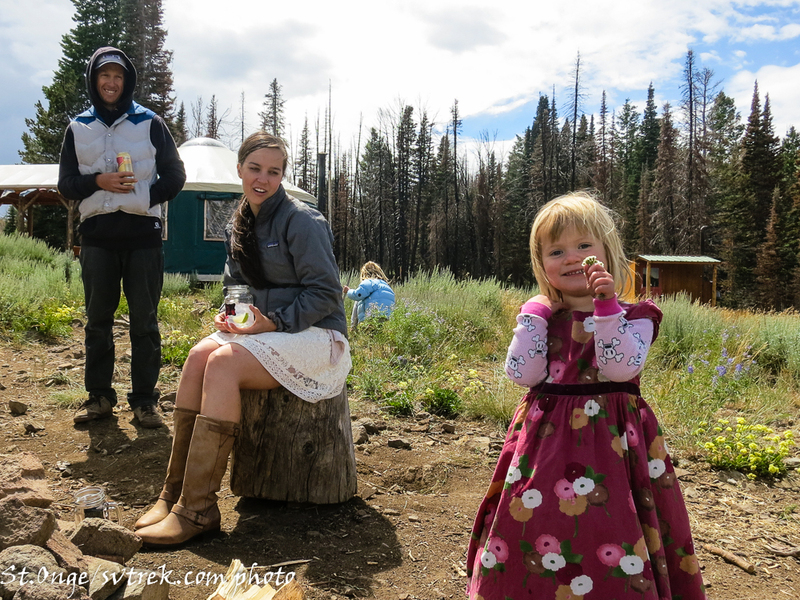 Just last year, the Beaver Creek wild fire consumed the Coyote Yurts in its flaming hunger. 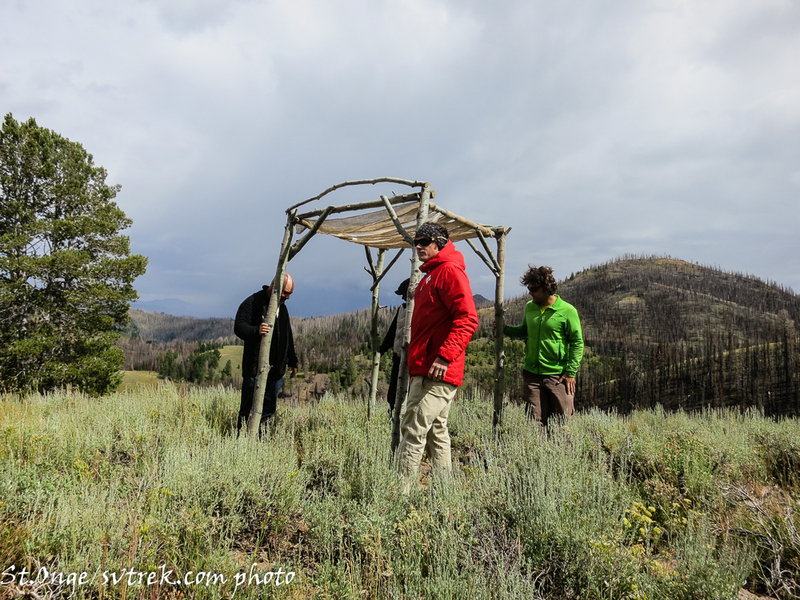 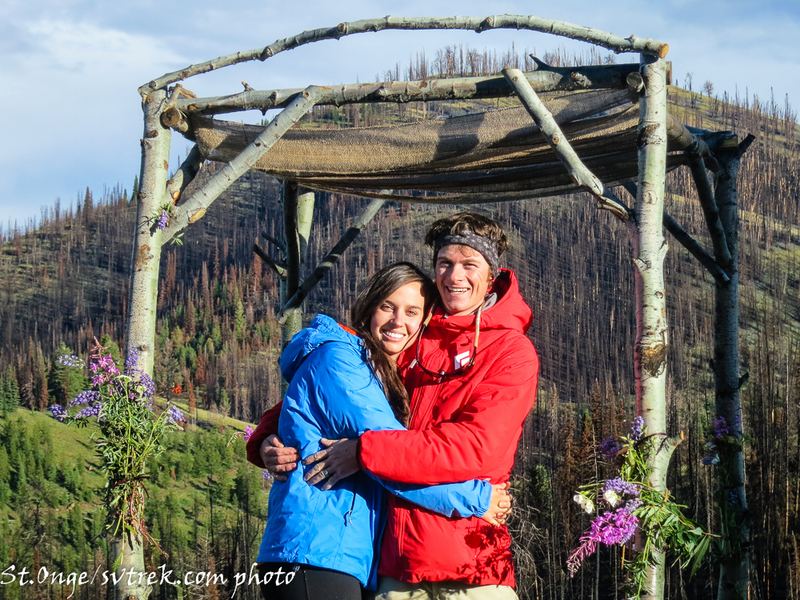 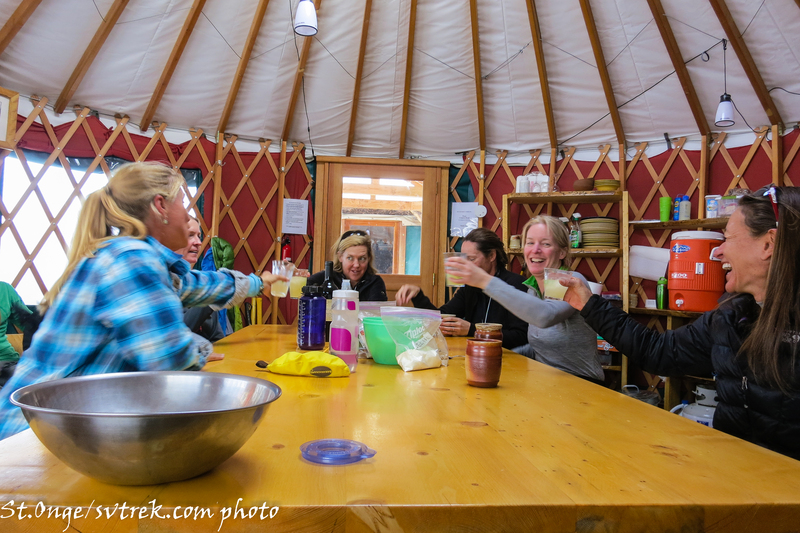 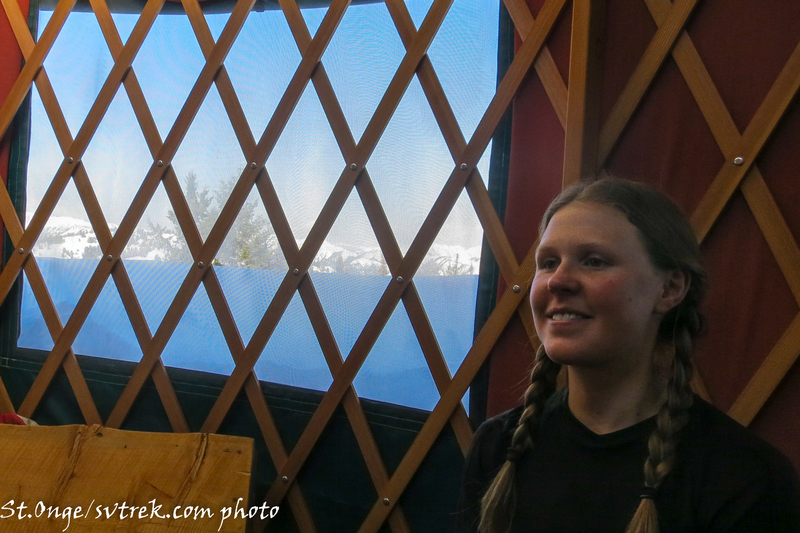 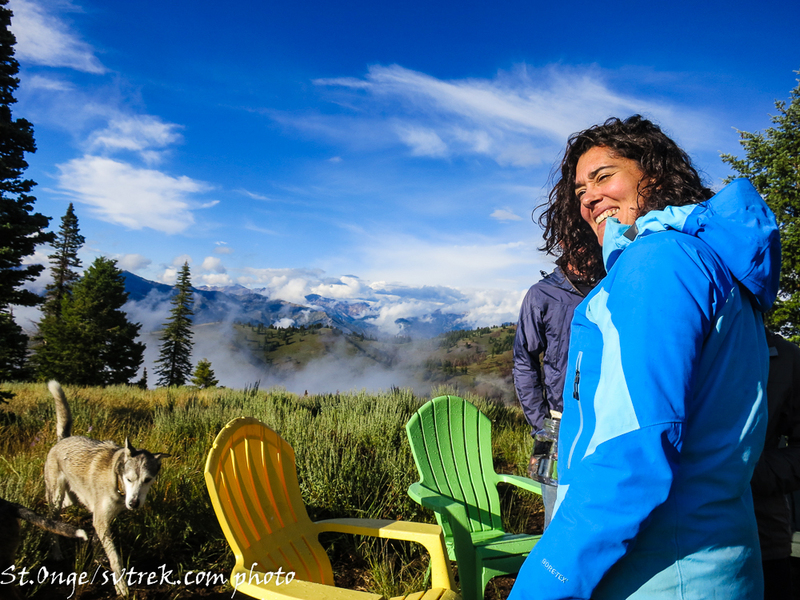 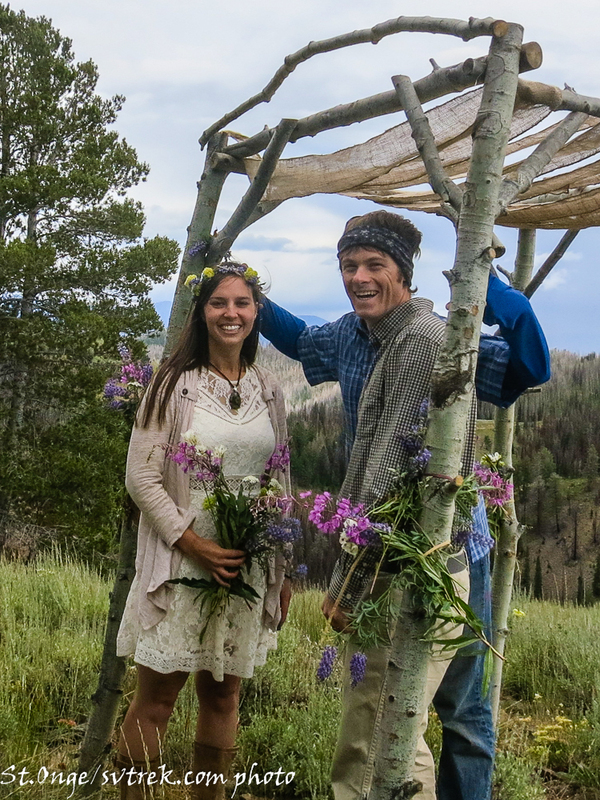 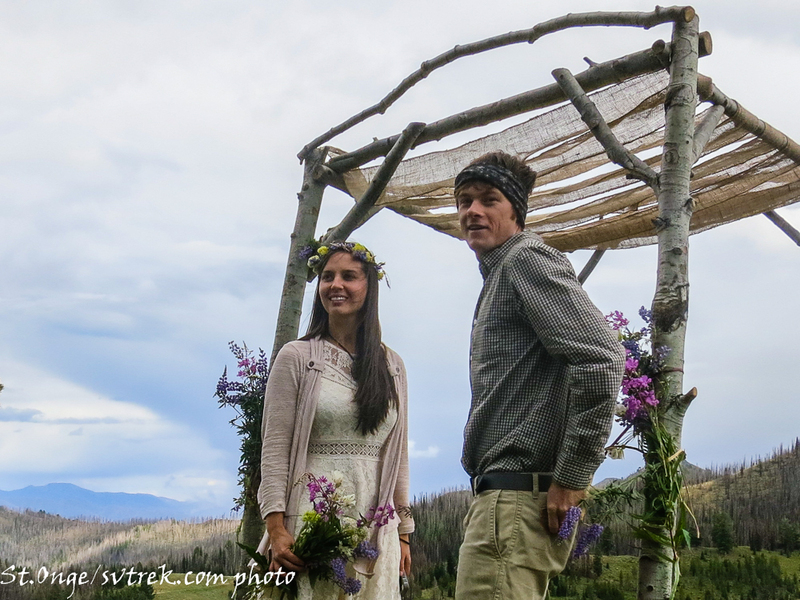 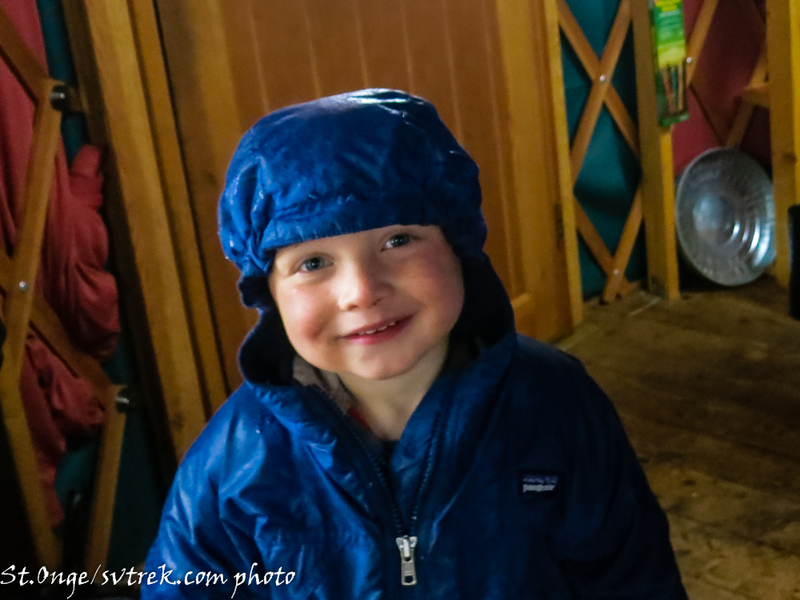 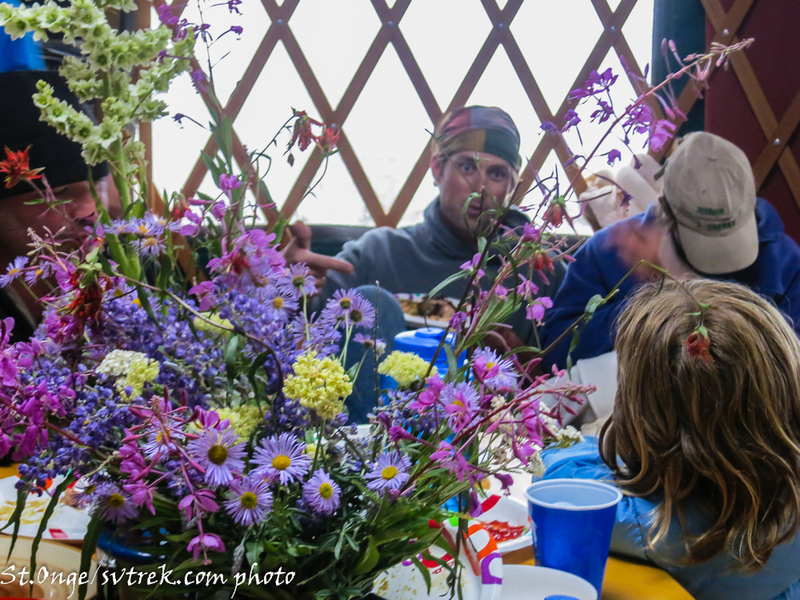 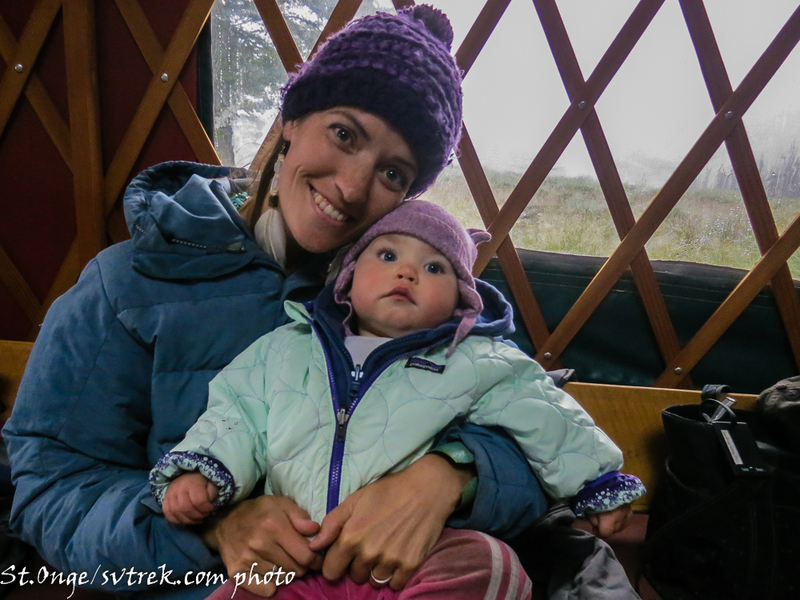 The loss of this amazing backcountry yurt was profound and we quickly mobilized to rebuild. 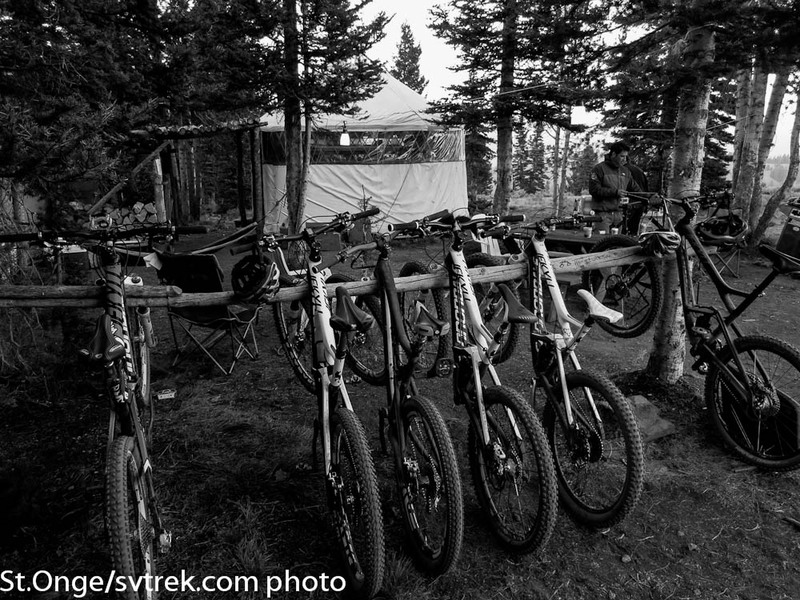 The result of the effort is one of the most aesthetic backcountry yurts ever, ready to stoke bikers. 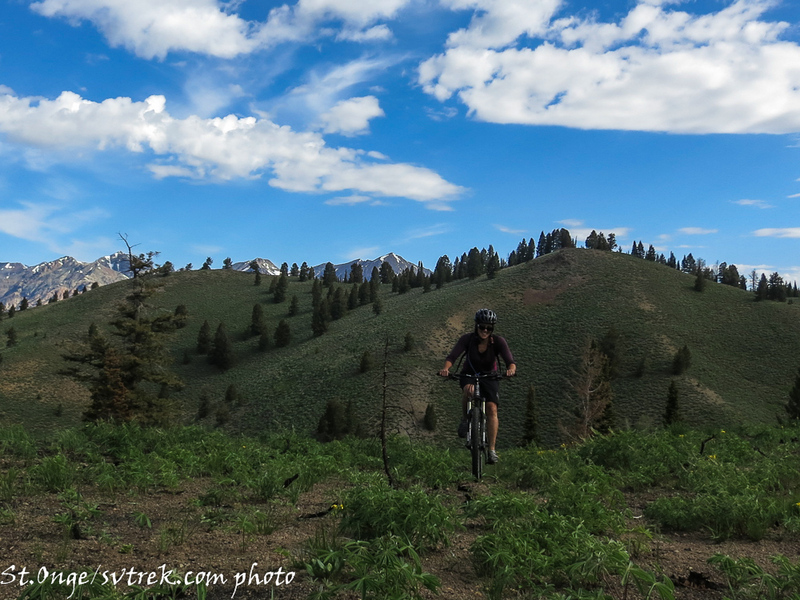 Since first riding my bike from the Coyote Yurt on these trails 13 years ago, I knew this was very special. 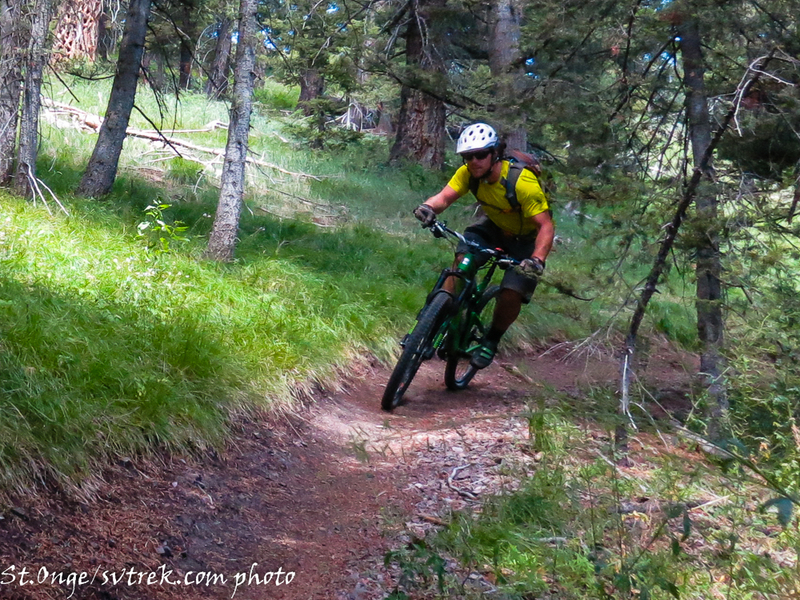 Until recently, wolf and mountain lion tracks were more common than other bike tracks on the headwater trails. 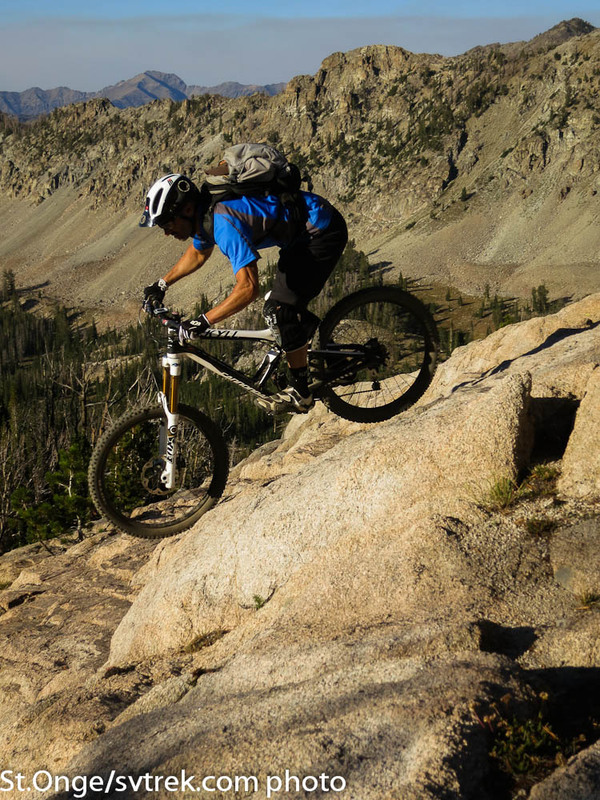 That has changed, and most locals and many visiting bikers are discovering this zone. 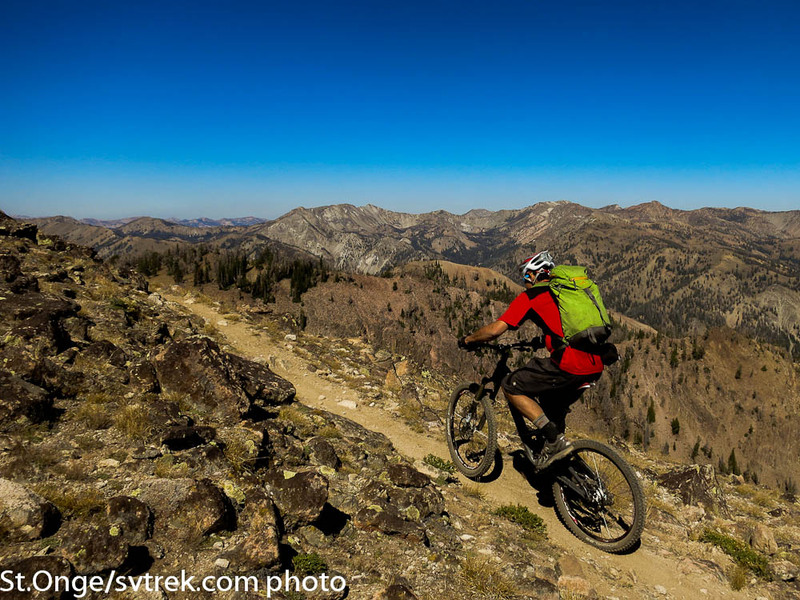 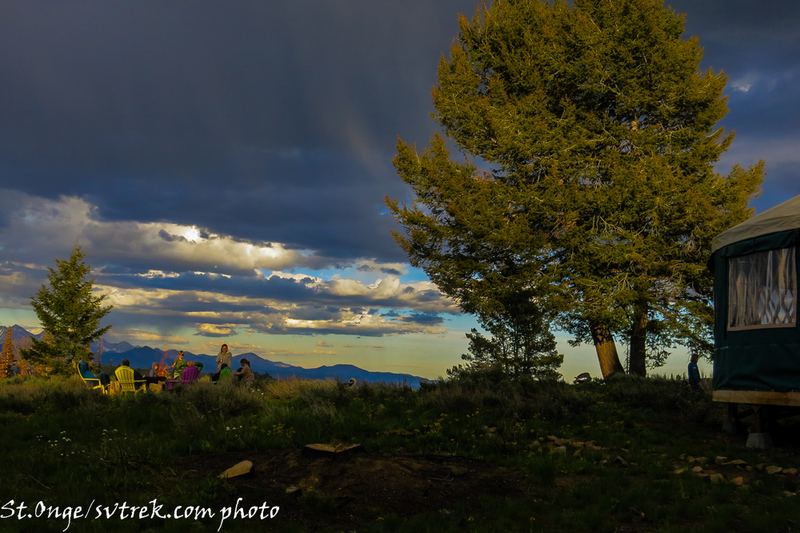 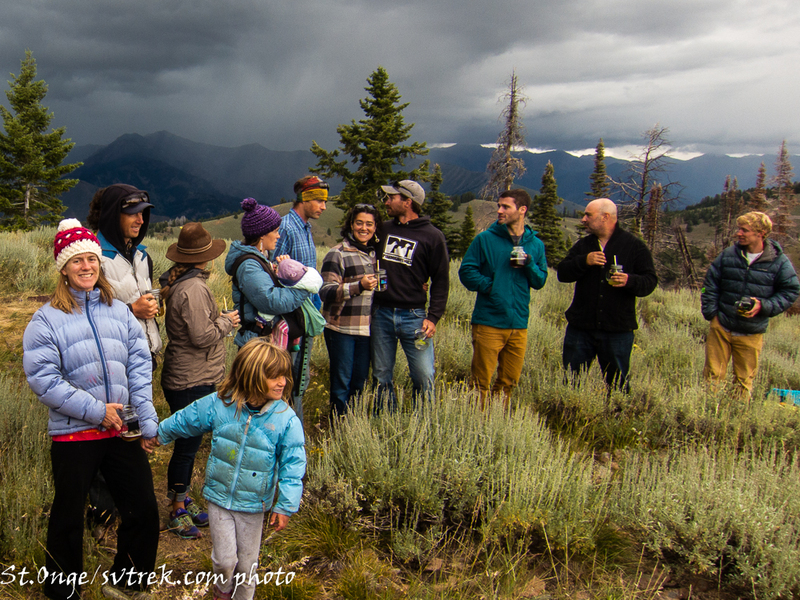 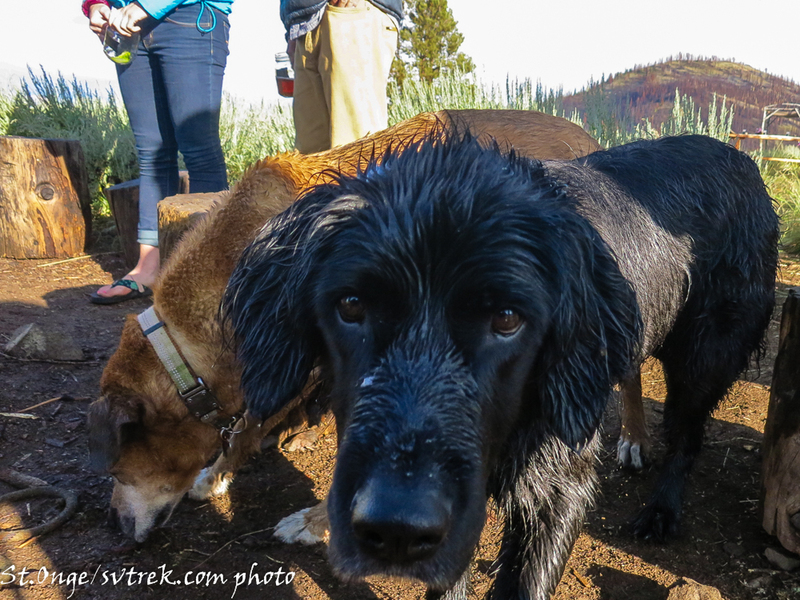 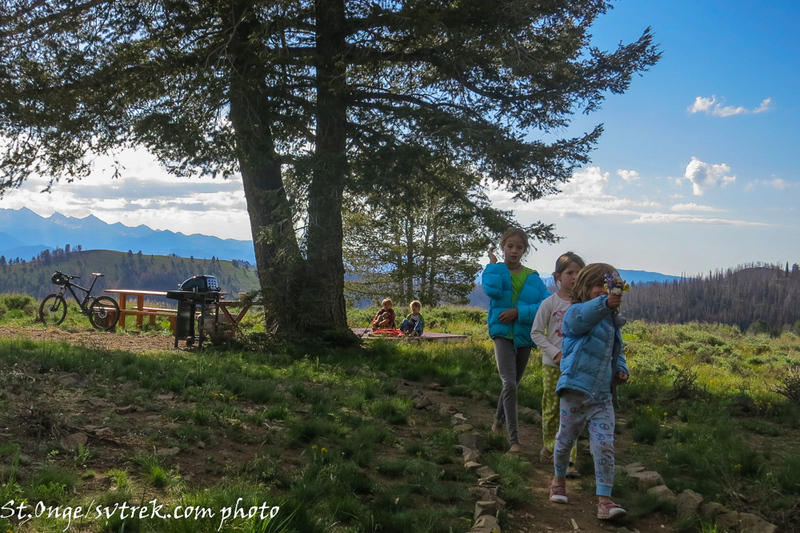 The Forest Service recently retrofitted one of the backbone trails (Warm Springs Ridge, now known as the Osberg Ridge Trail) to provide 12 miles of high, remote single track bliss and a connector to a myriad of other trails. 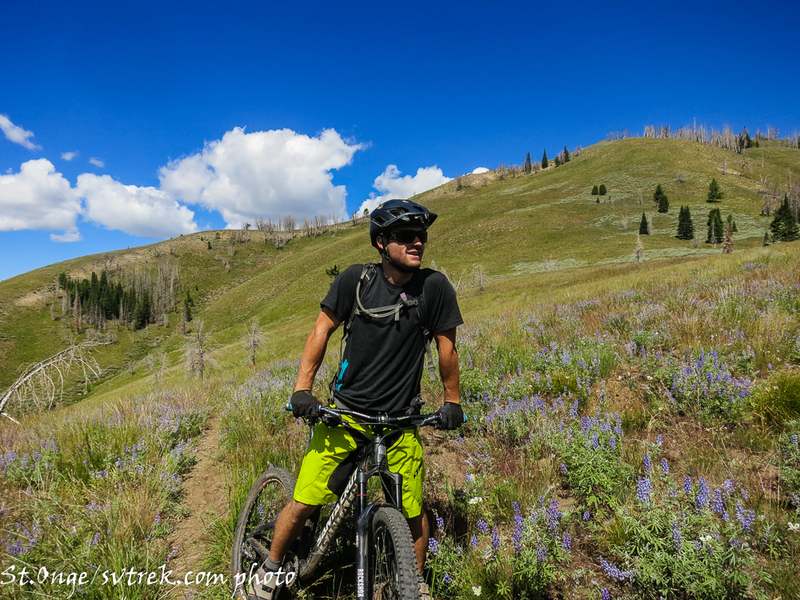 There is talk of building even more trails in this area in the future. 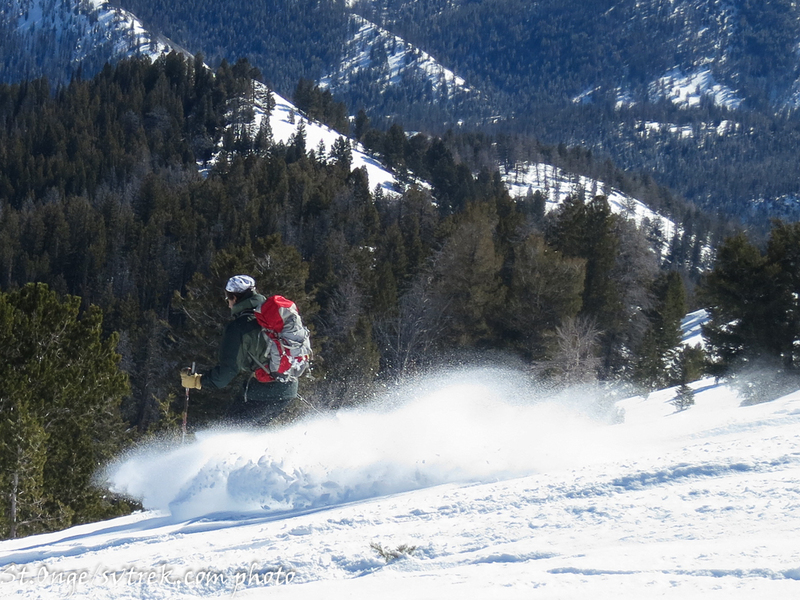 Ultimately, this trip was an opportunity to share what I consider to be among the best riding in the world with several very experienced and discerning riders. 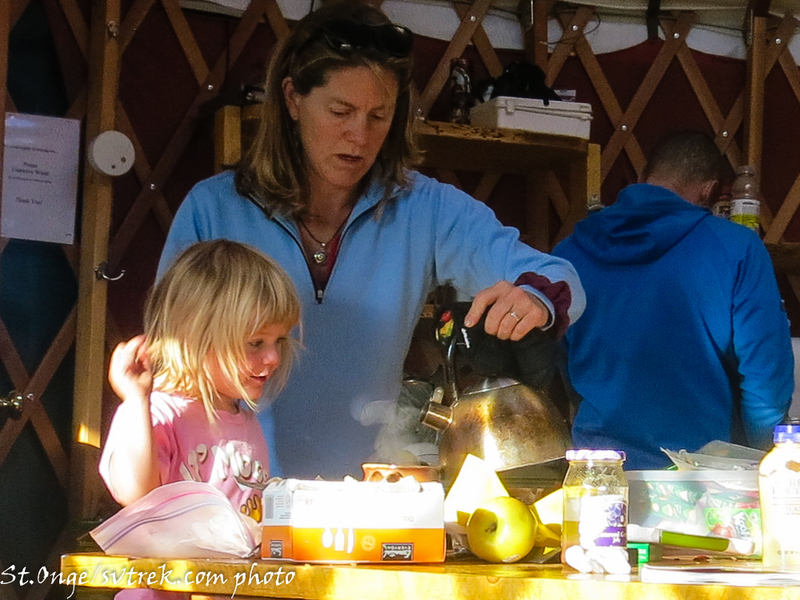 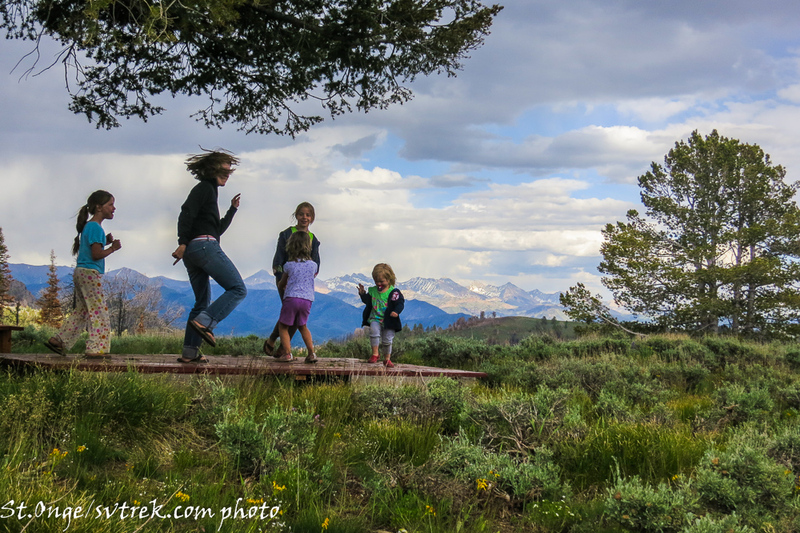 I was eager to see their reaction as we linked close to 200 miles of single track from our yurt home. 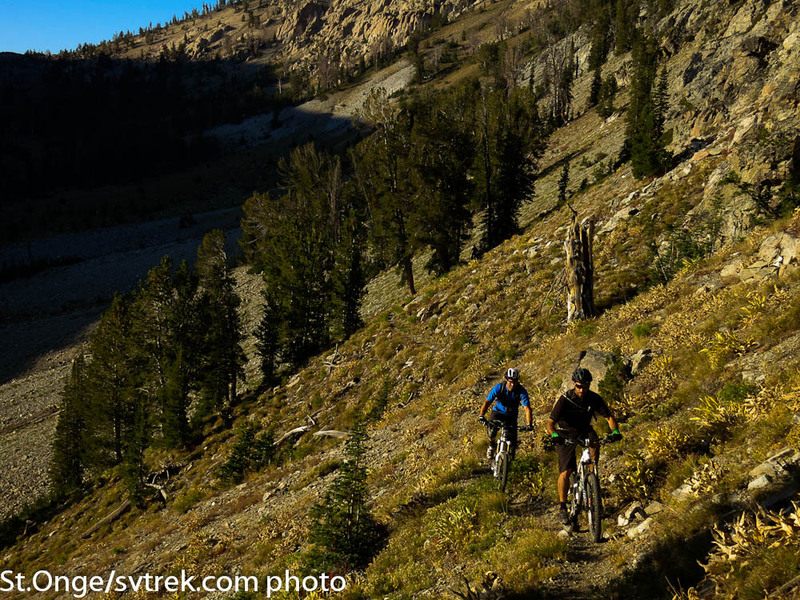 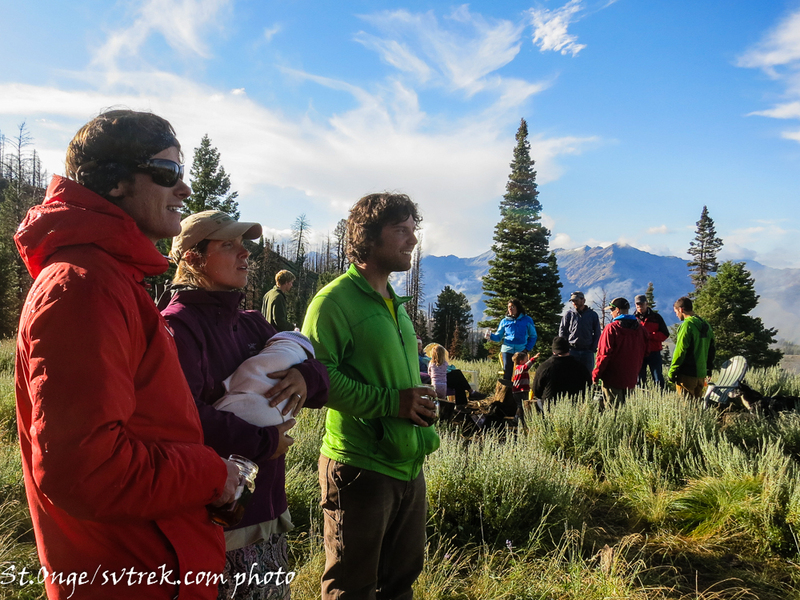 The pure stoke we shared day after day of riding was a tremendously gratifying experience. 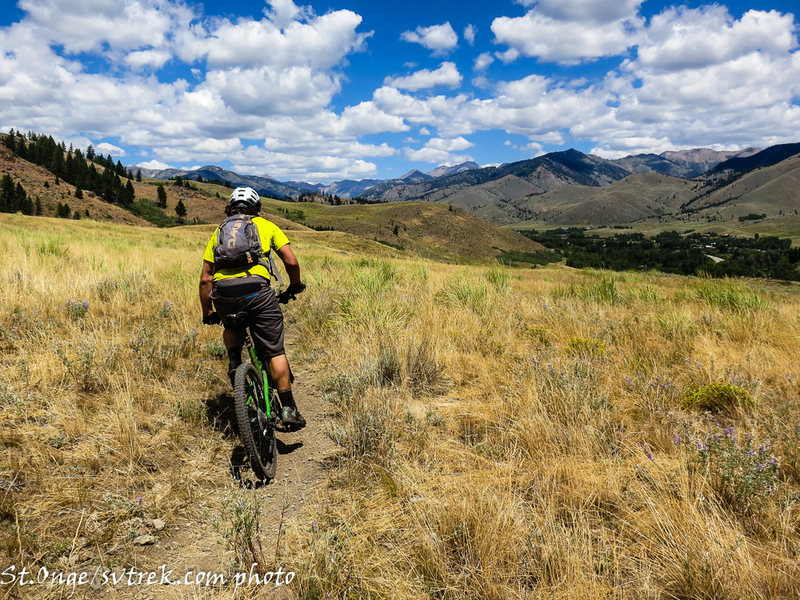 But, upon reflection, the most remarkable thing about our adventure was the paradigm shift in my own perspective on biking. 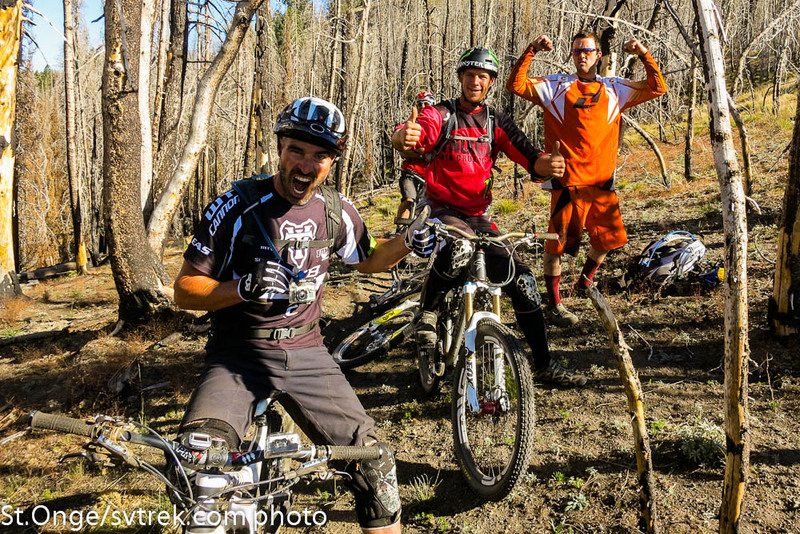 To watch these guys visualize and then ride a section of single track was truly awesome. 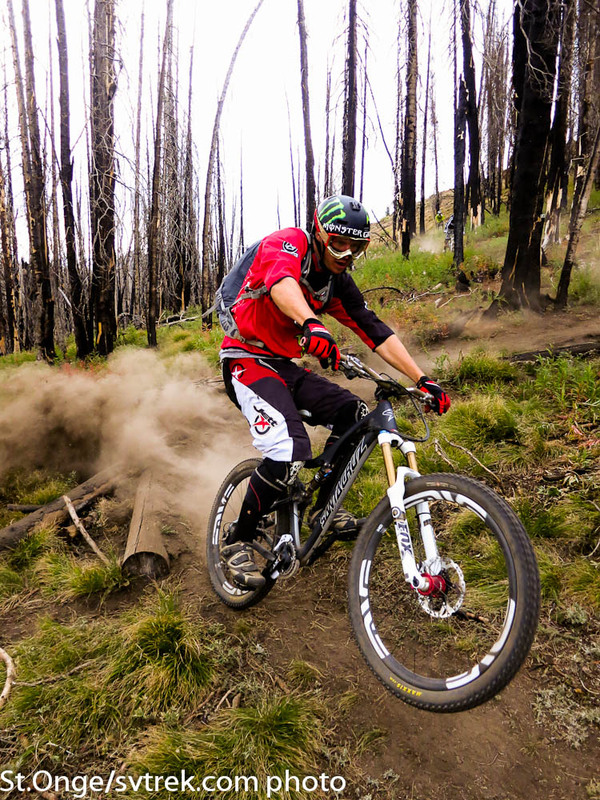 And while these trails are familiar to me, the style that each would ride opened my eyes to how a bike can be ridden. 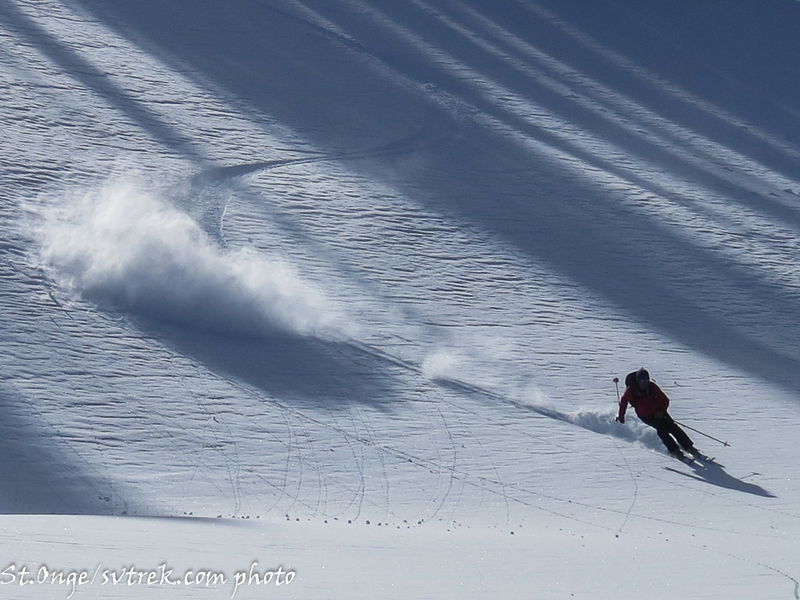 Full commitment and ultimate skill were paired with a machine of engineered perfection in a land of splendor. 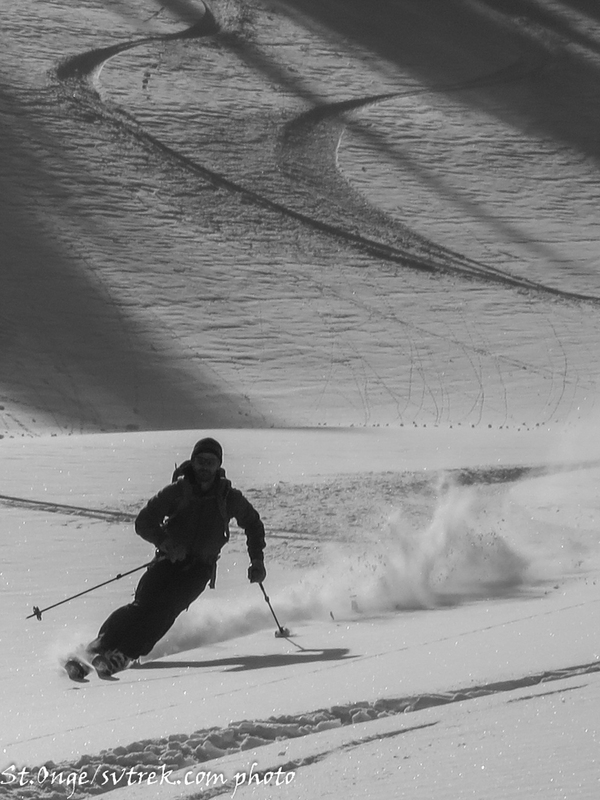 Like a ski, the bike can be an instrument of art, linking landscapes in a fluid and poetic manner. 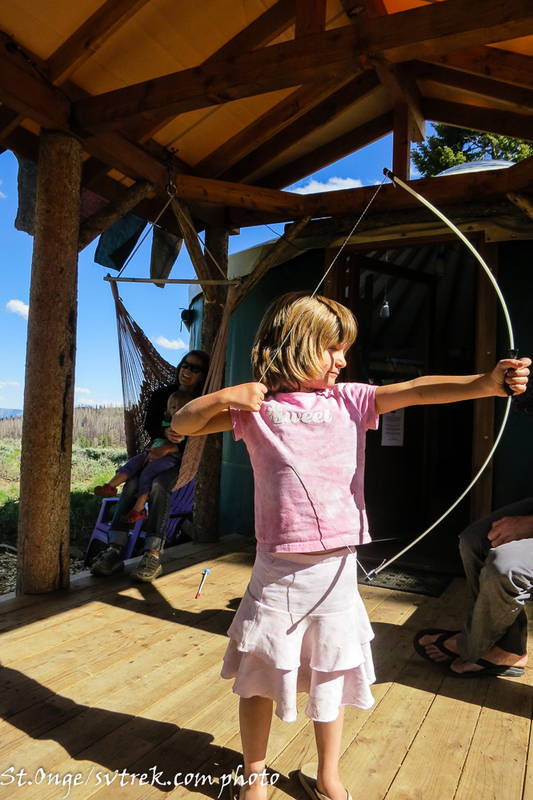 I have witnessed what can be done, and now I have the inspiration to try to actualize it, if I can just avoid the snakes. 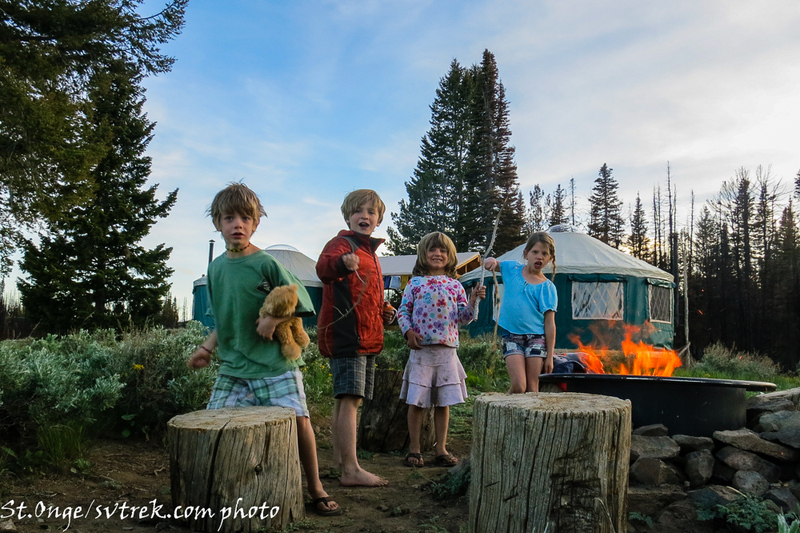 Burnin’ Fun at the new Coyote Yurts! 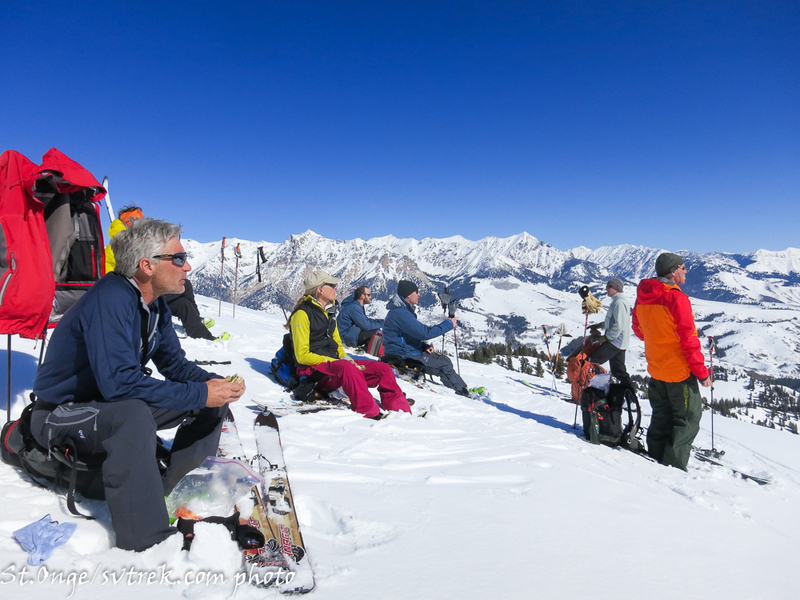 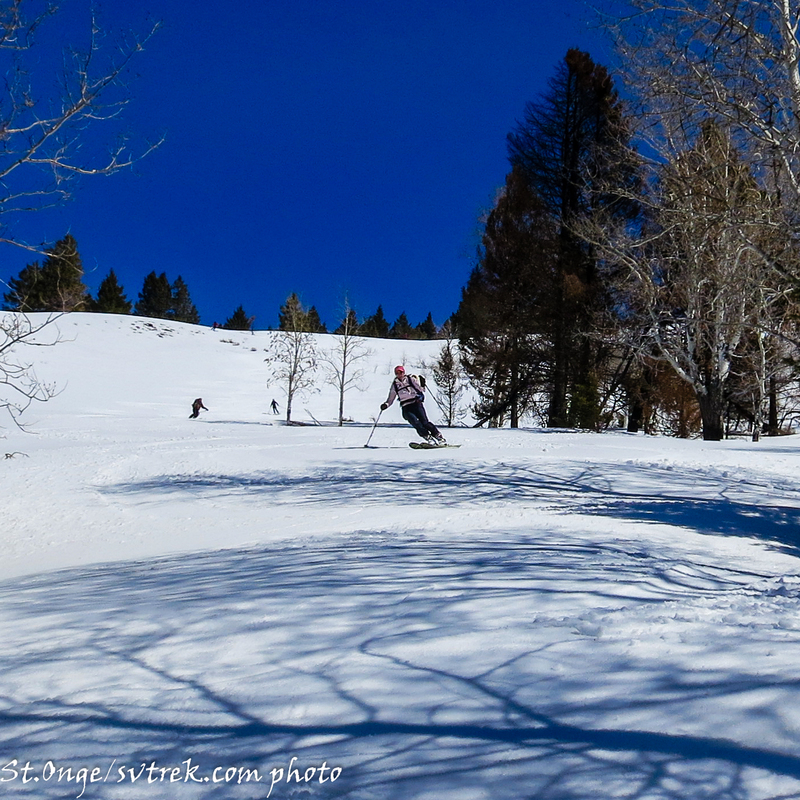 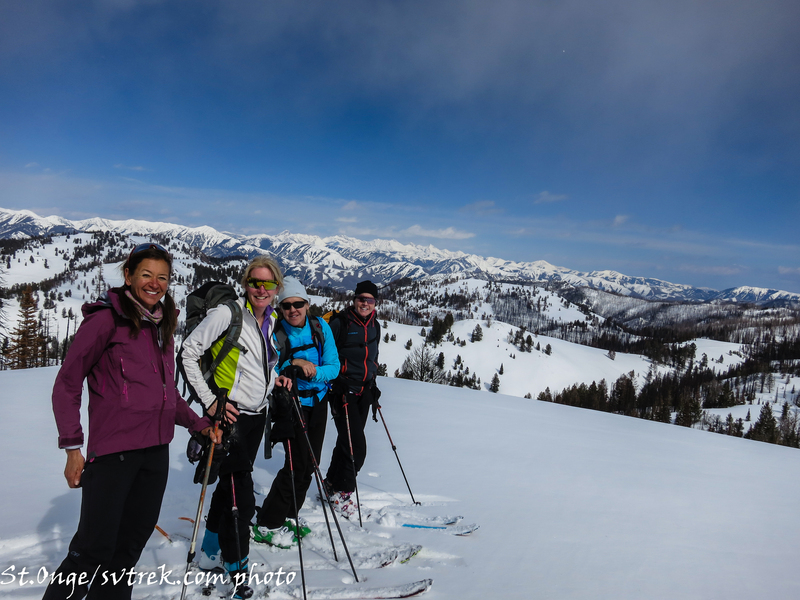 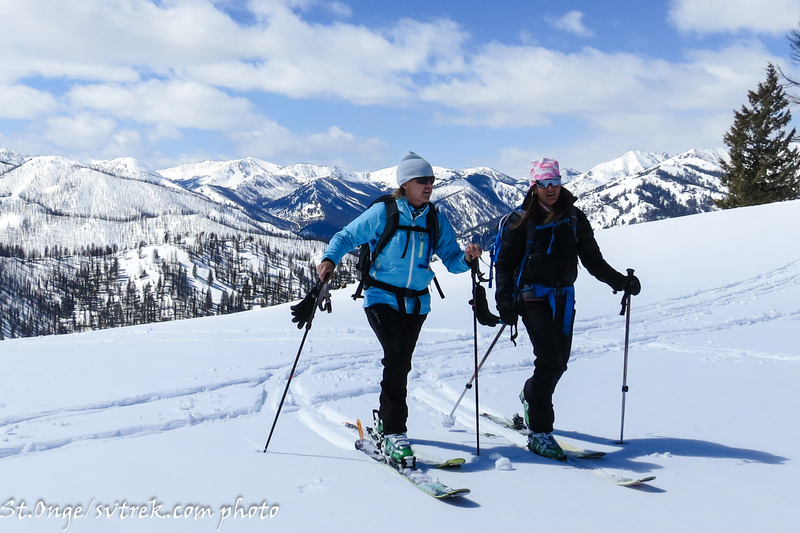 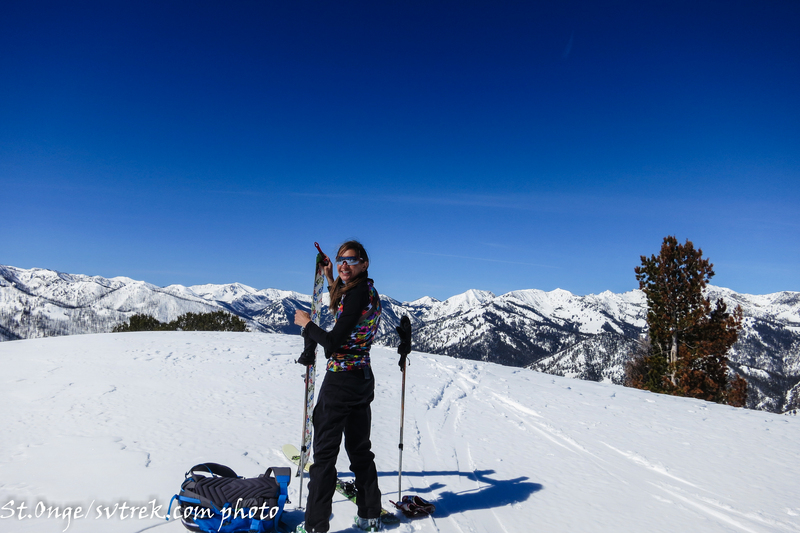 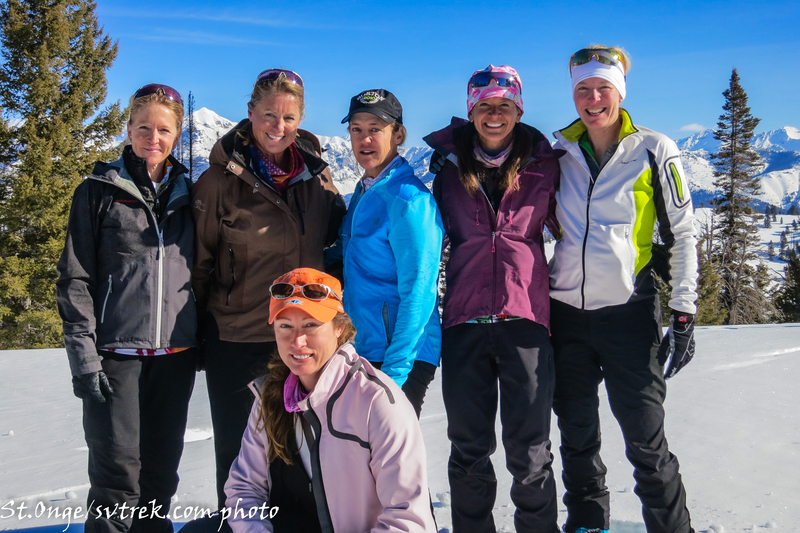 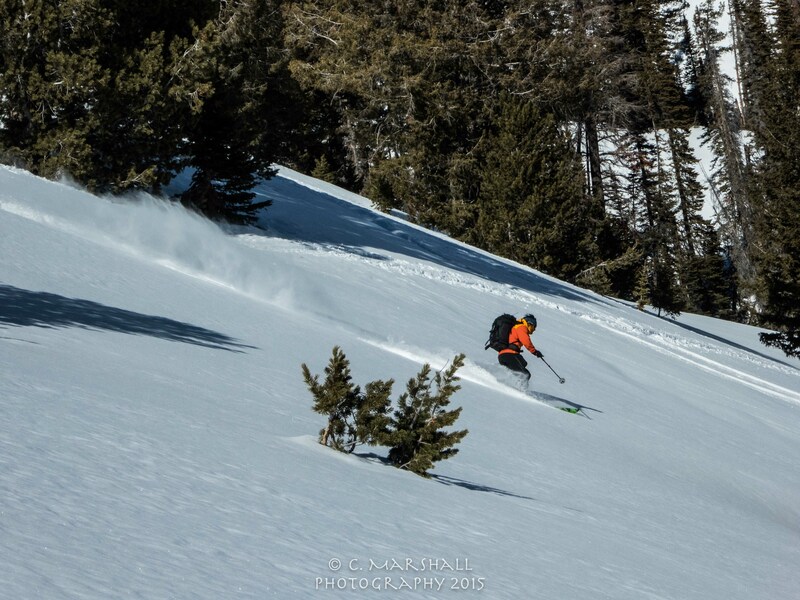 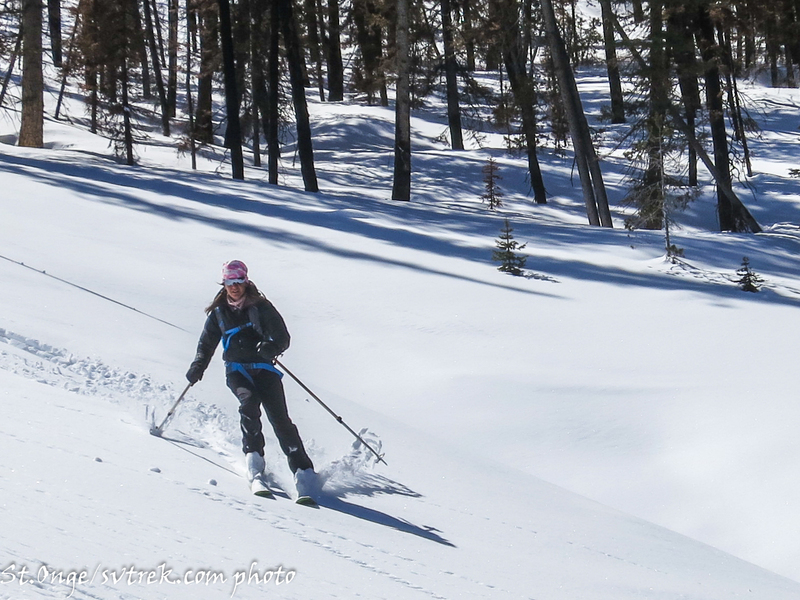 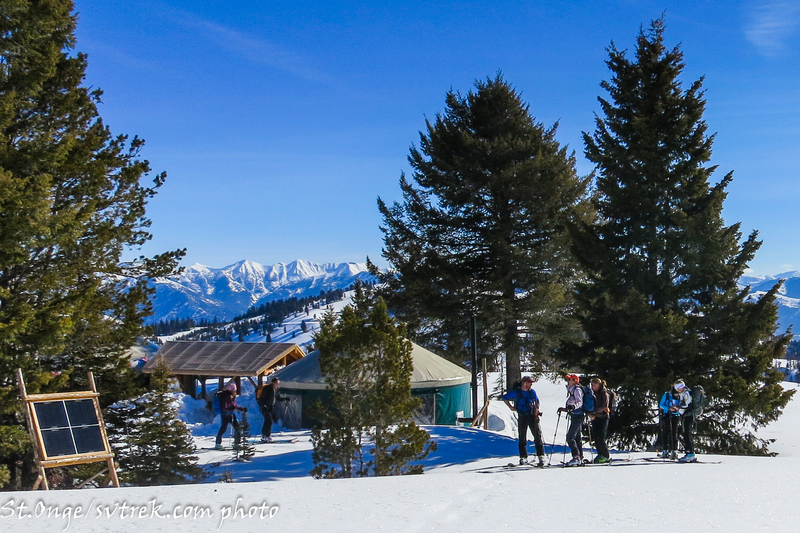 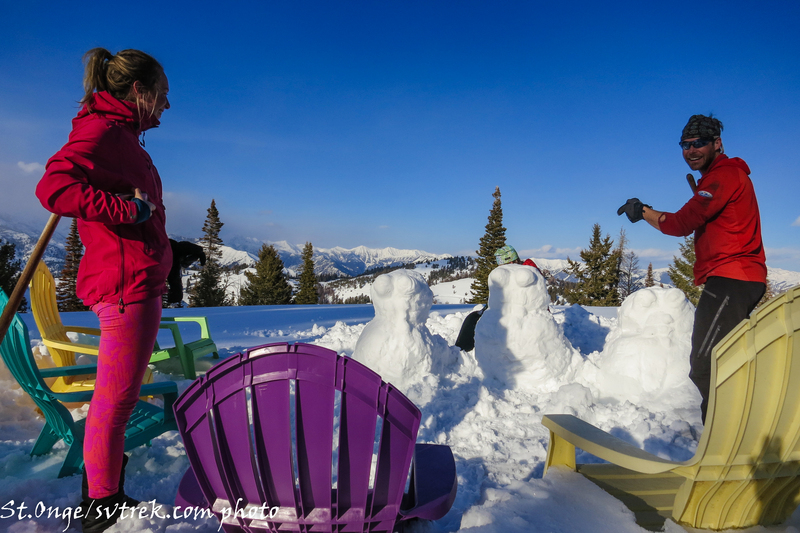 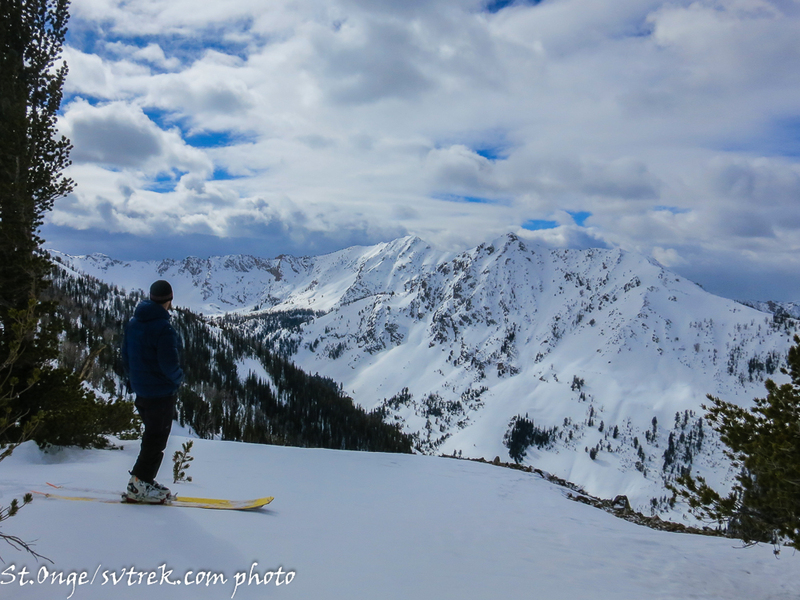 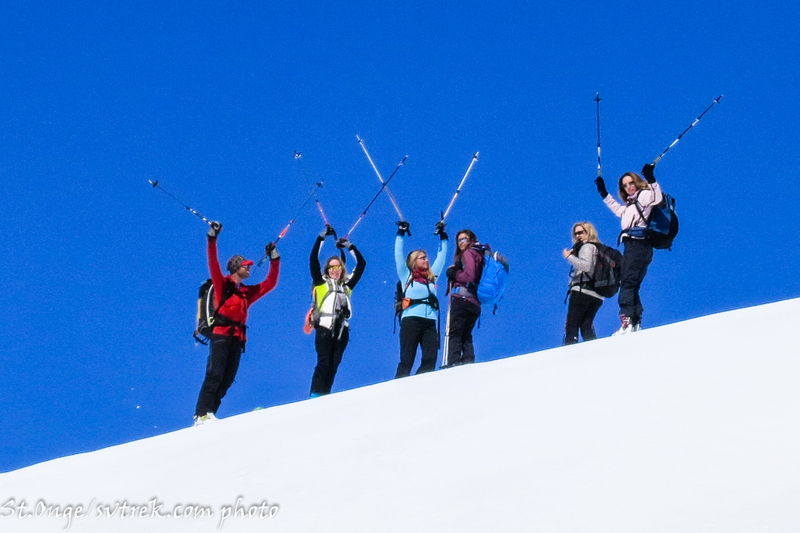 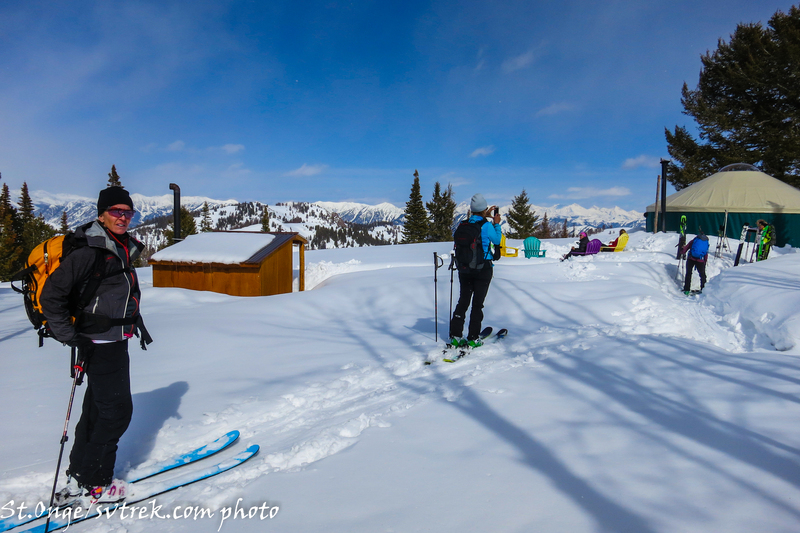 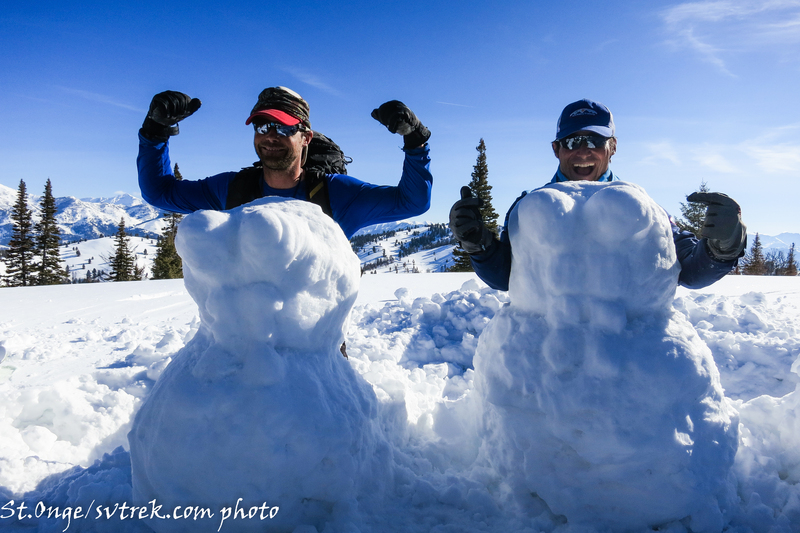 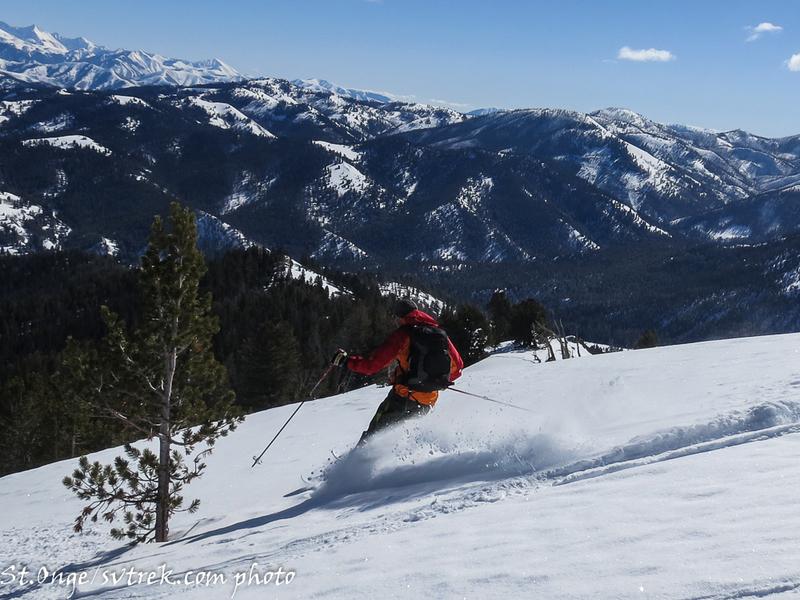 Wow, what a great 3 days of spring skiing at the new Coyote Yurts! 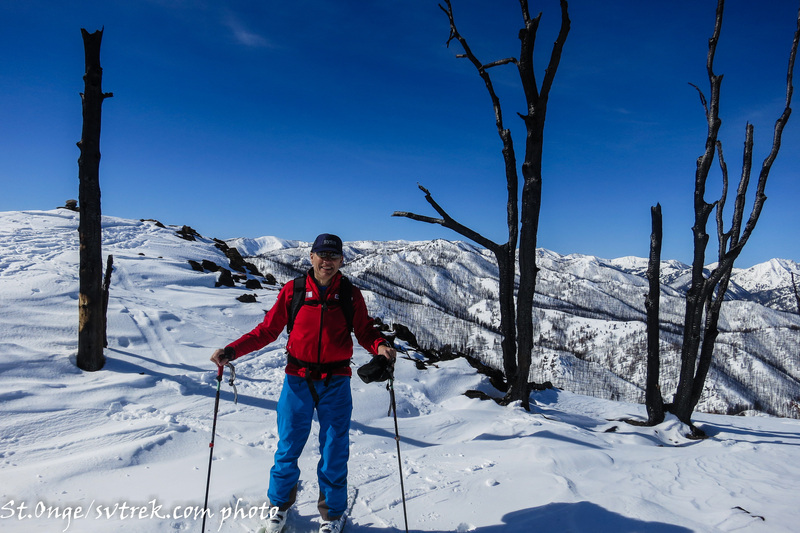 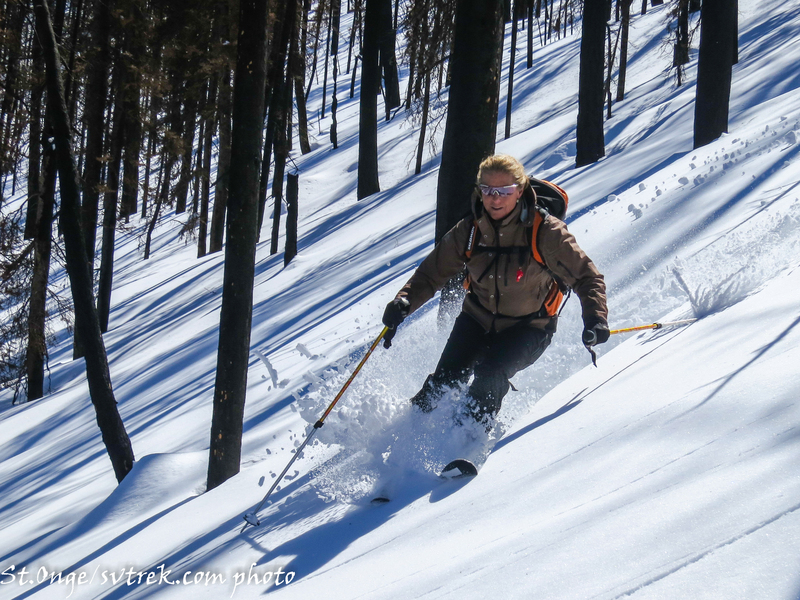 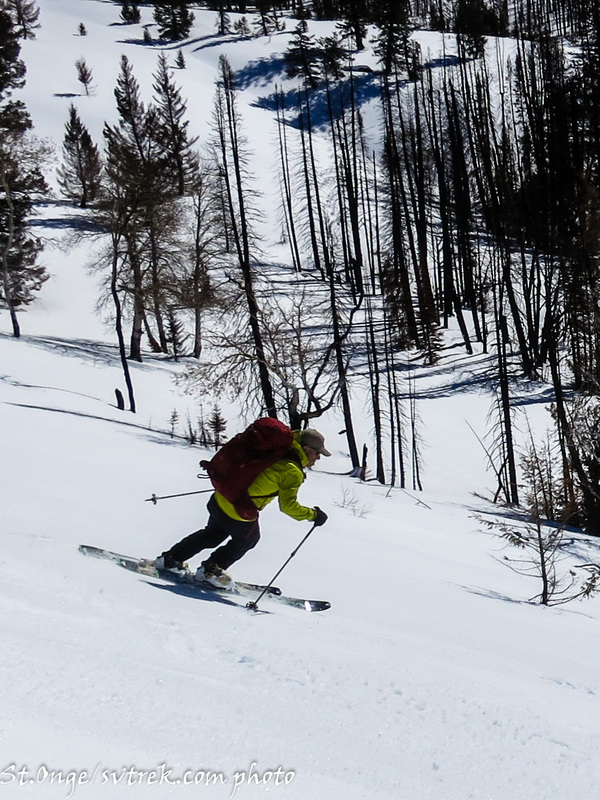 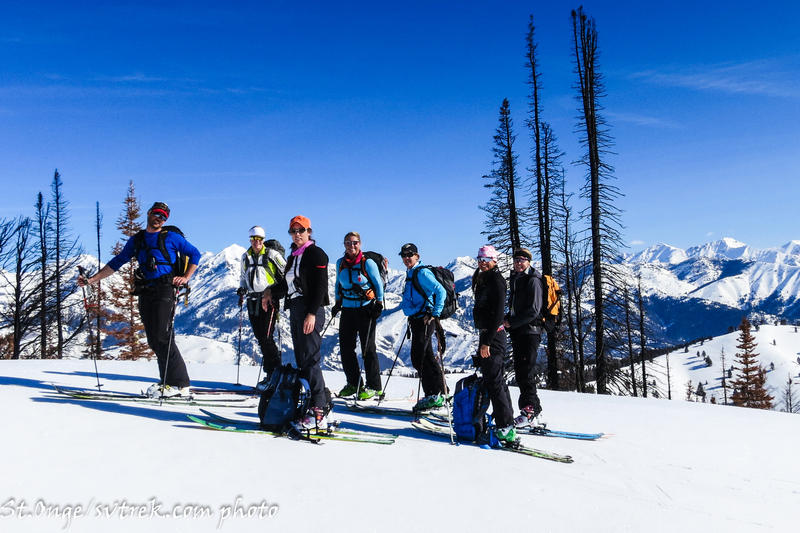 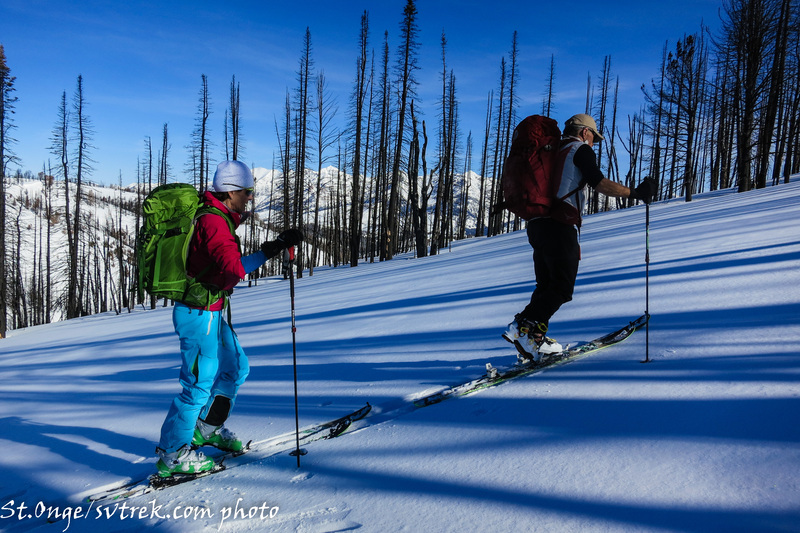 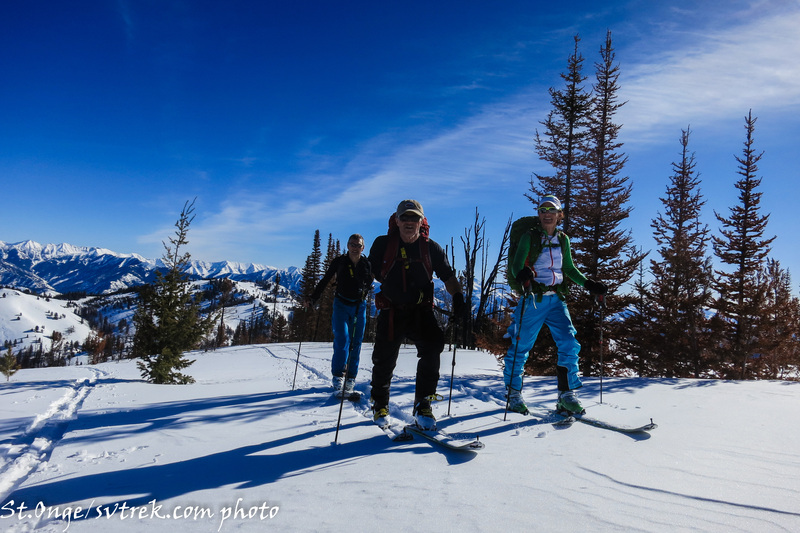 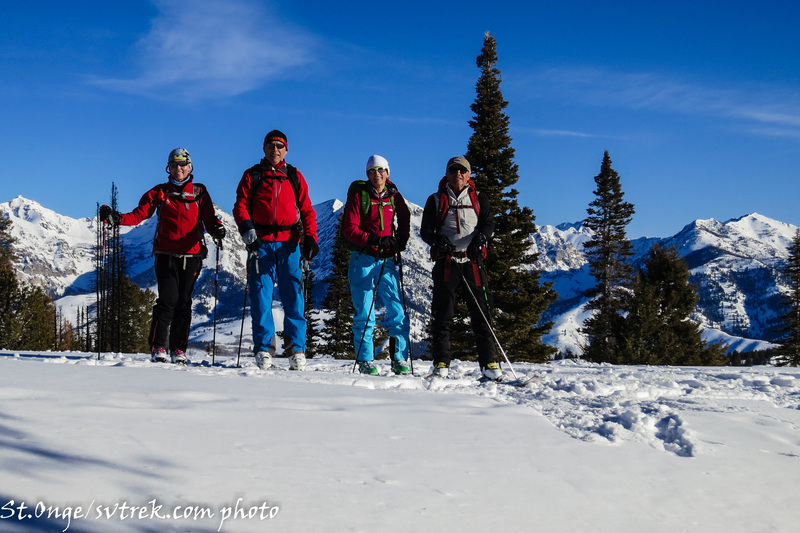 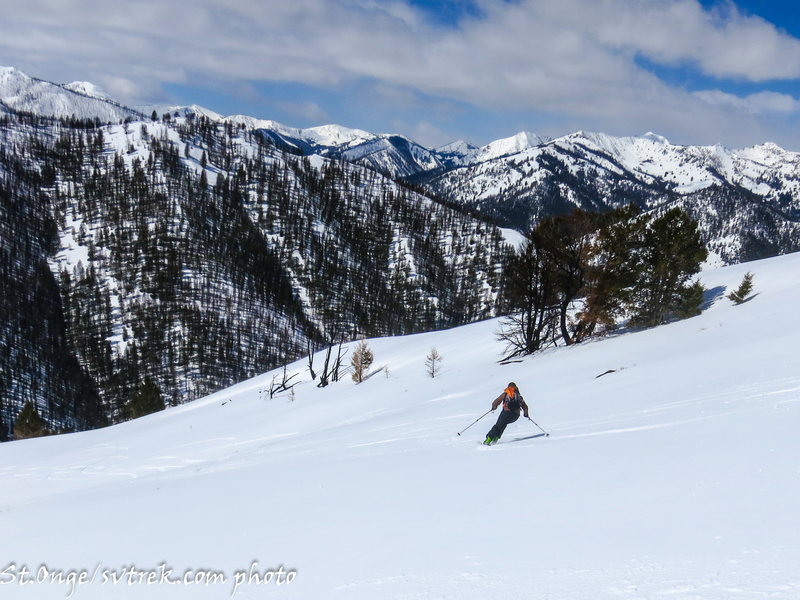 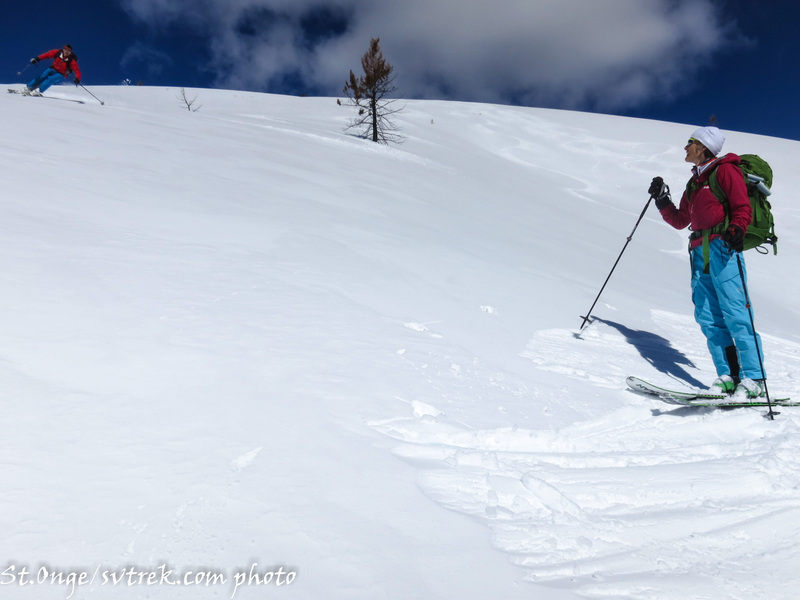 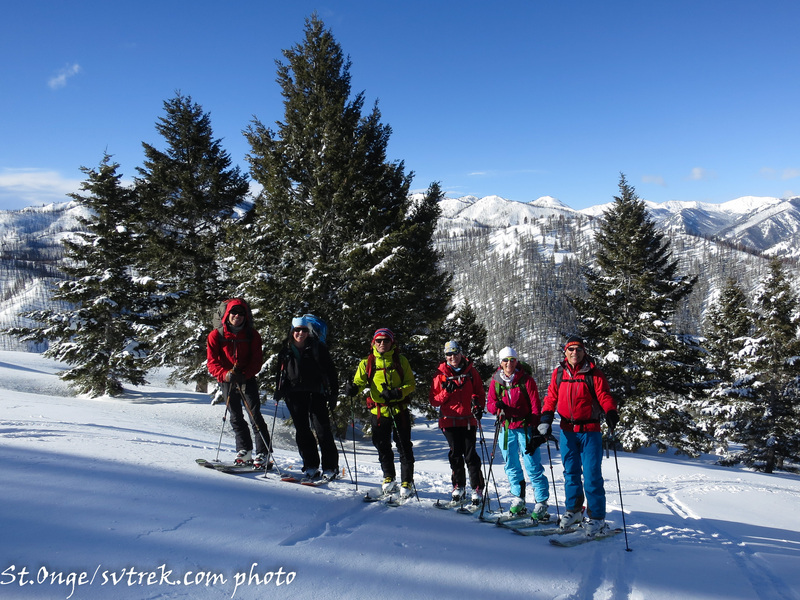 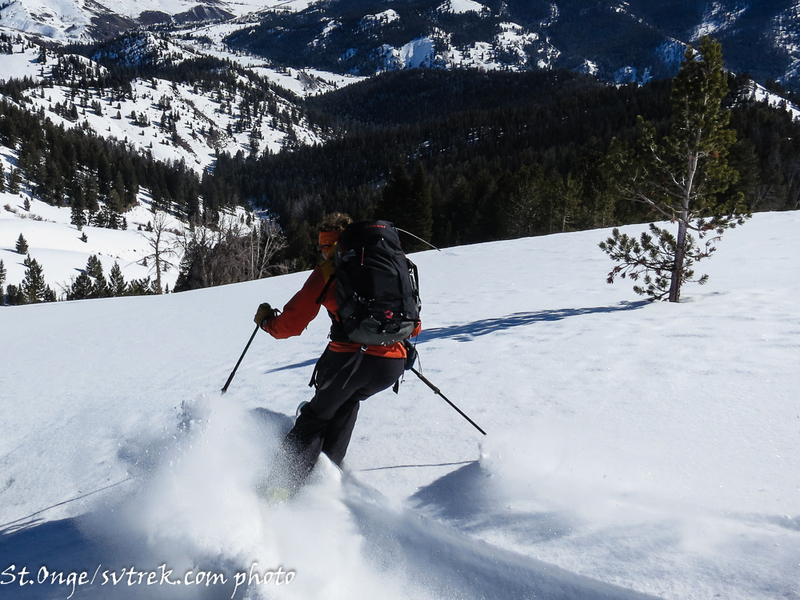 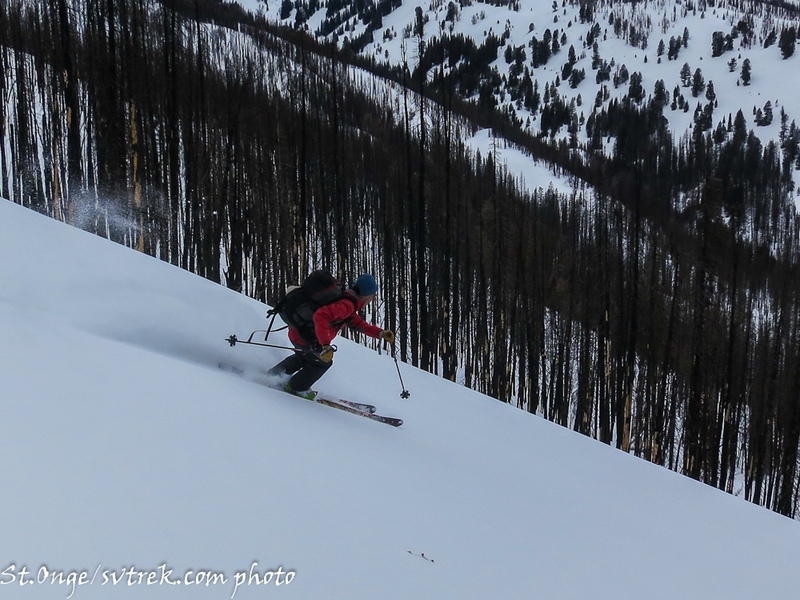 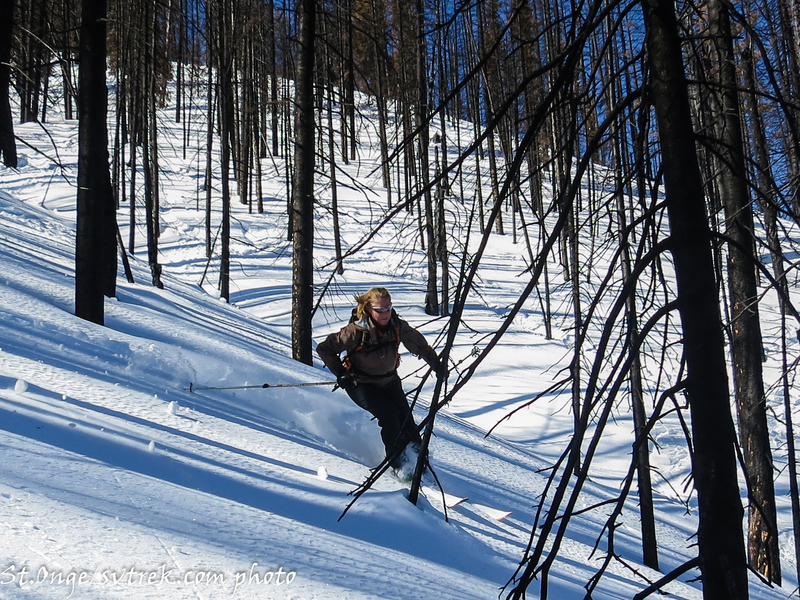 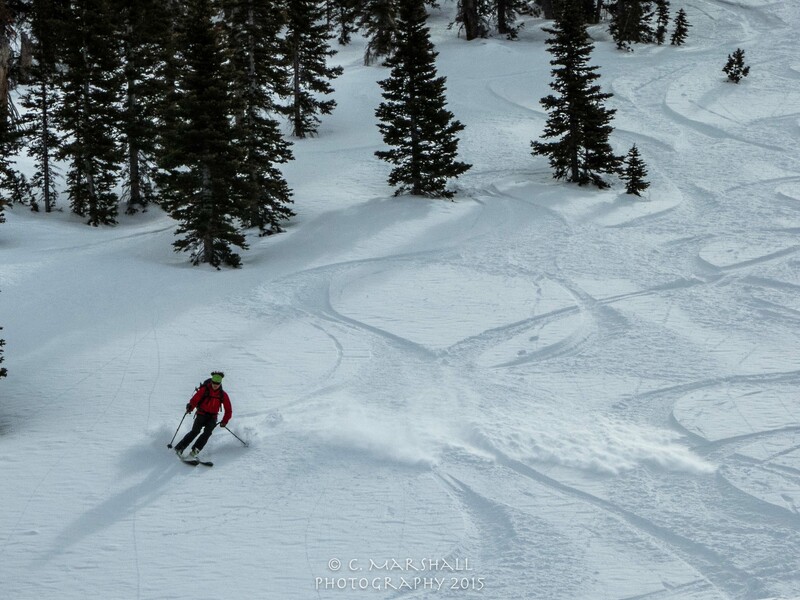 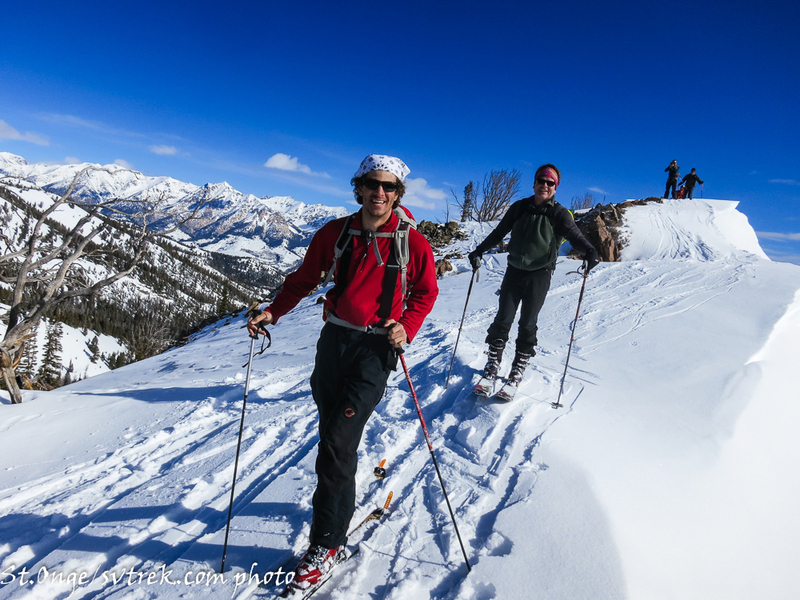 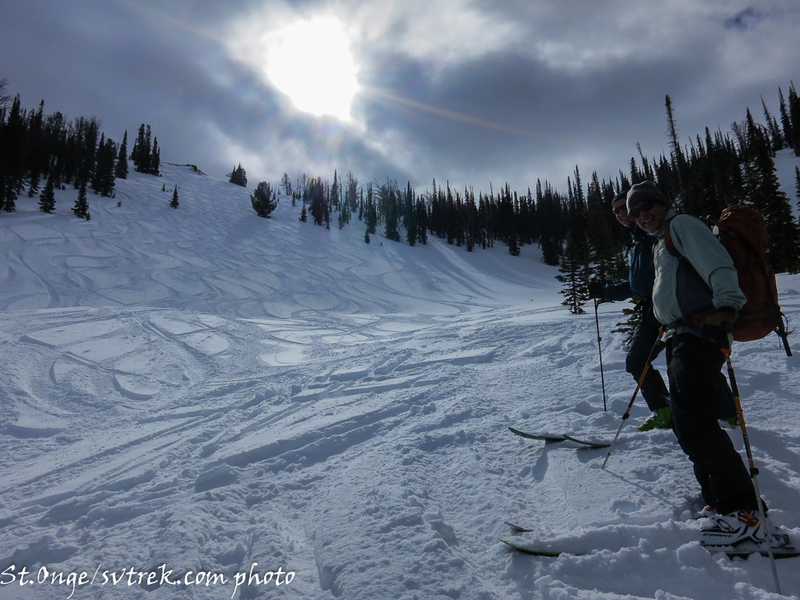 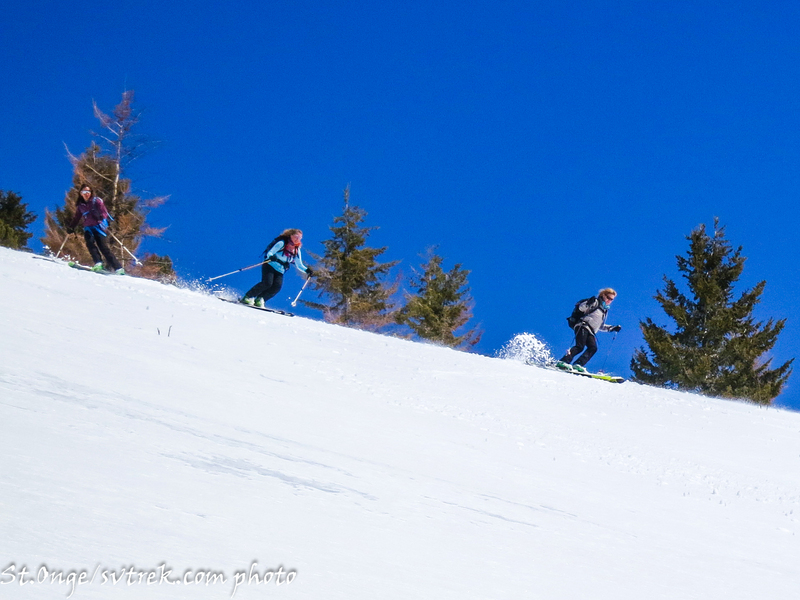 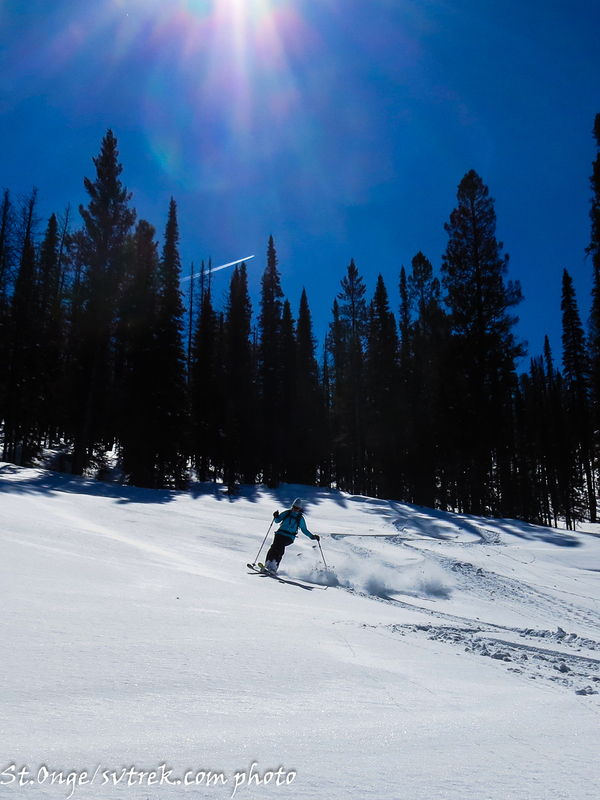 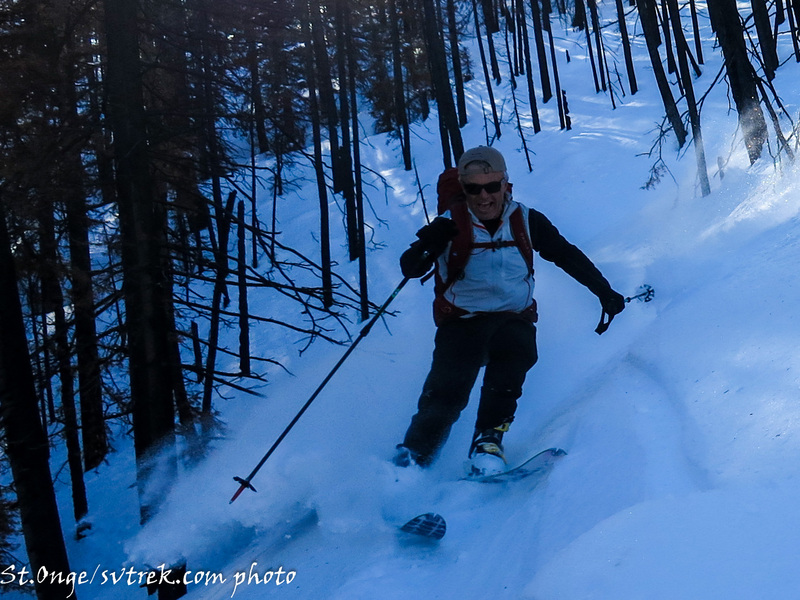 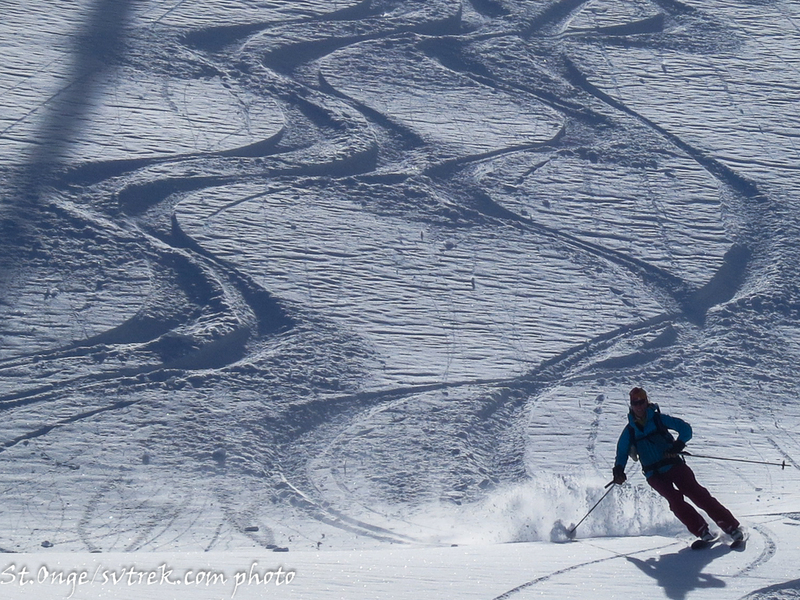 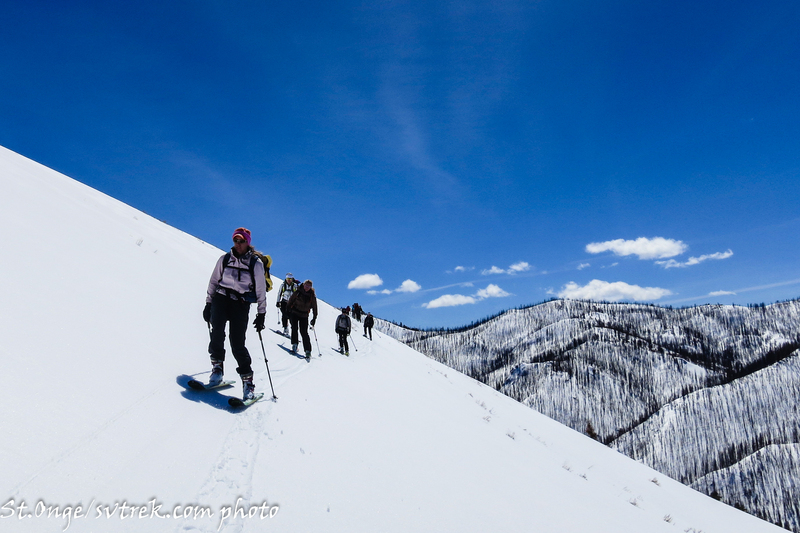 Bob and Kate (from our local backcountry ski shop: the Elephant’s Perch) joined our Canadian friends, Bernard and Sheri, for an action packed 3 days exploring the new burn skiing around Coyote with Joe. 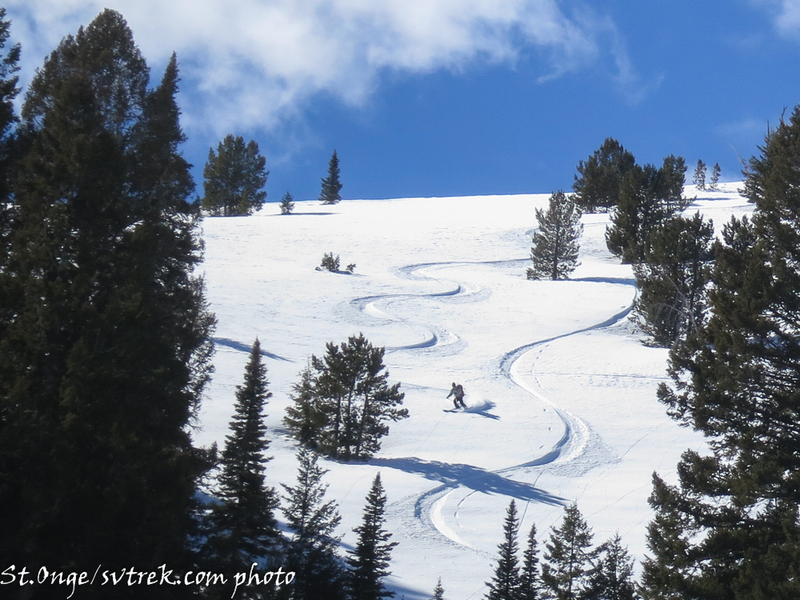 Splitter blue sky days made for an amazing backdrop of peaks, powder, corn and shadow lined burn skiing. 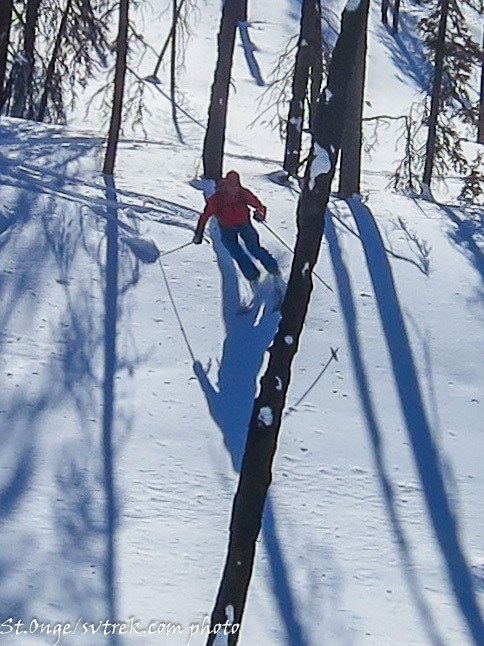 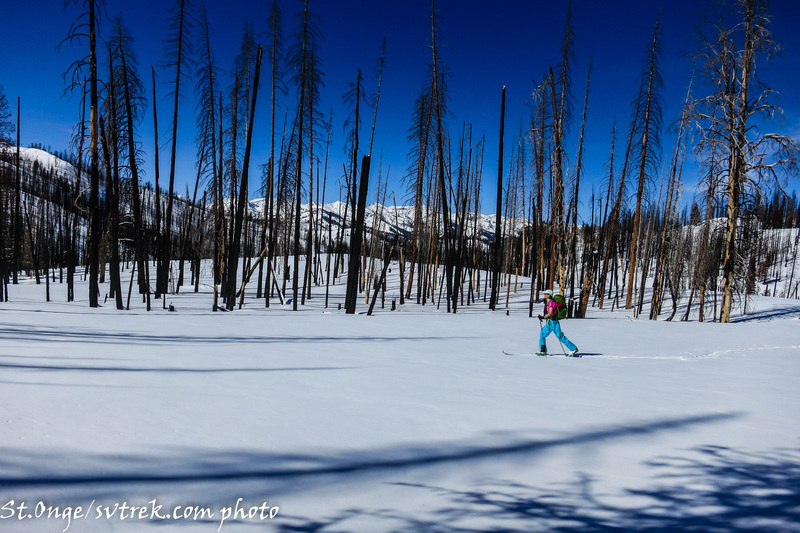 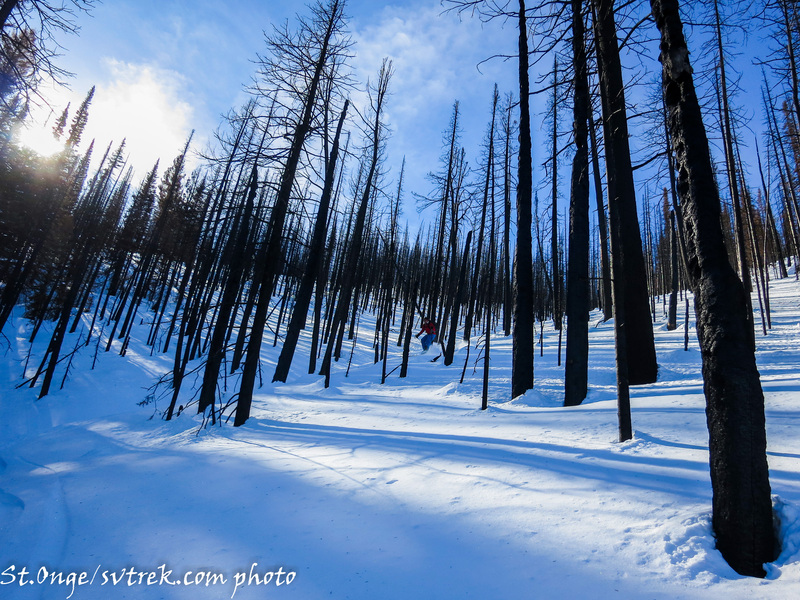 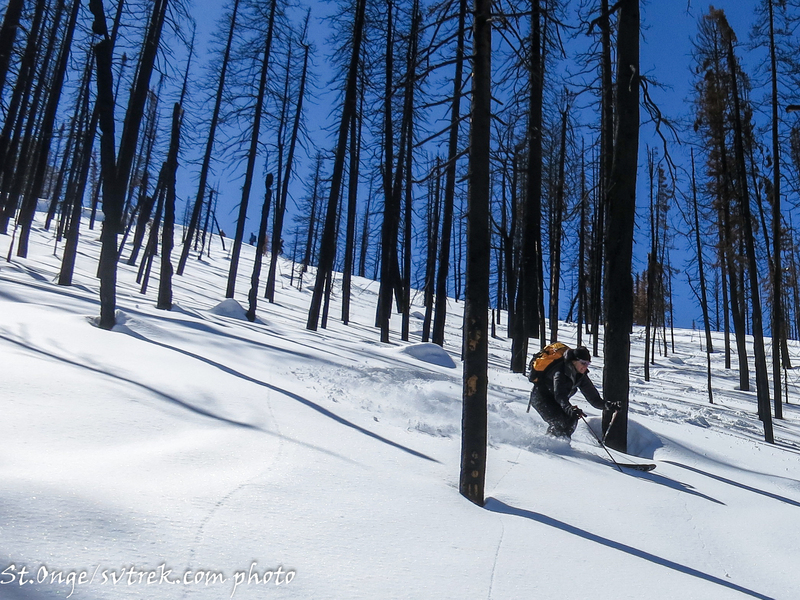 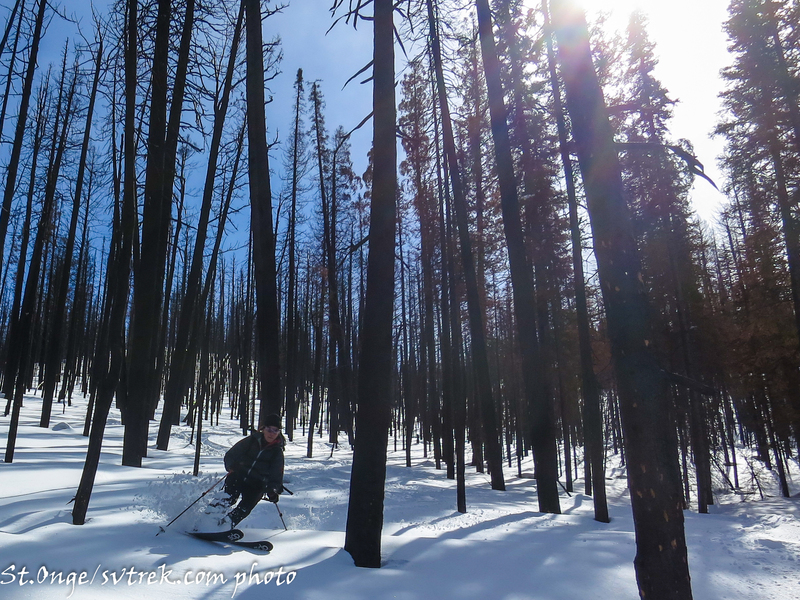 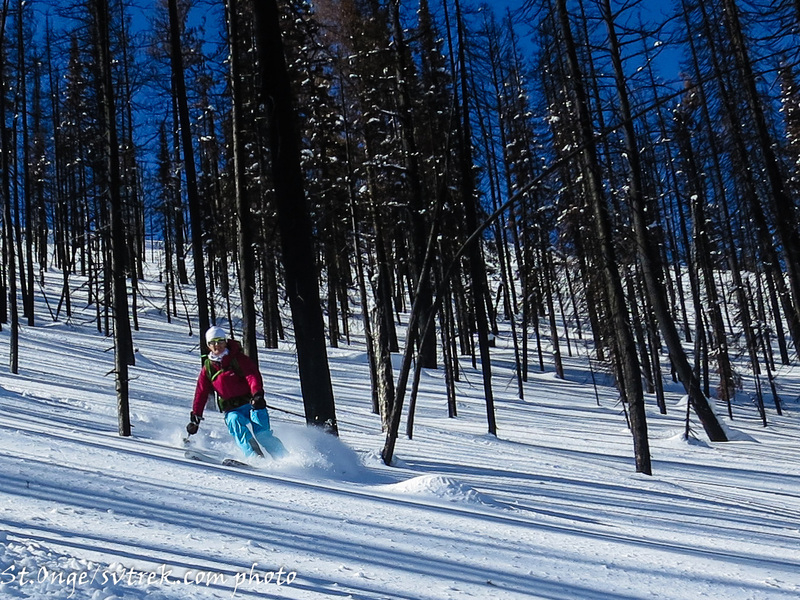 We barely scratched the surface of the new north facing burned timber skiing possible and we skied a lot! 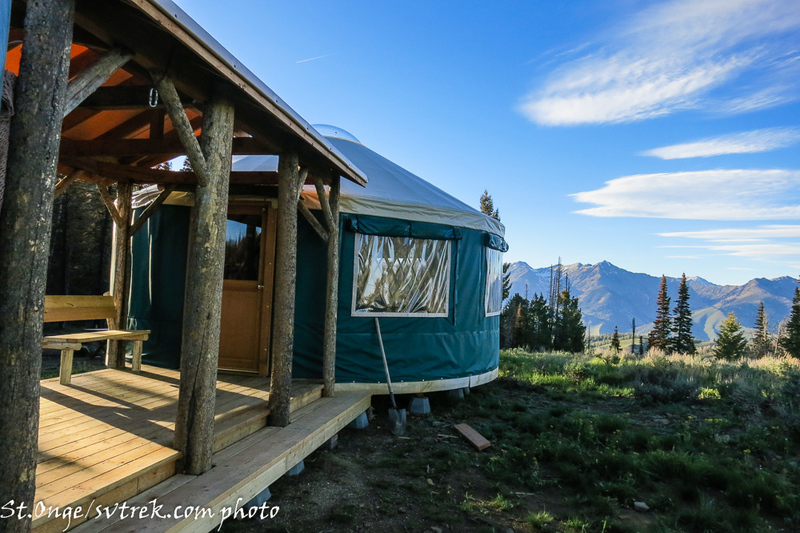 Oh yeah, the new Yurts are awesome too! 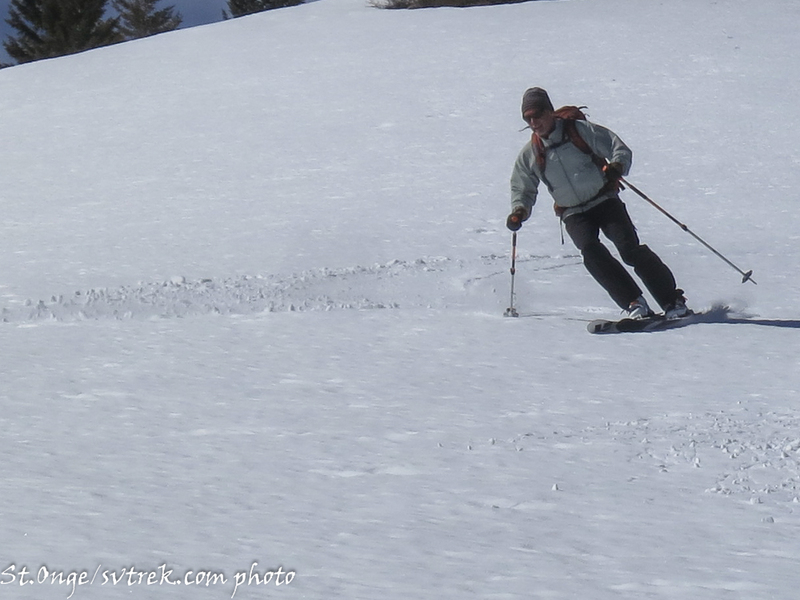 yep, Bob thinks it skis pretty good!